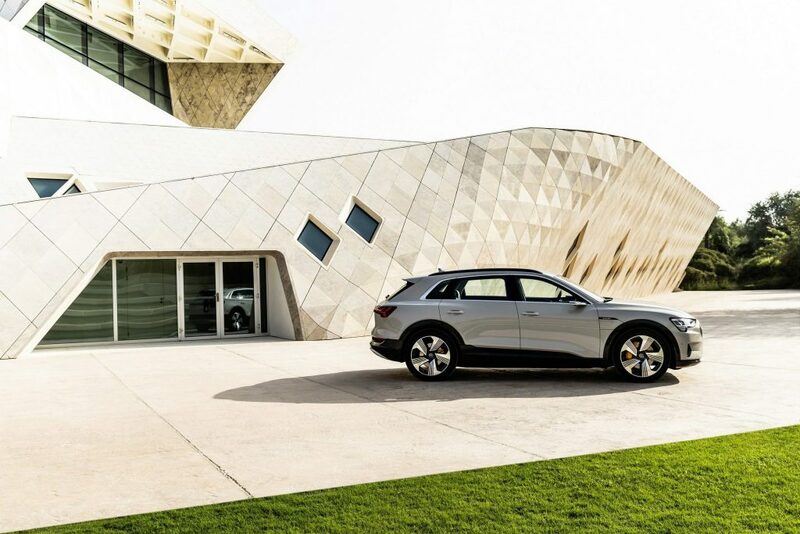 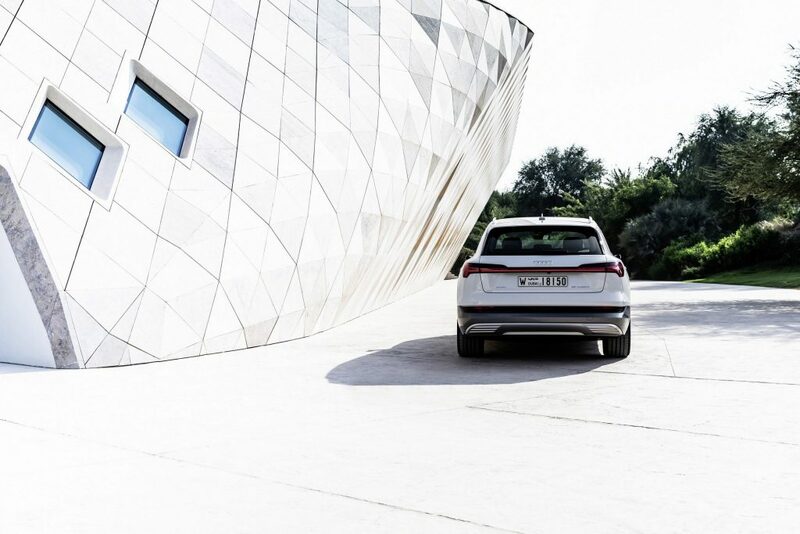 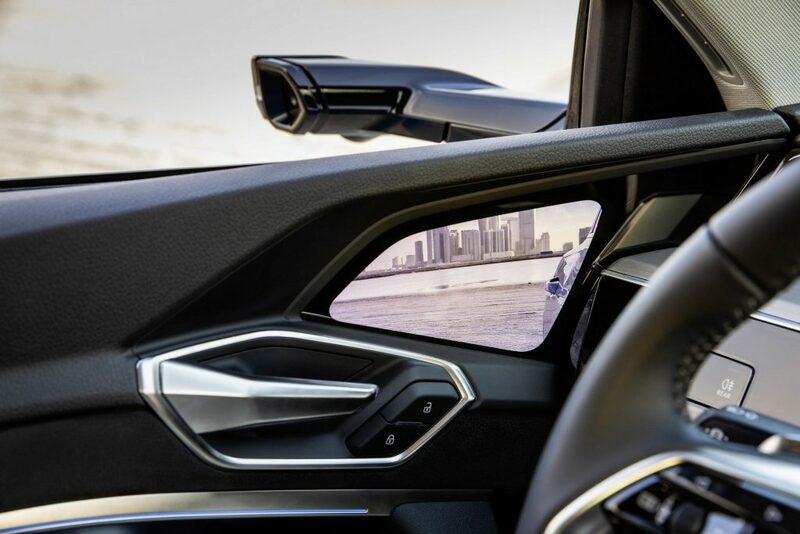 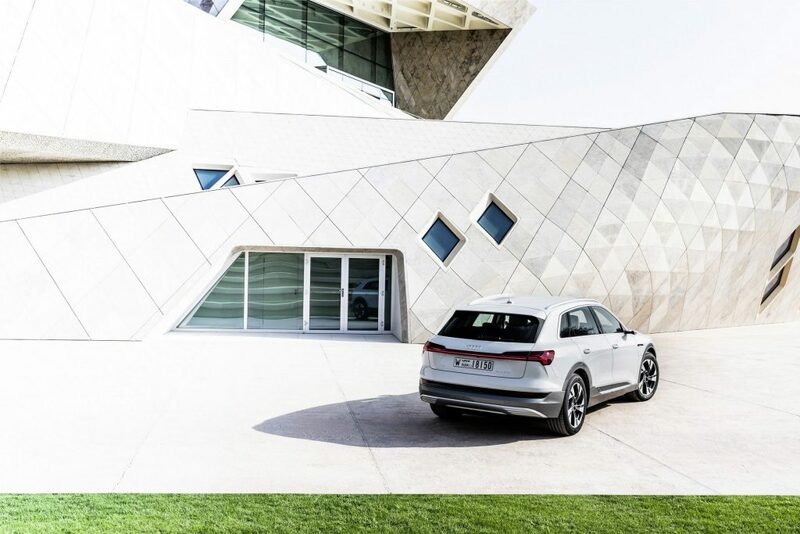 Efficiency, performance and quiet tranquility – the Audi e-tron exemplifies the driving experience of a new era. 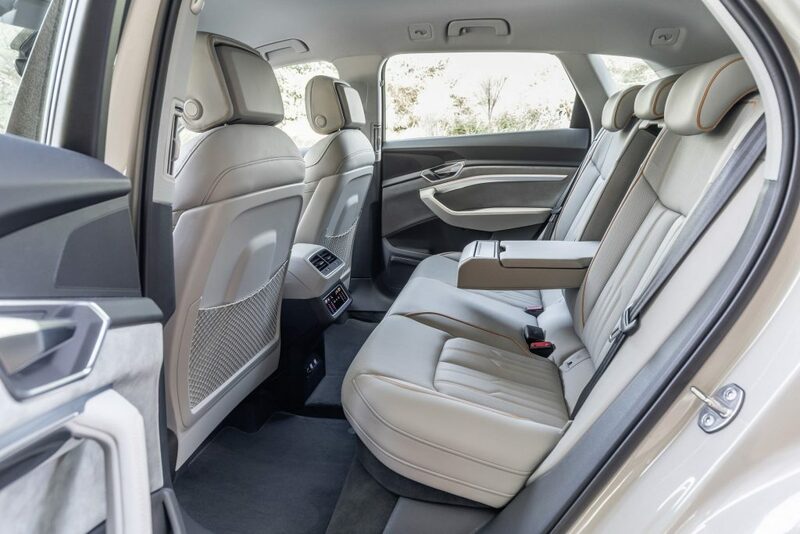 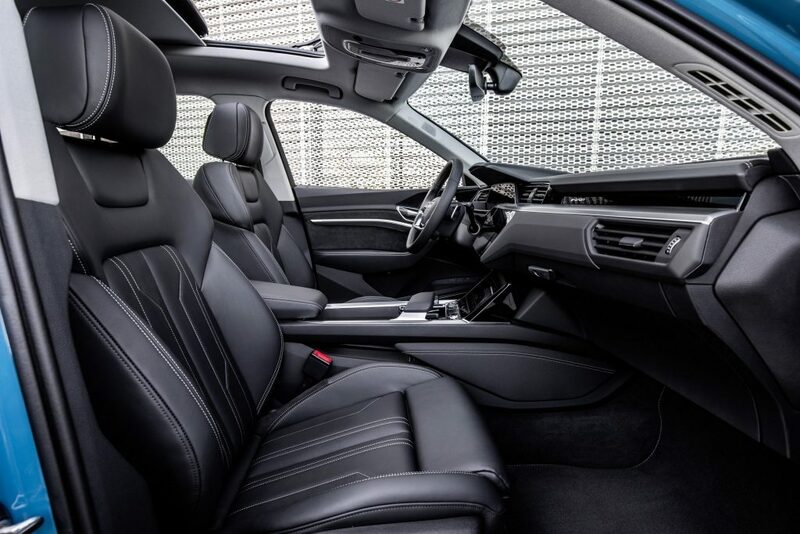 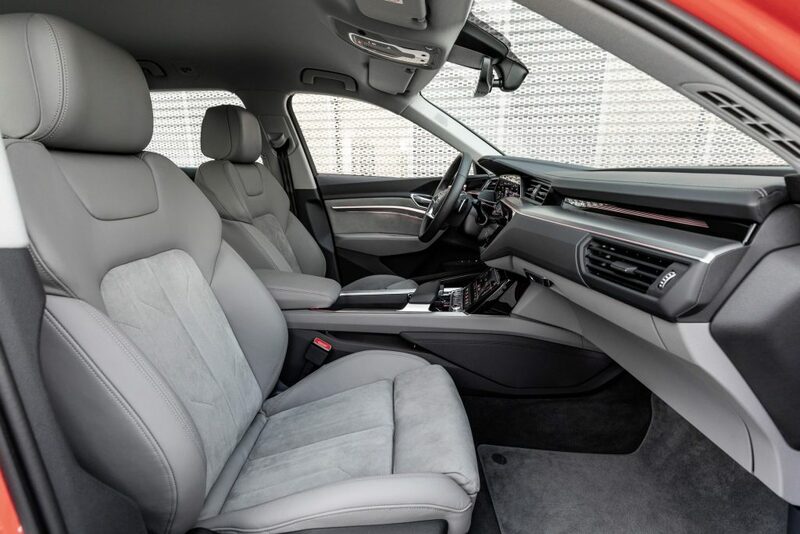 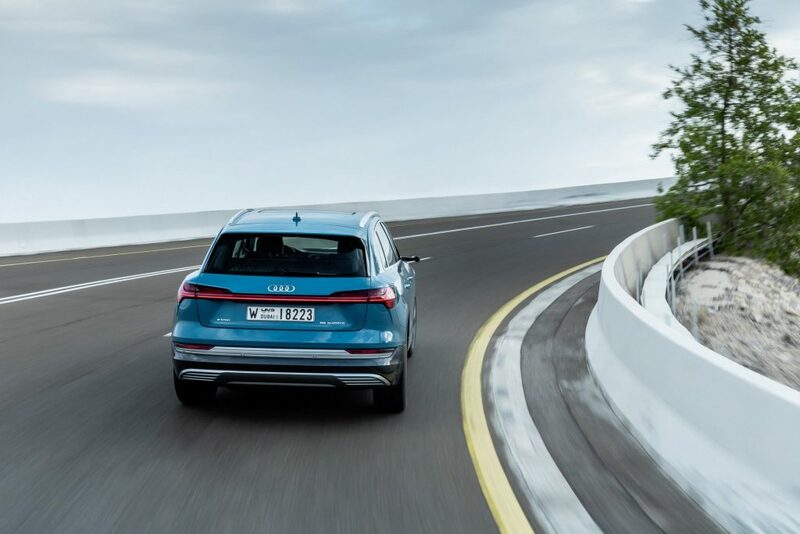 It combines the everyday requirements of a car and the comfort of the full-size class with an emission-free drive system – at the same time offering the premium experience that is expected from the brand with the four rings, with additional innovative highlights. 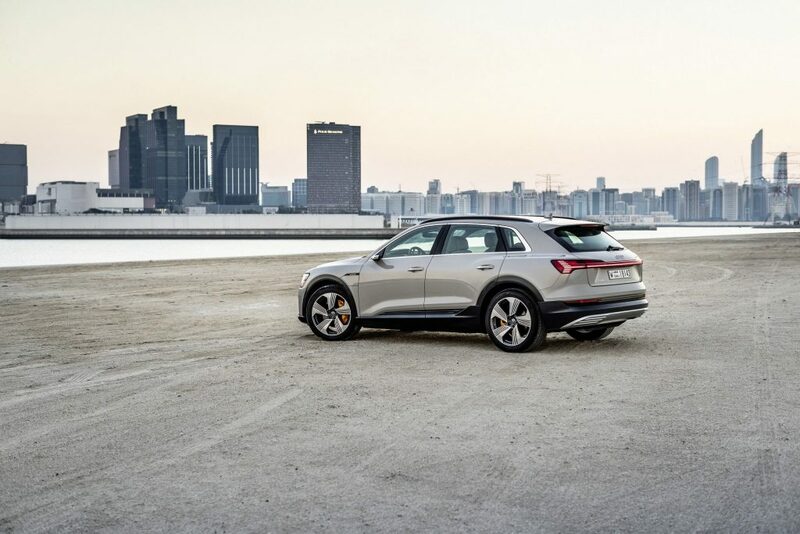 The Audi e-tron comes off the line at the Brussels plant, the world’s first CO₂-neutral certified volume production facility in the premium segment. 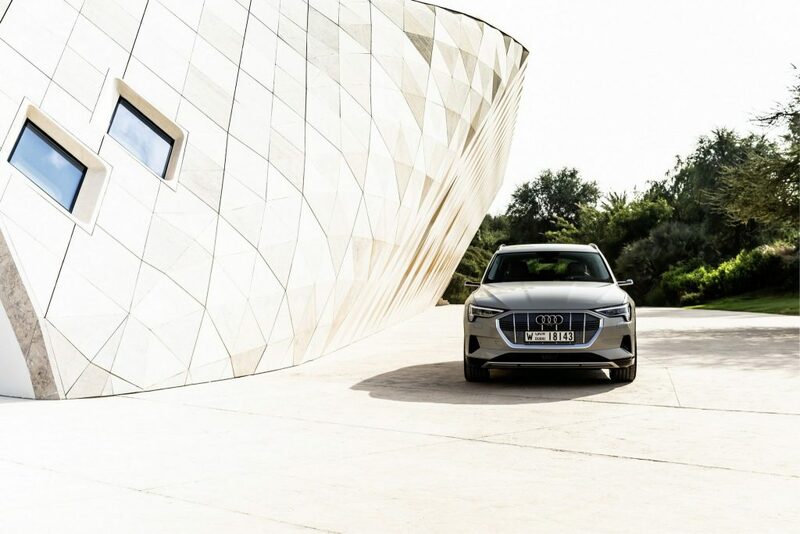 The Belgian Audi site’s groundbreaking achievement is the result of three measures: green electricity, ecological heat supply and climate compensation projects. 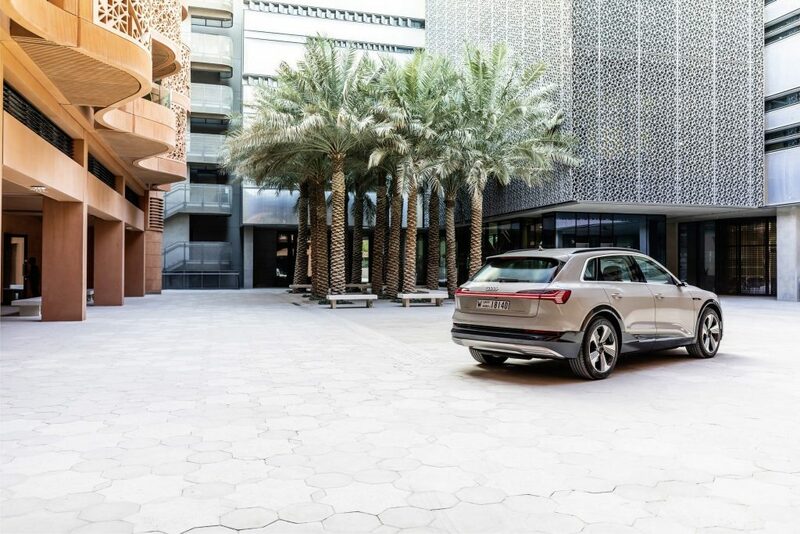 Masdar City, from where test drives of the Audi e-tron begin, is a greenprint for cities of the future. 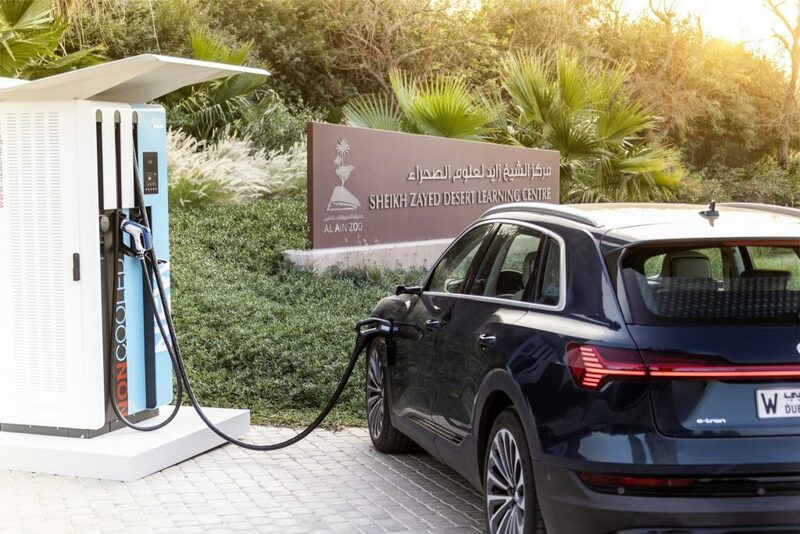 Based on the three pillars of social, economic and environmental sustainability, the city is pioneering sustainable urban development by incubating real-world solutions in energy, water efficiency, waste management and mobility. 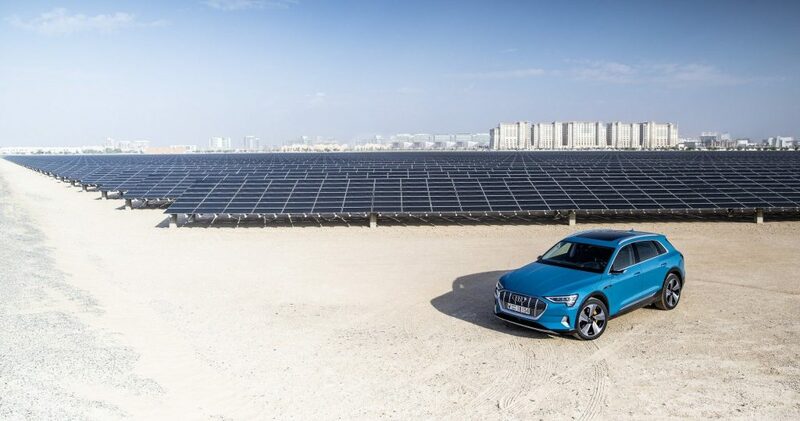 Located next to Abu Dhabi International Airport, the low-carbon community is made up of a rapidly growing residential neighbourhood, clean-tech cluster and free zone, home to more than 590 small-to-medium-sized businesses, multinational companies and public sector tenants – it is also hosts the headquarters of the International Renewable Energy Agency (IRENA). 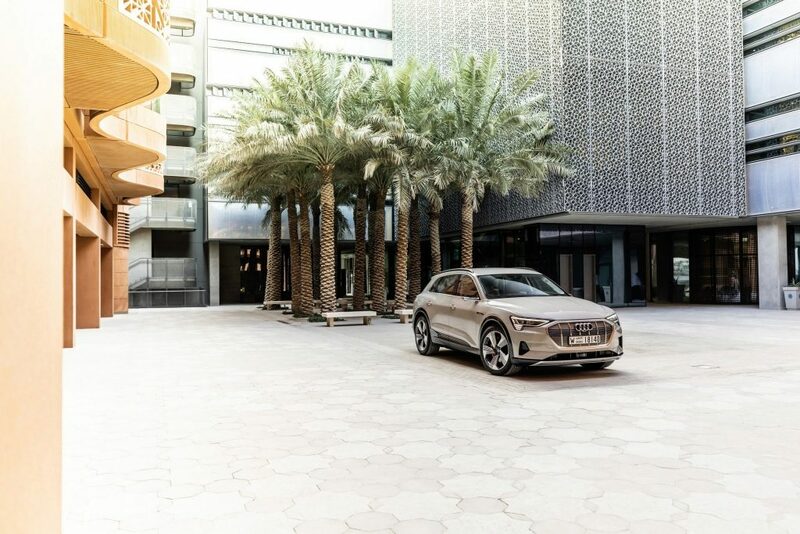 Yousef Baselaib, Executive Director for Sustainable Real Estate at Masdar, says: “Part of our mandate at Masdar is to help realize the sustainability targets of Abu Dhabi and the United Arab Emirates and support the implementation of the United Nations’ Sustainable Development Goals. 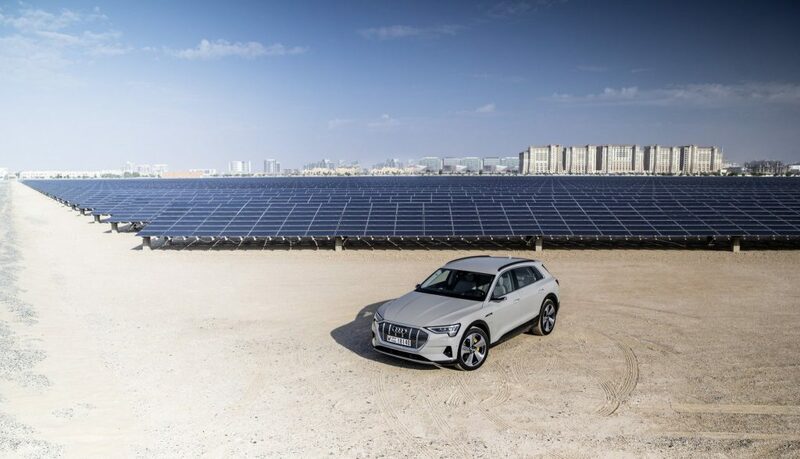 Masdar City in Abu Dhabi is a focal point of these efforts. 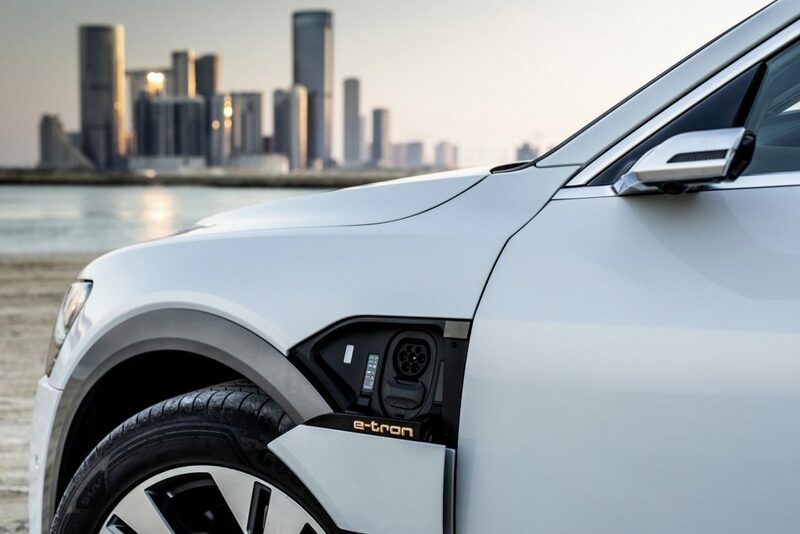 For more than a decade, we’ve been demonstrating innovative clean technologies, collaborating with government, academic and industry partners to bring new ideas to life. 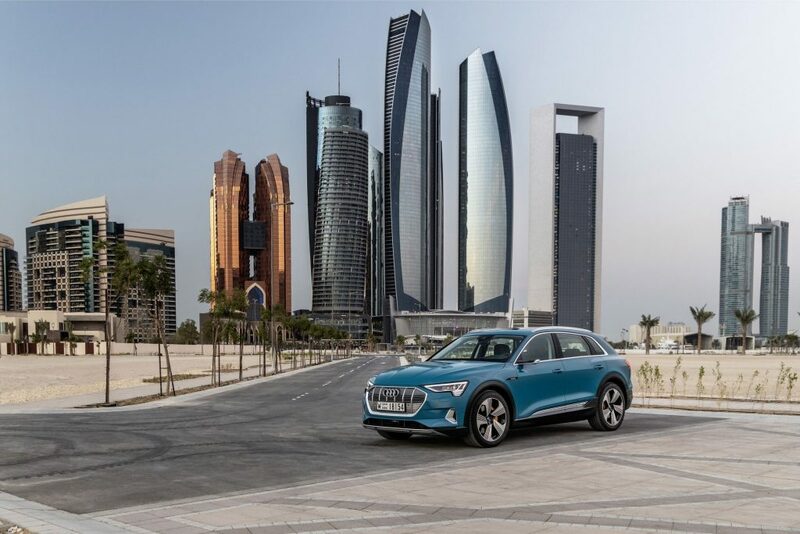 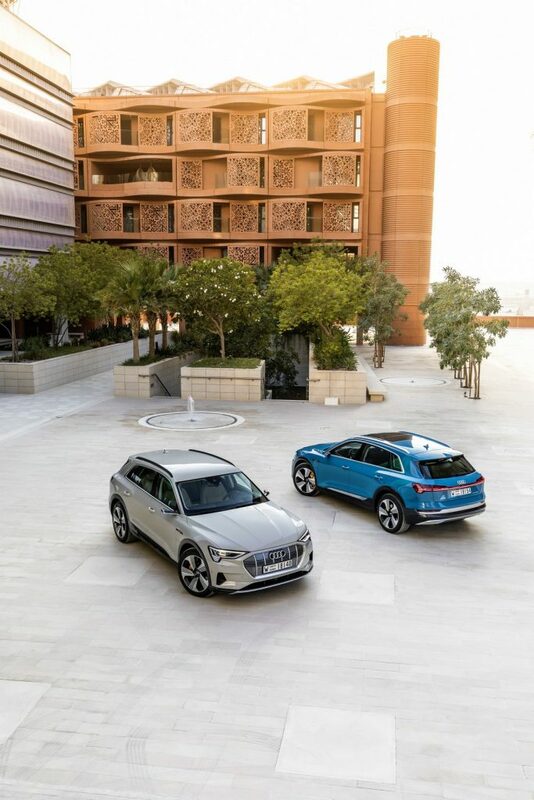 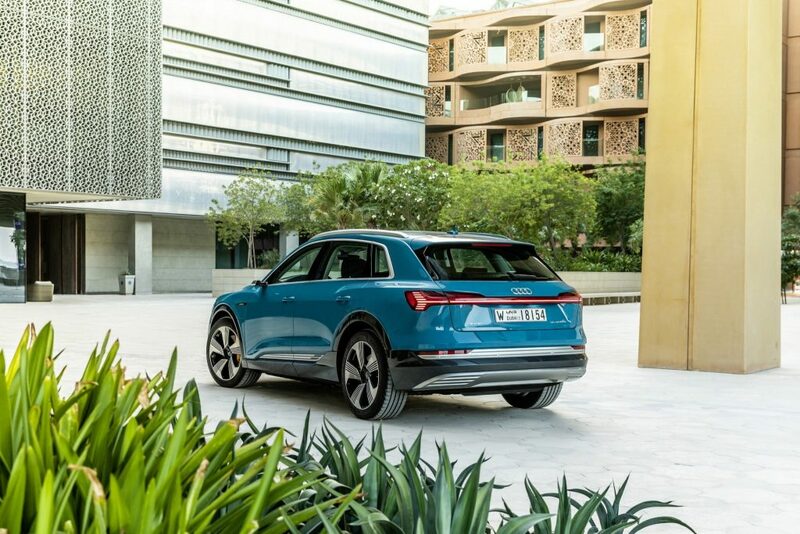 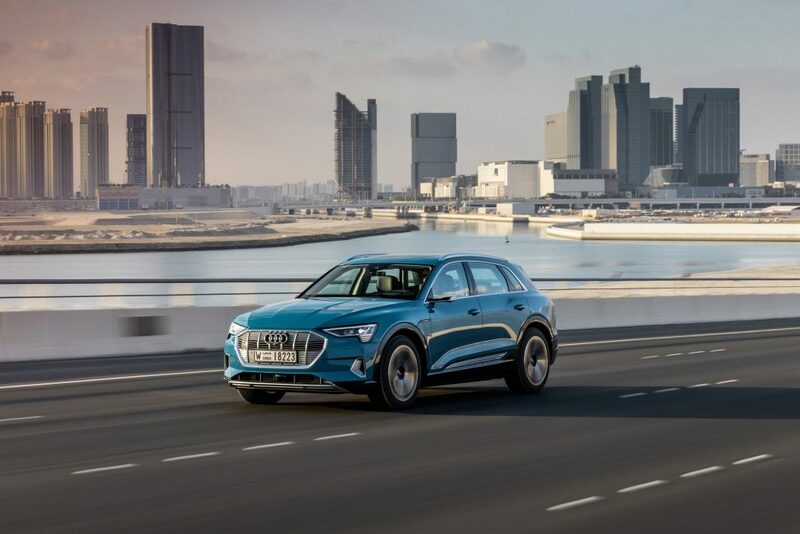 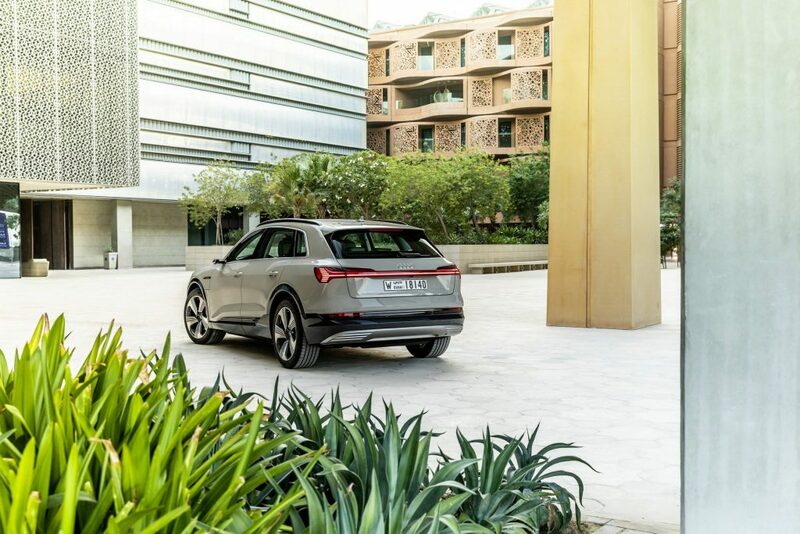 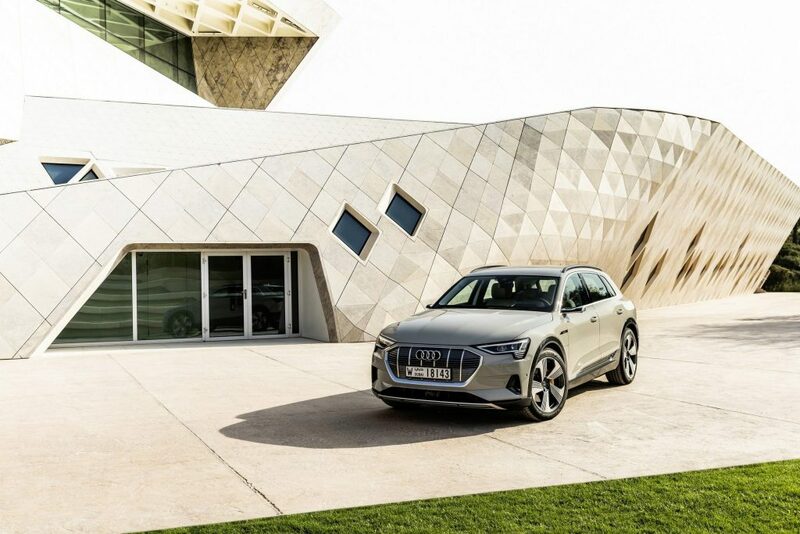 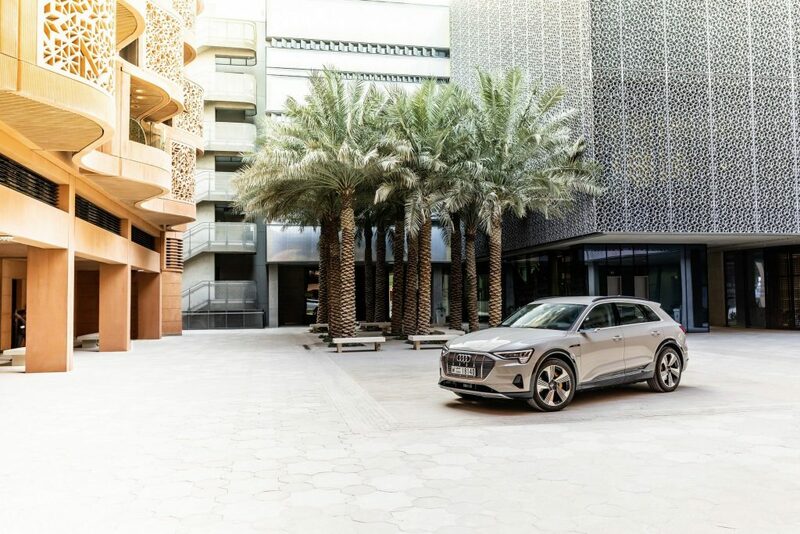 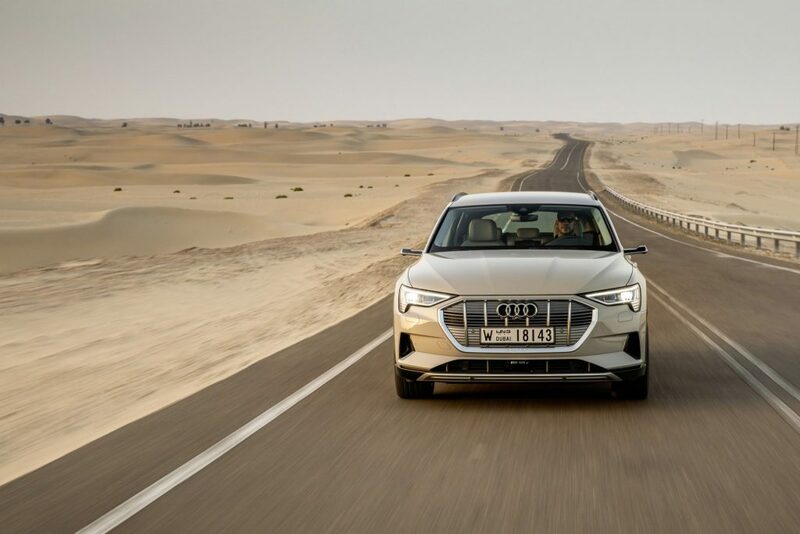 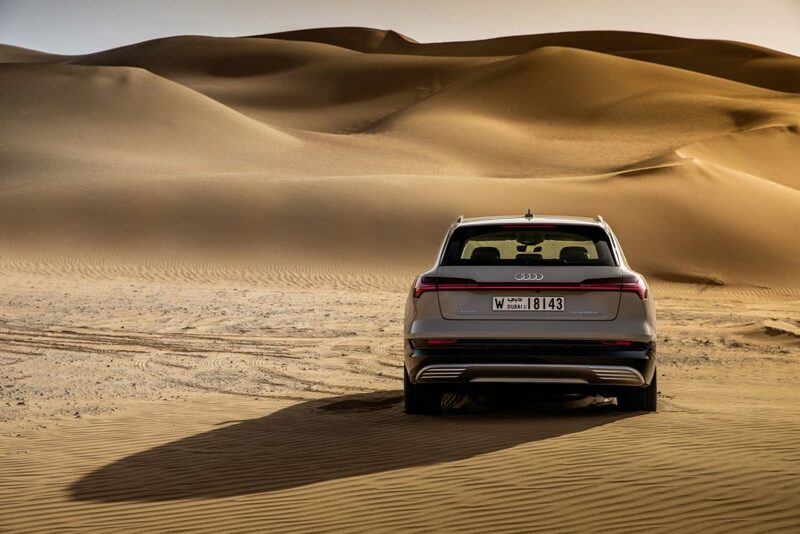 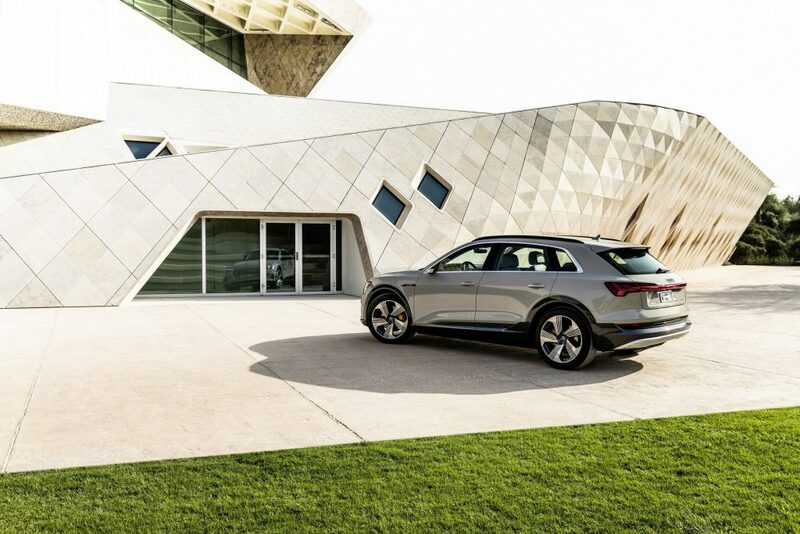 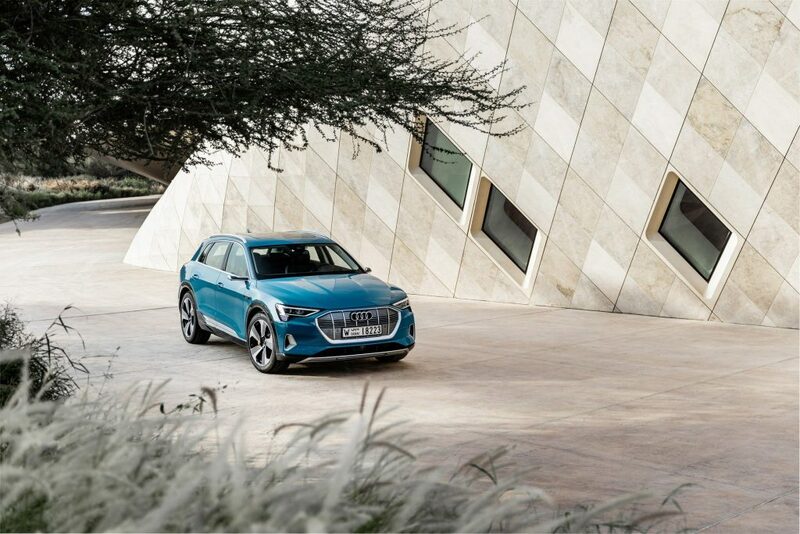 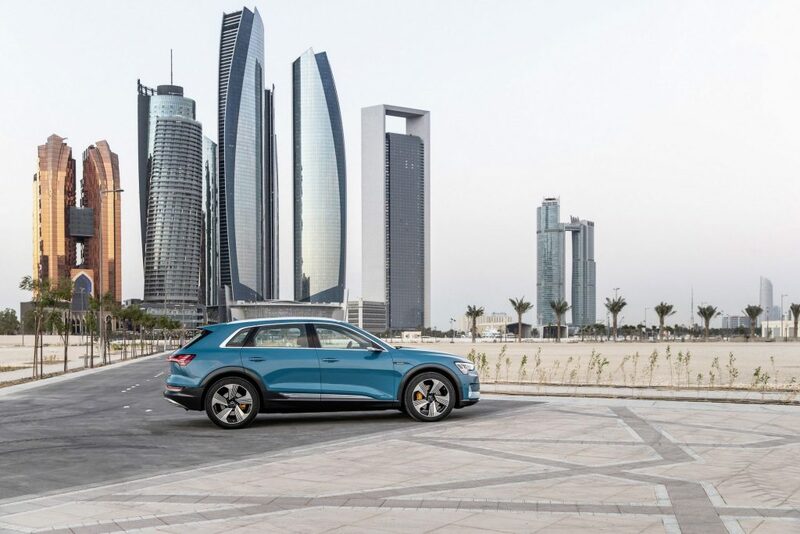 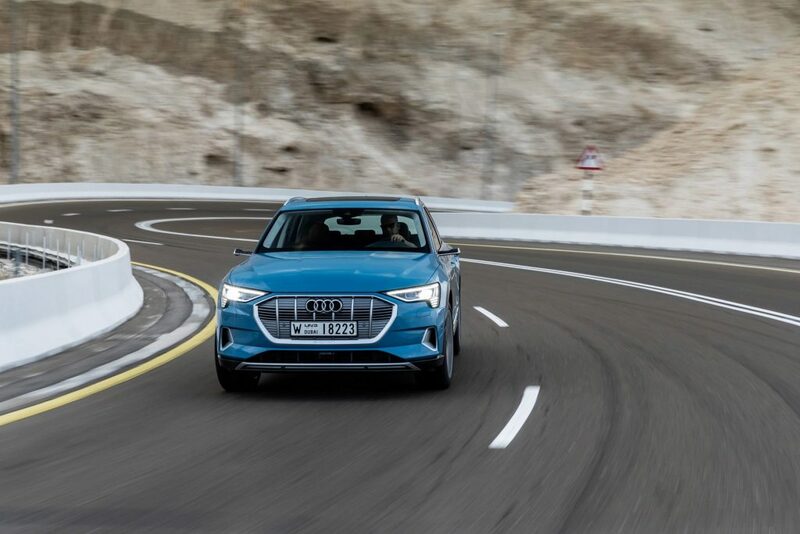 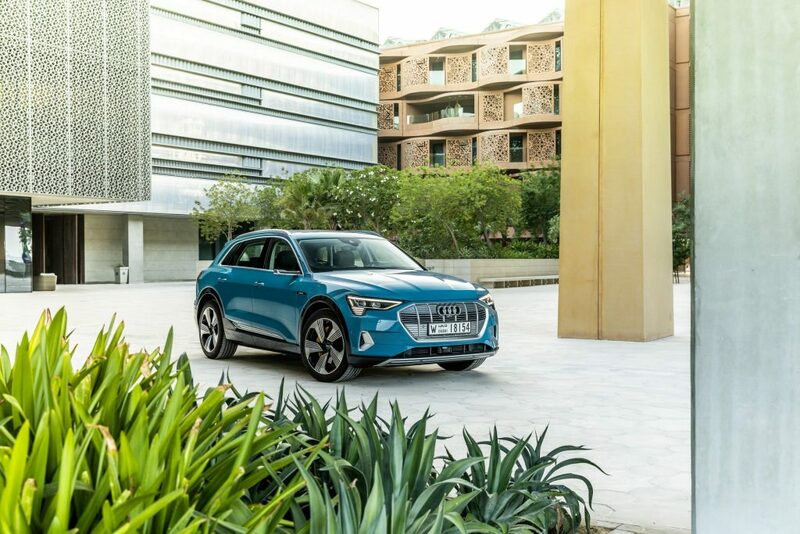 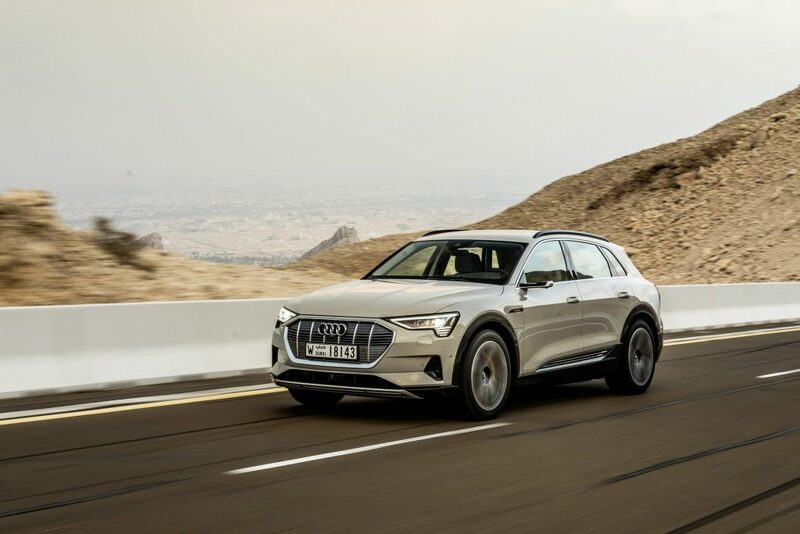 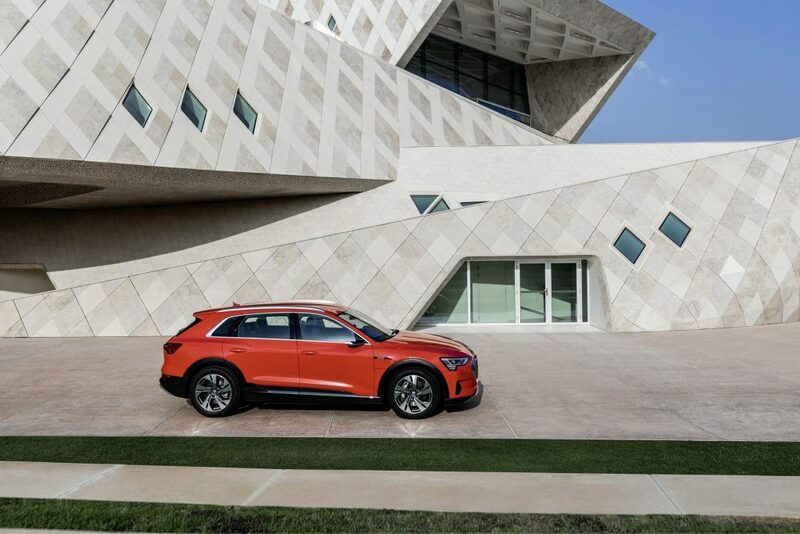 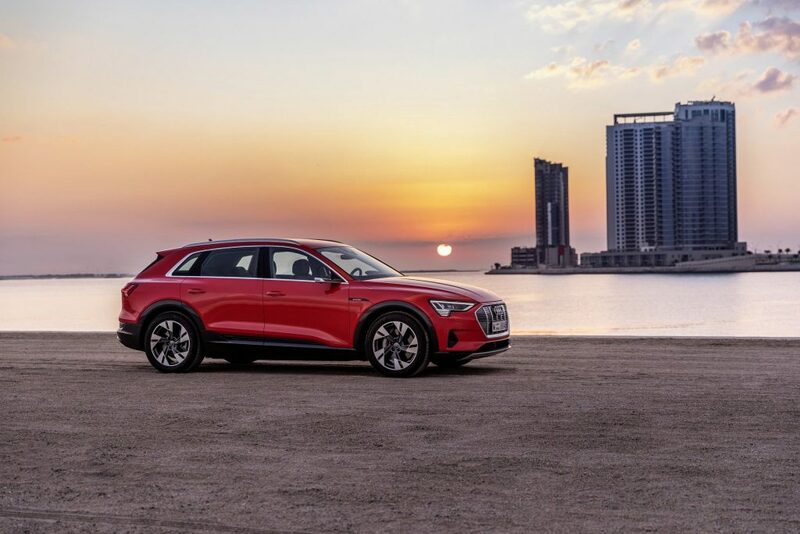 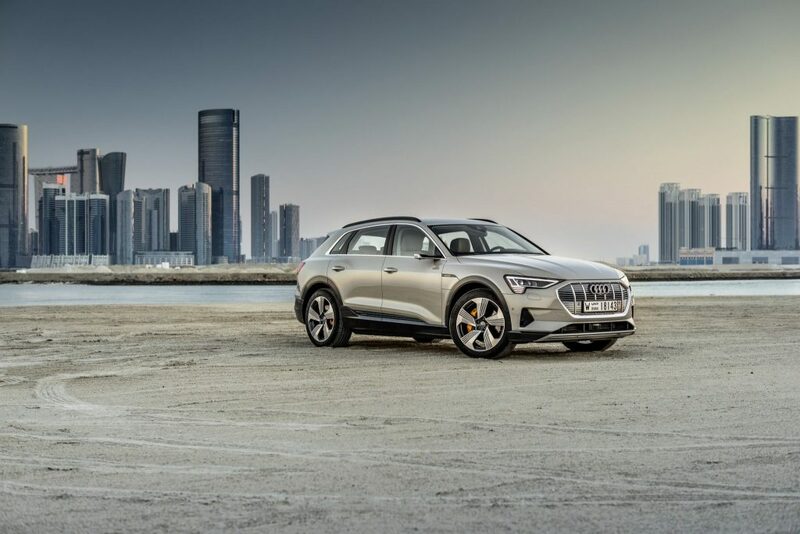 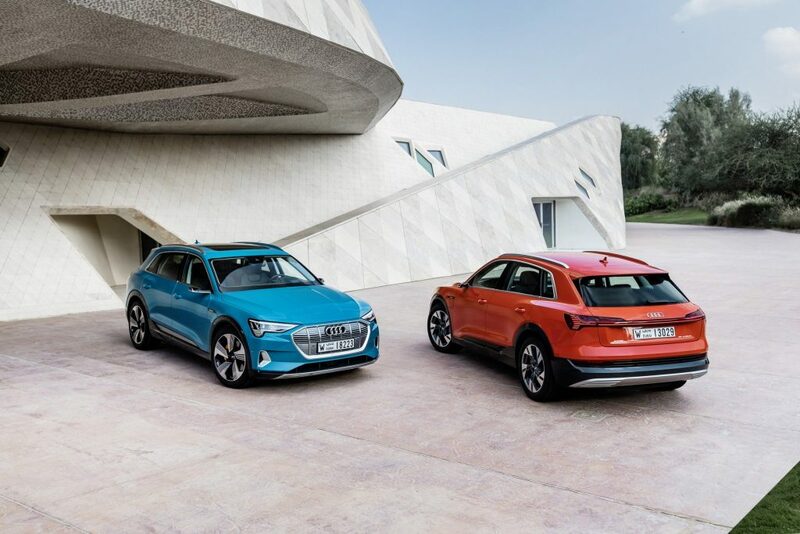 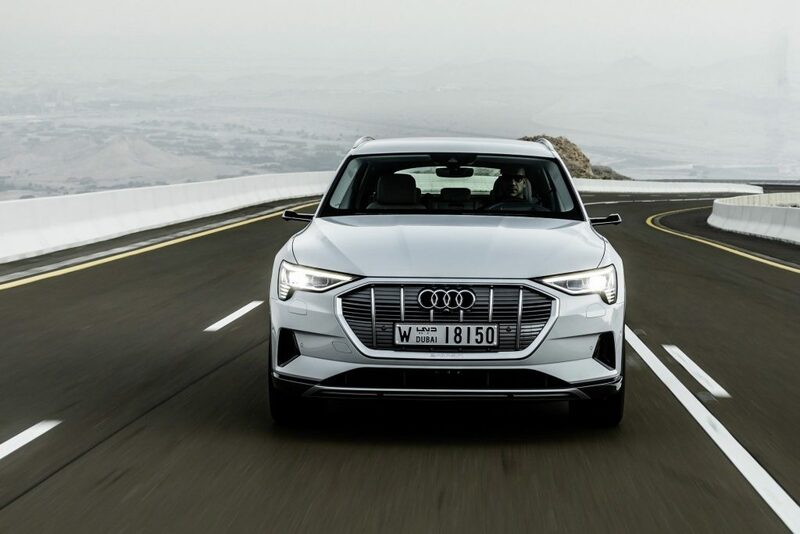 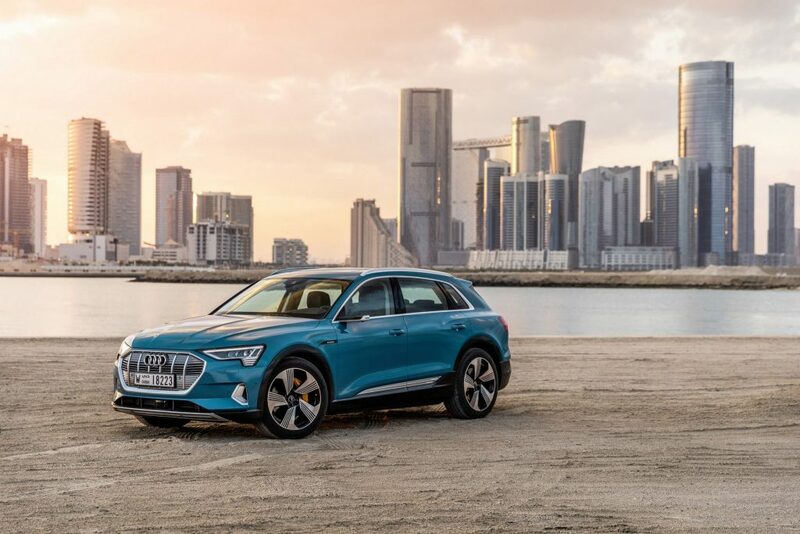 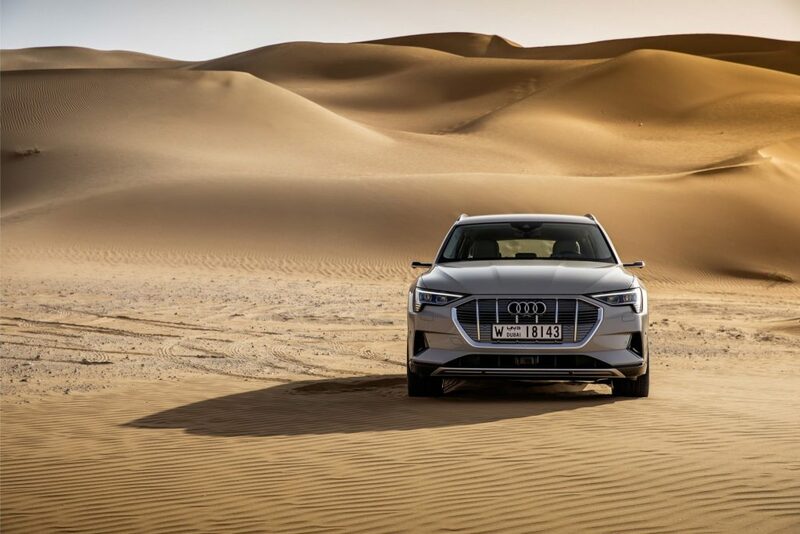 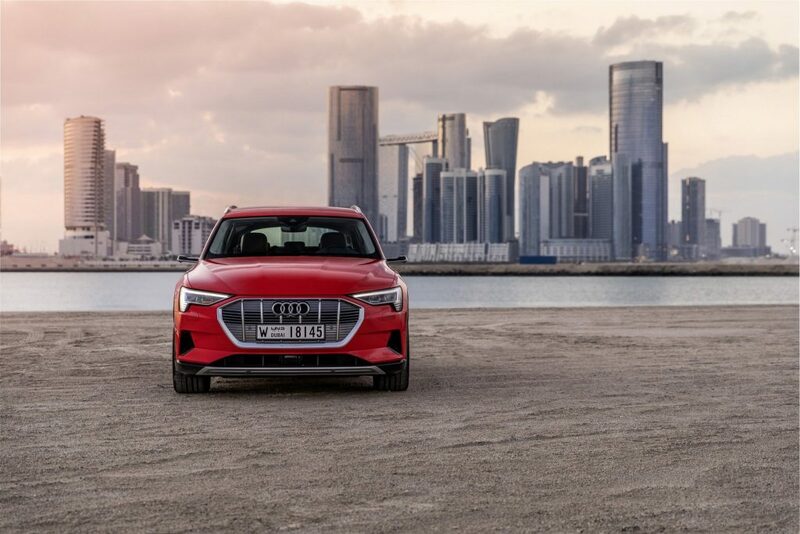 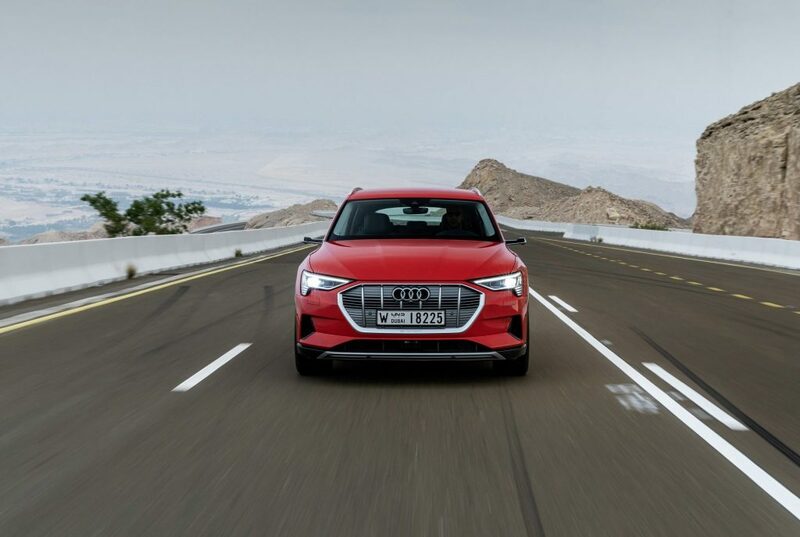 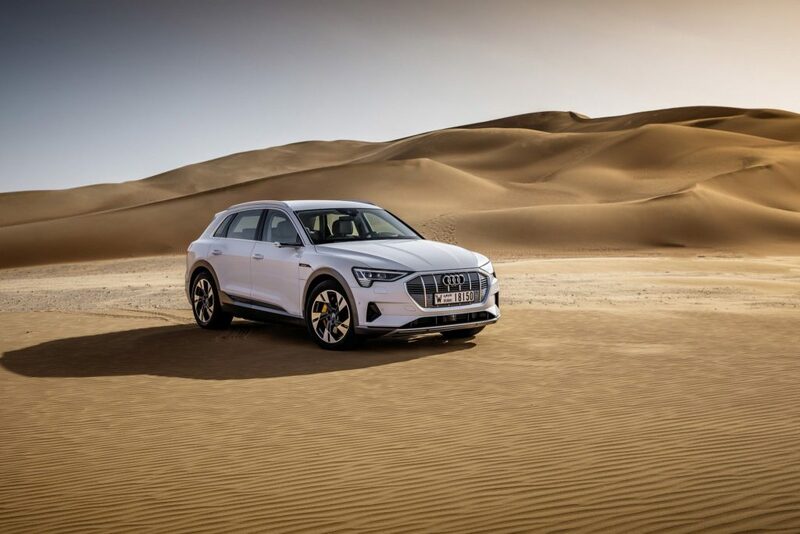 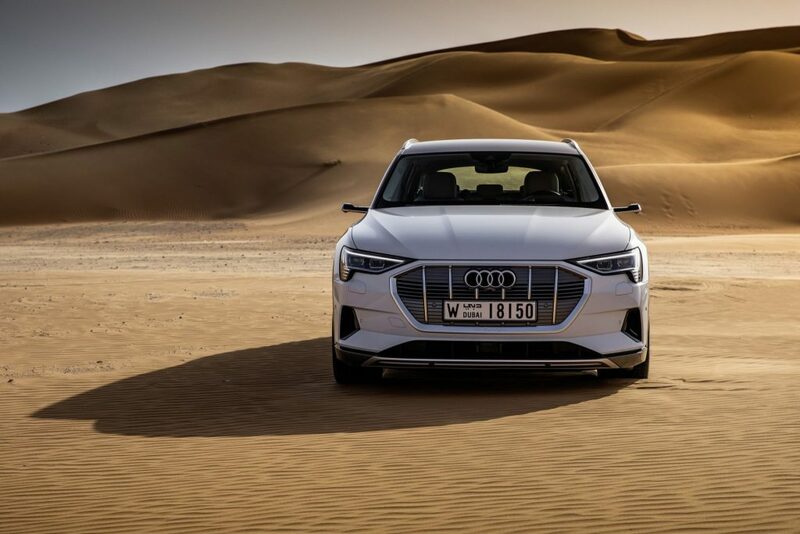 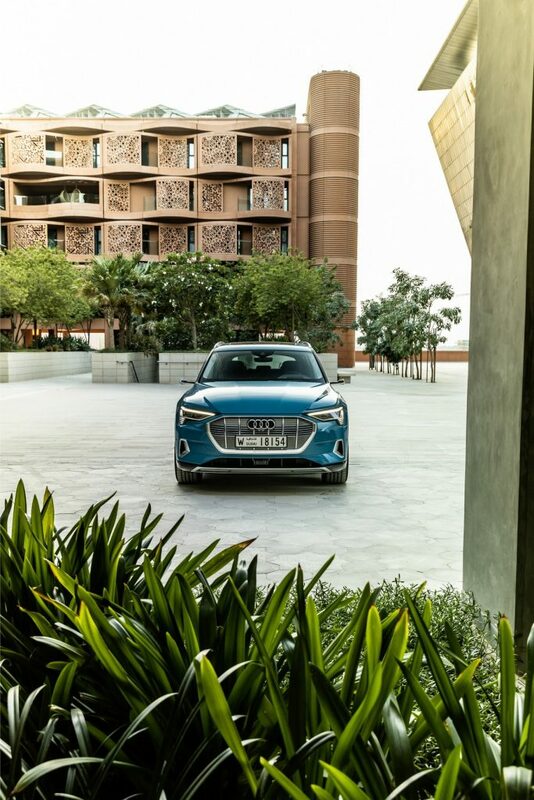 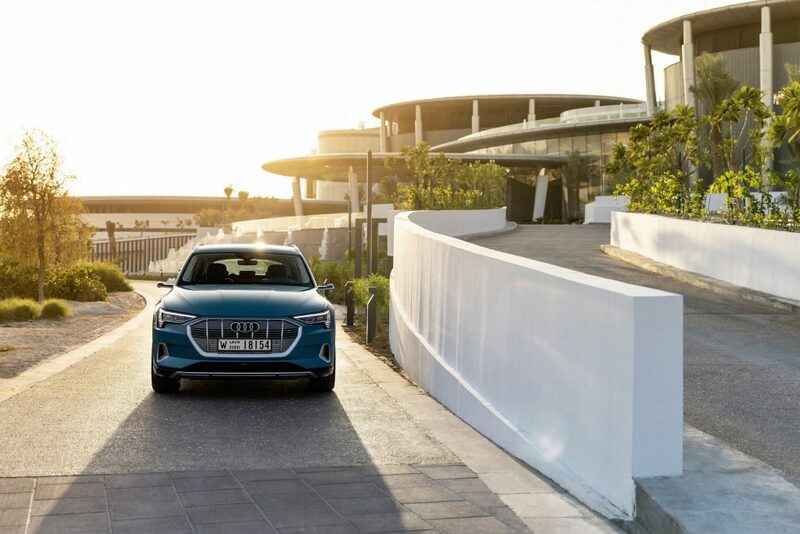 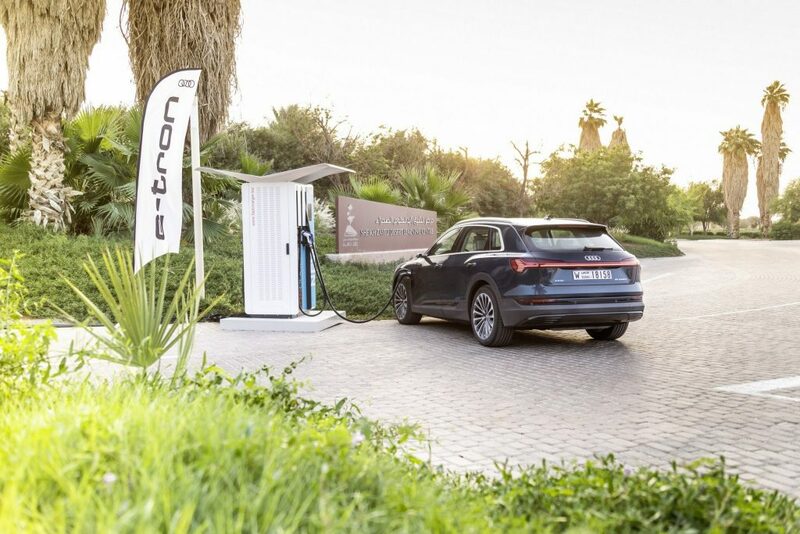 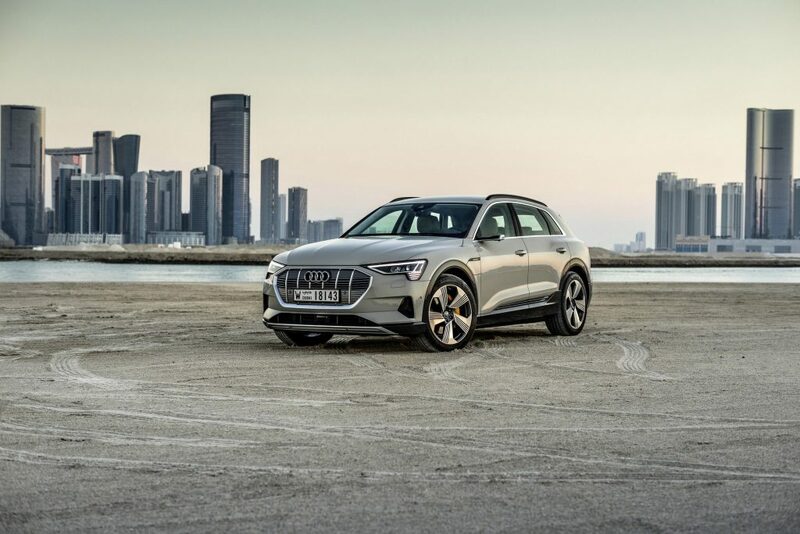 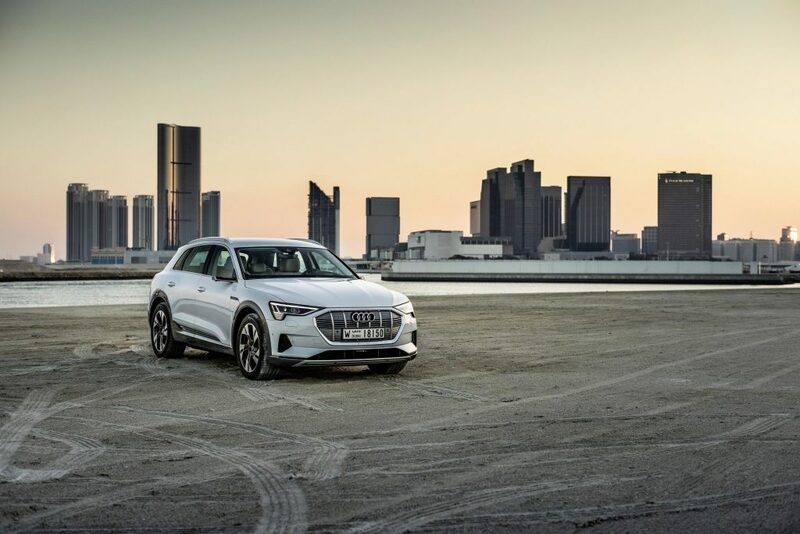 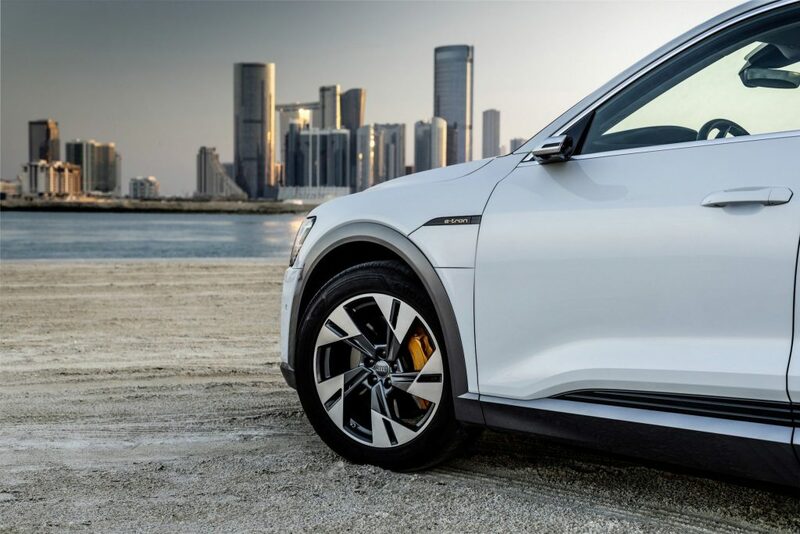 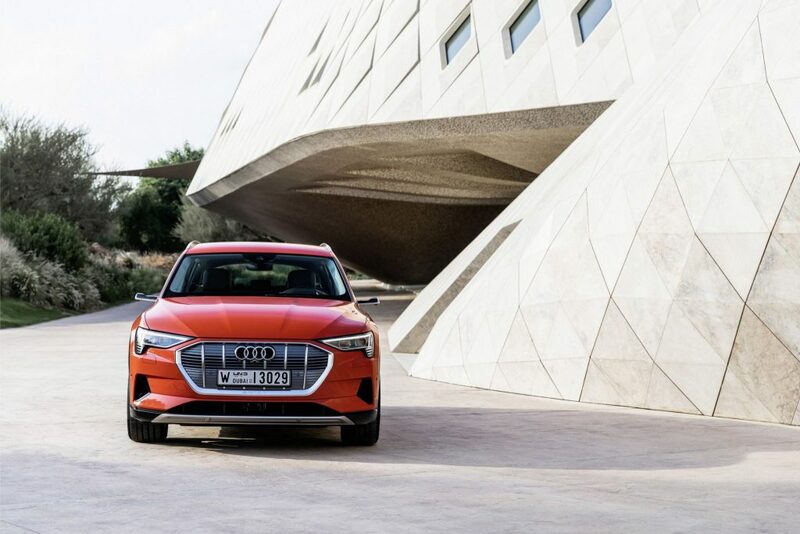 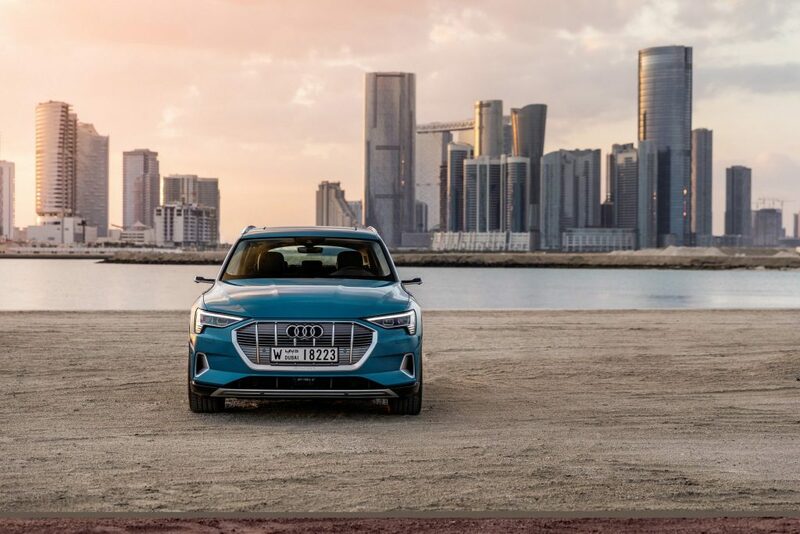 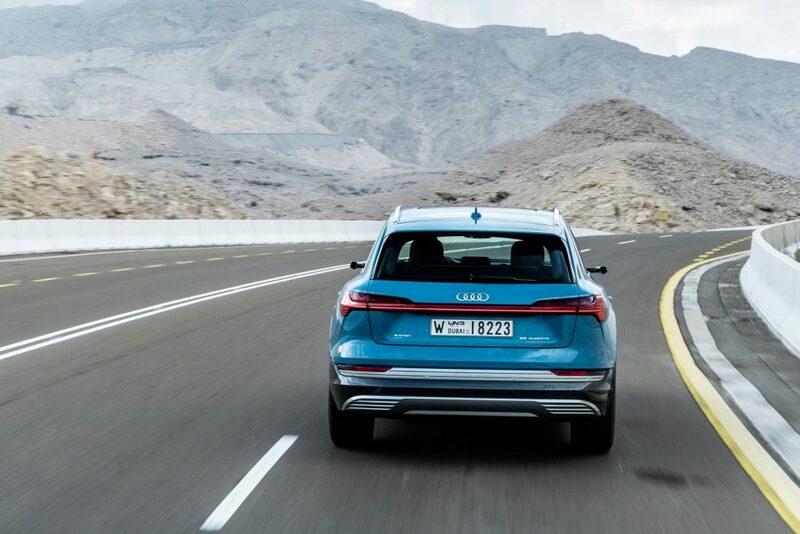 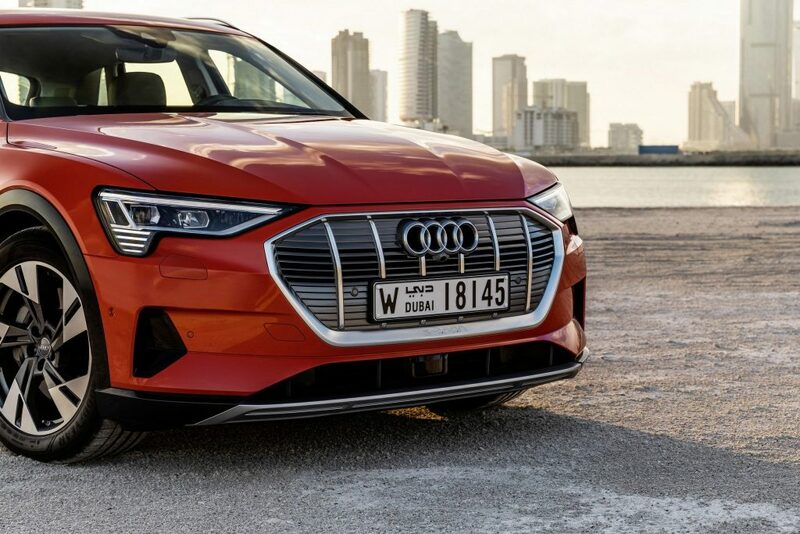 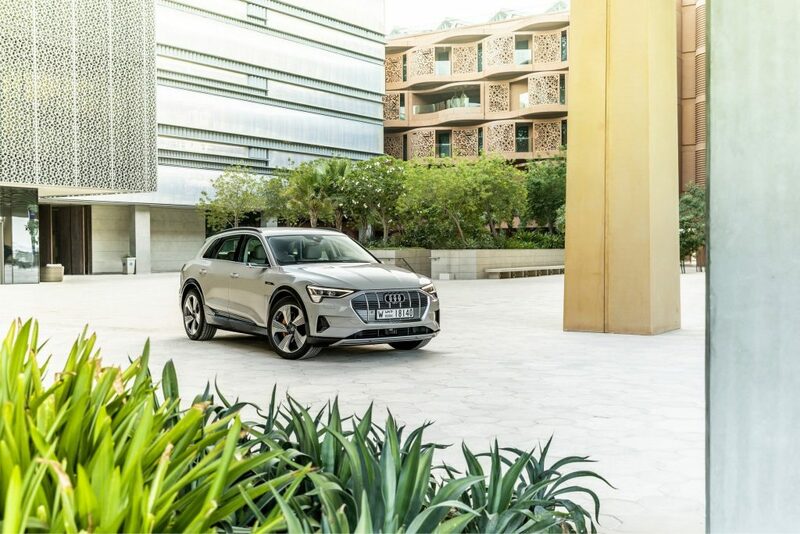 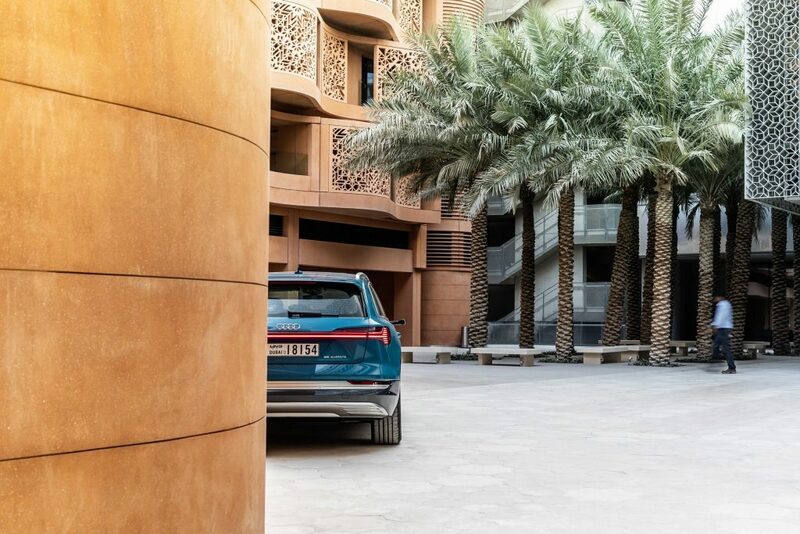 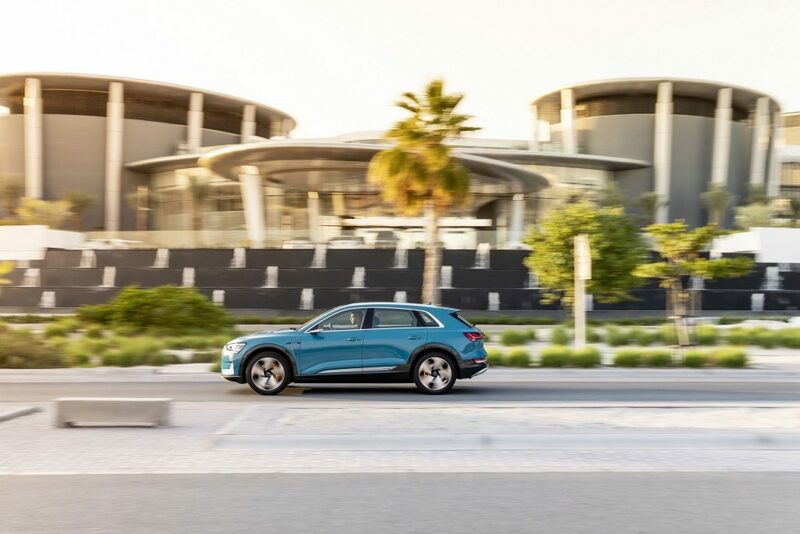 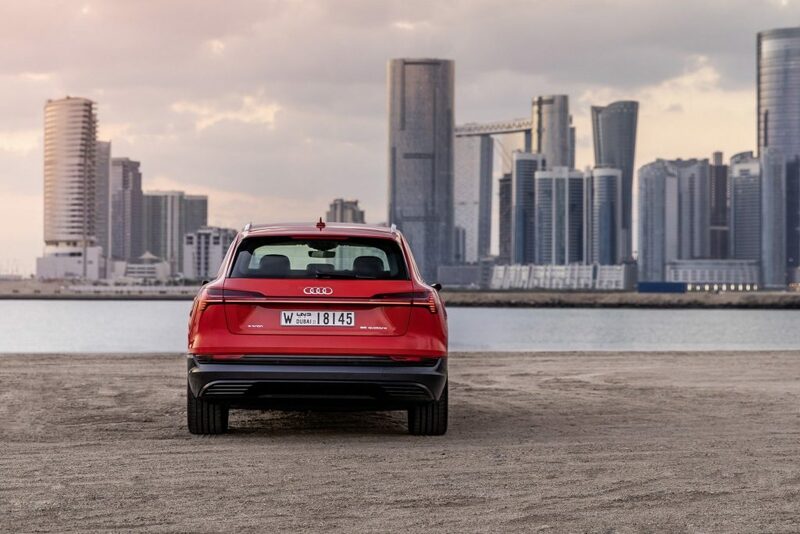 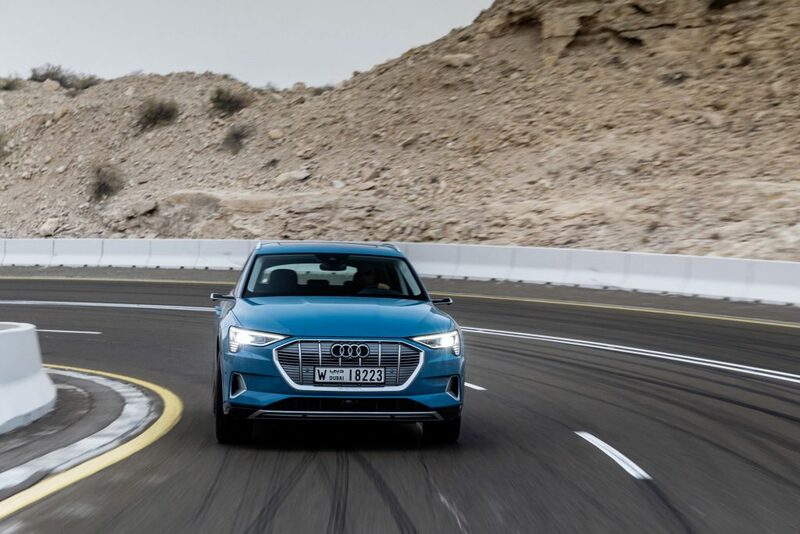 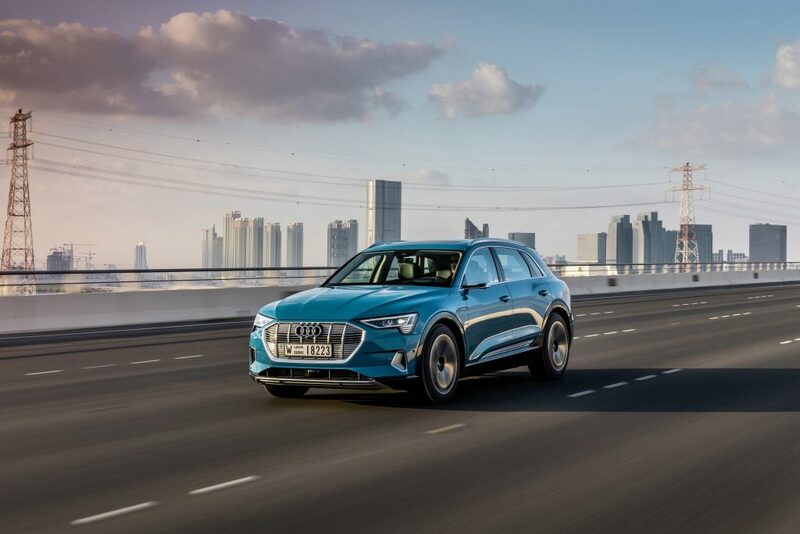 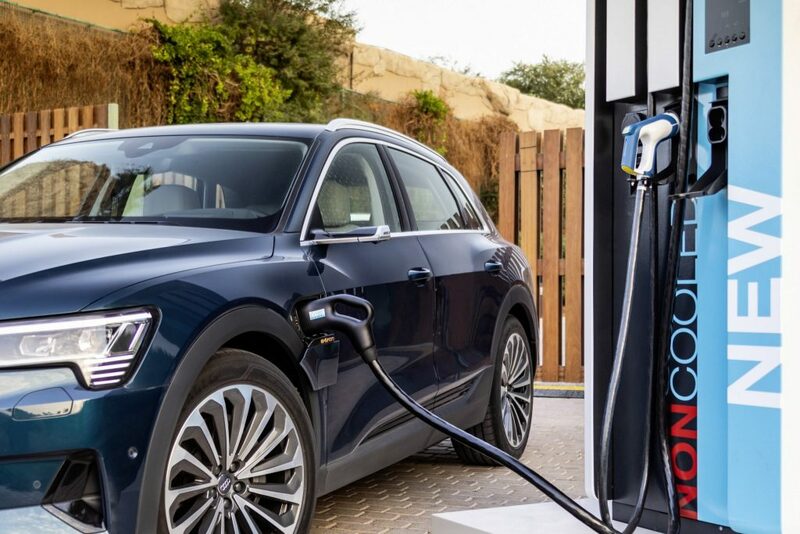 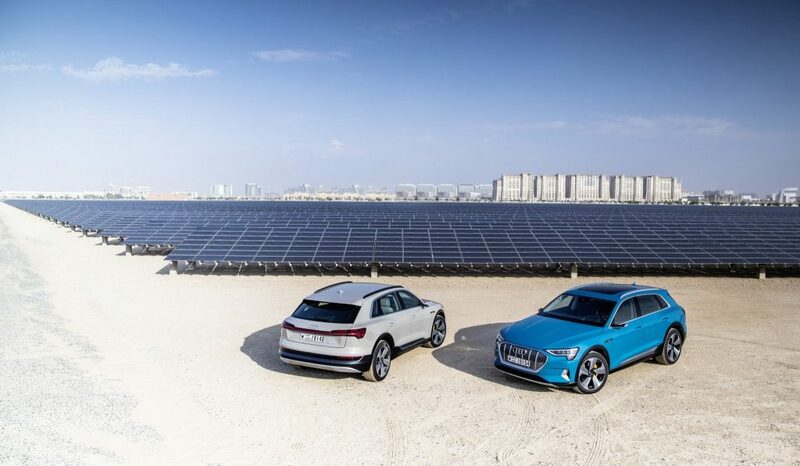 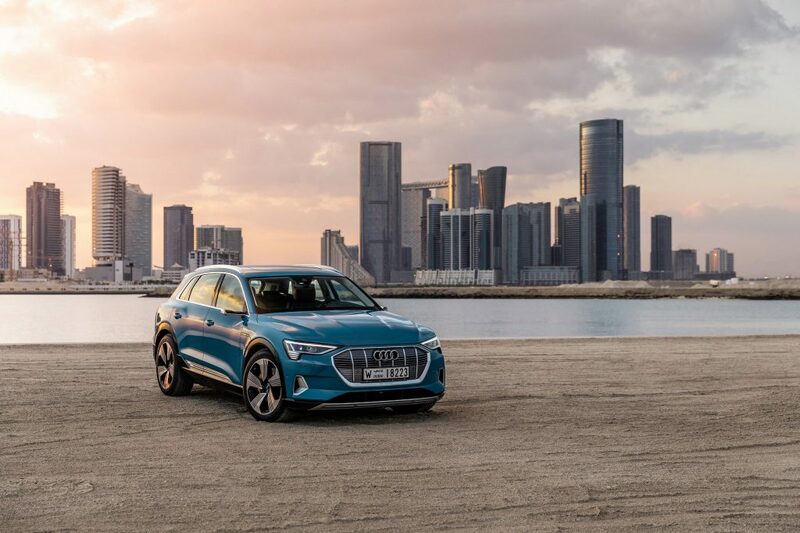 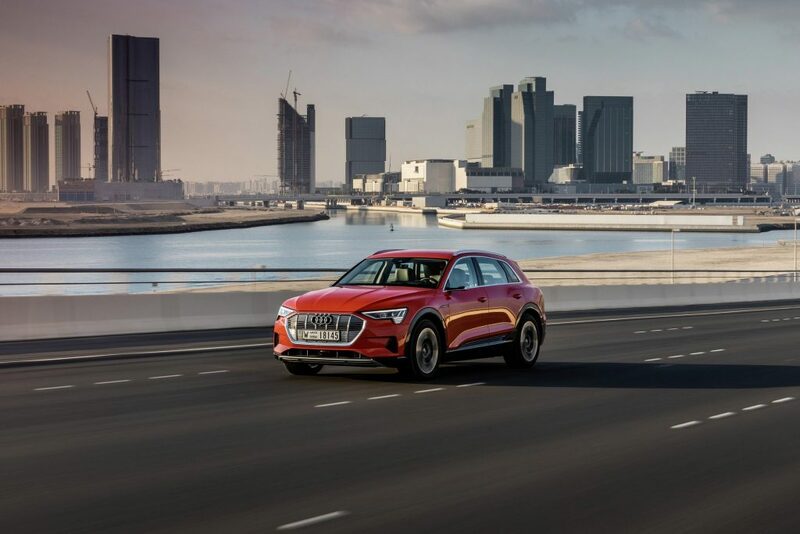 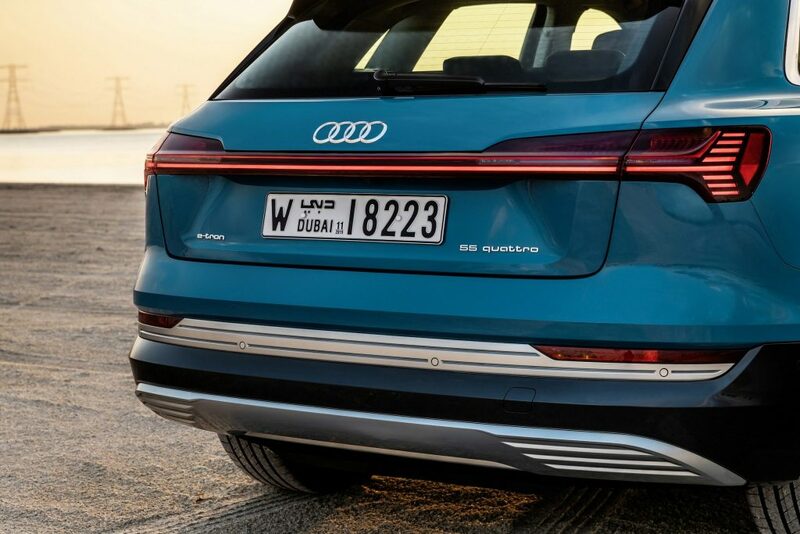 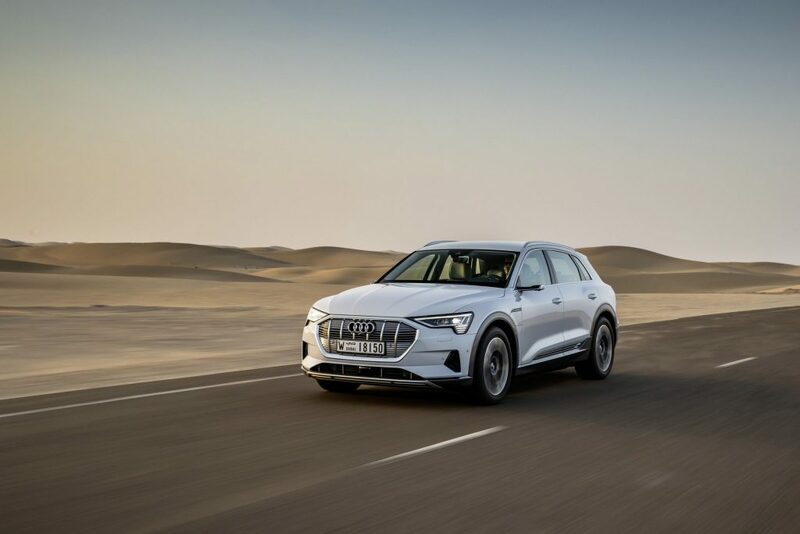 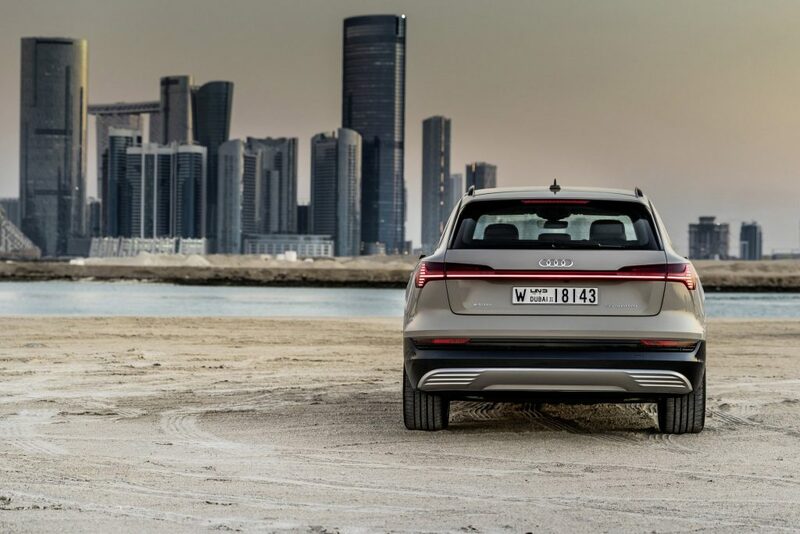 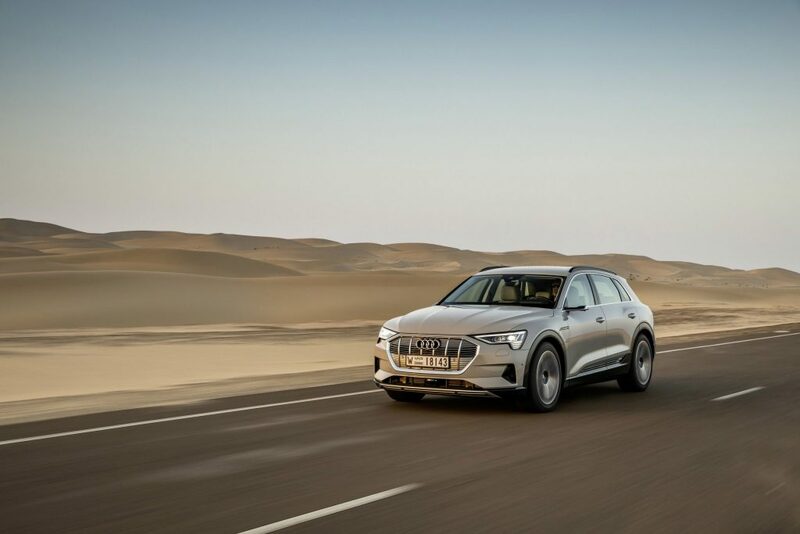 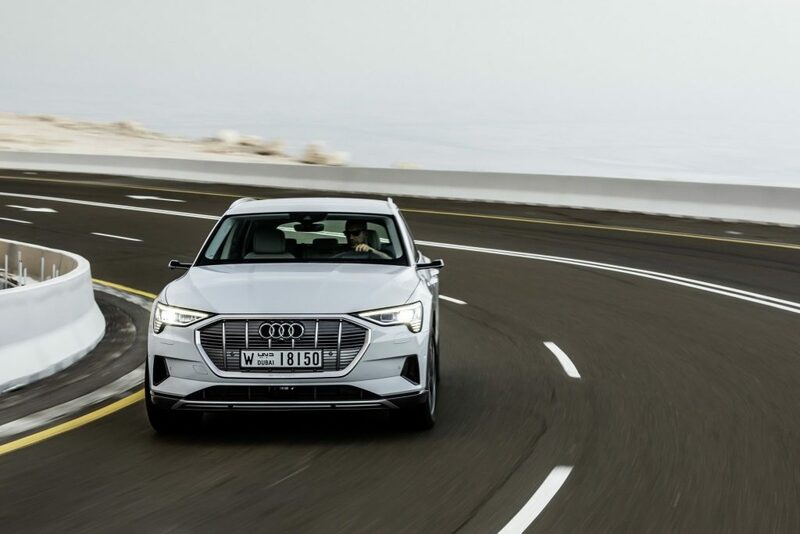 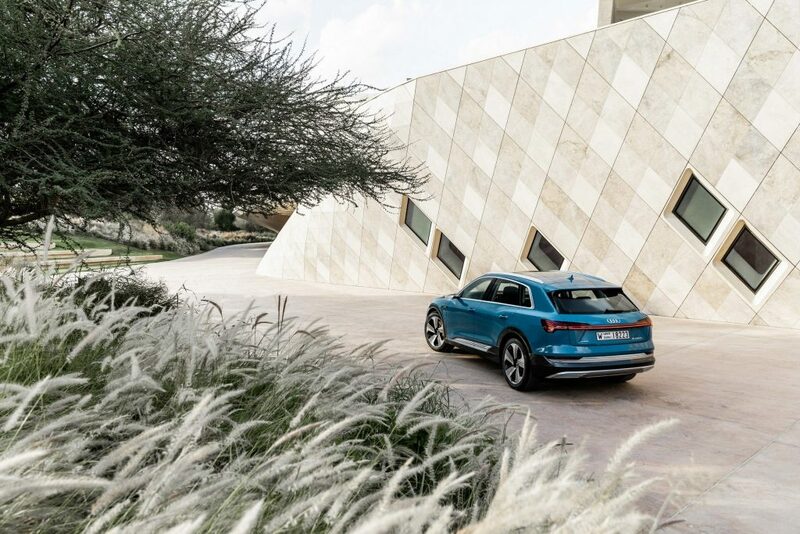 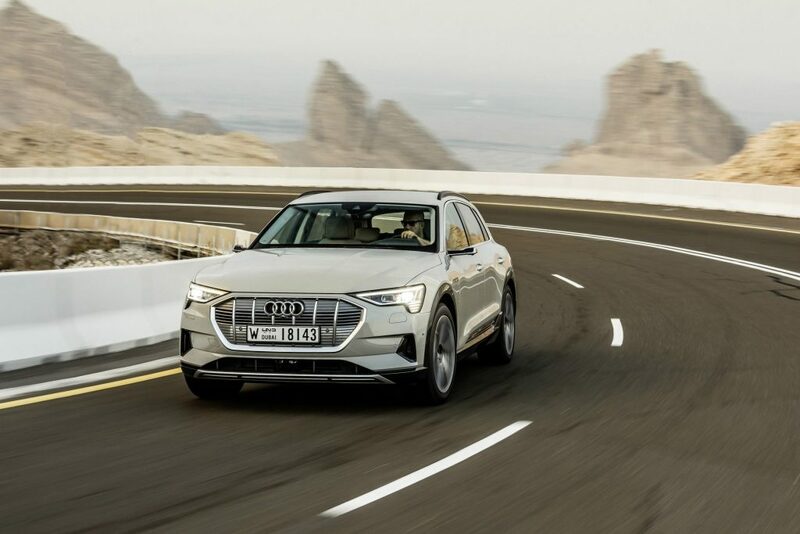 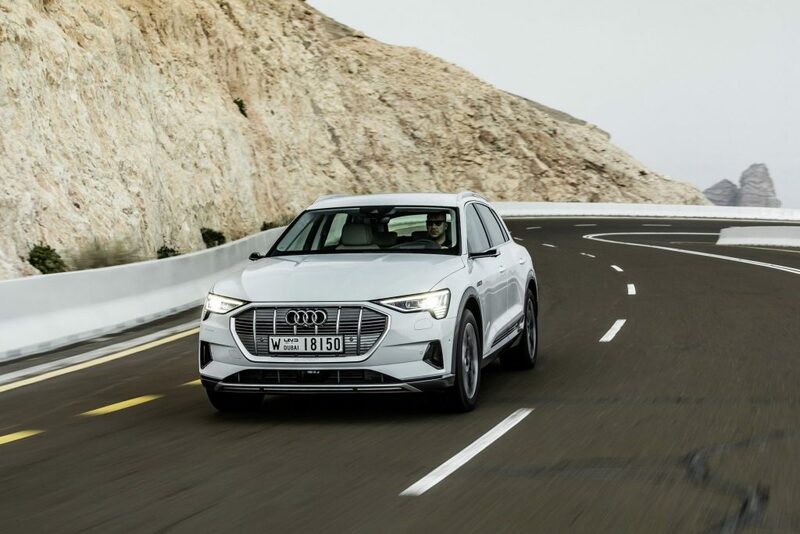 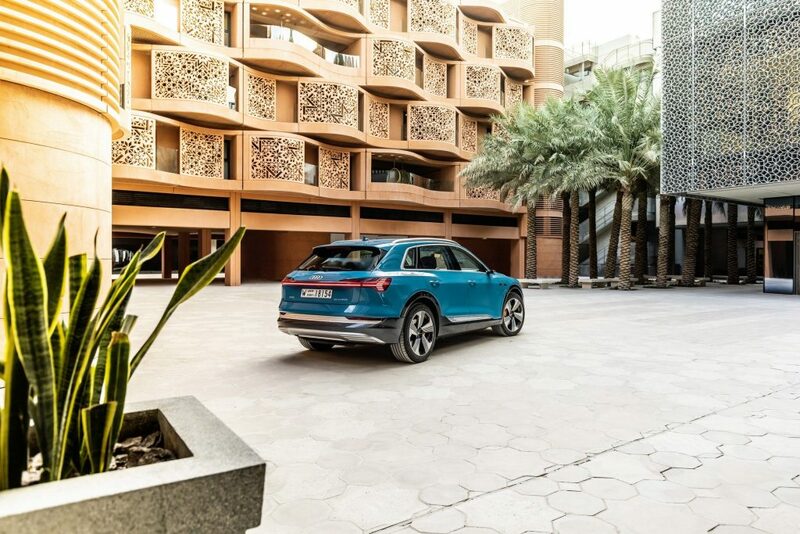 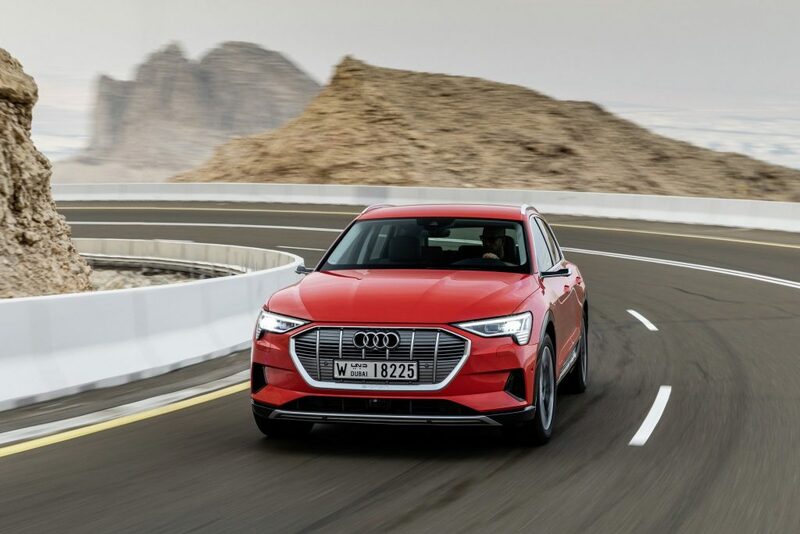 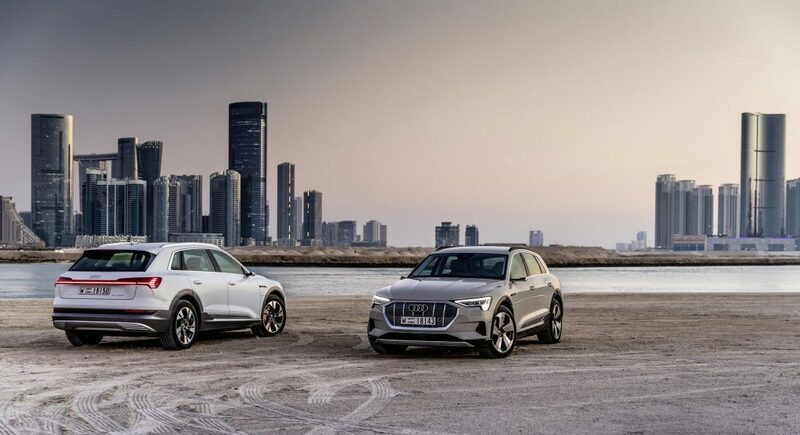 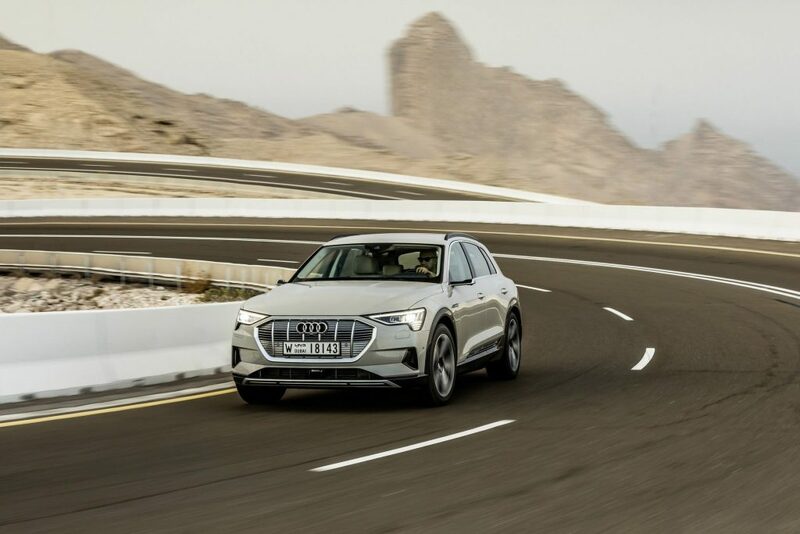 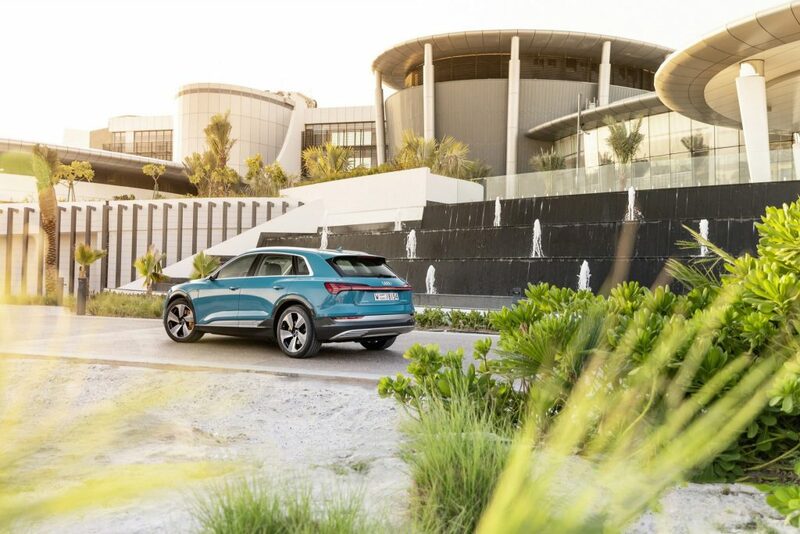 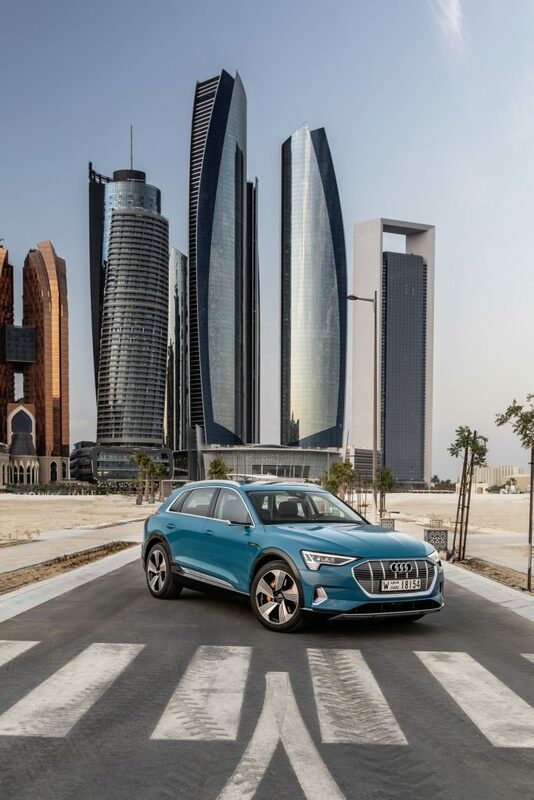 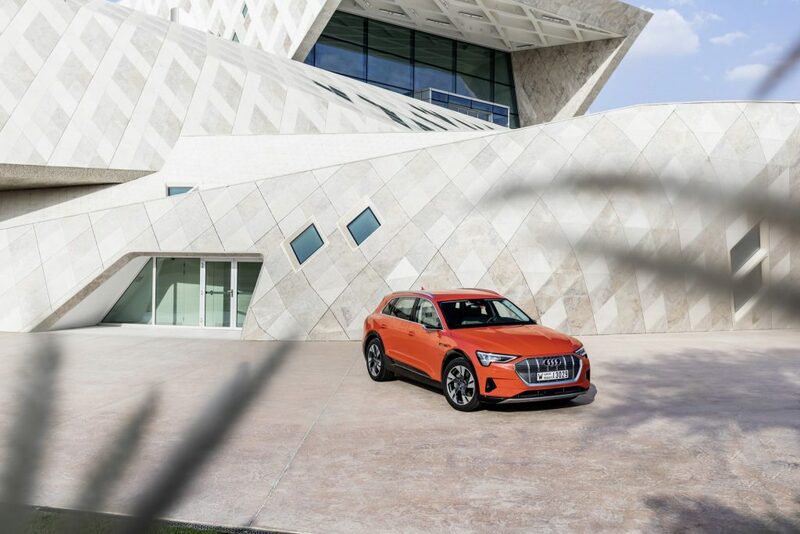 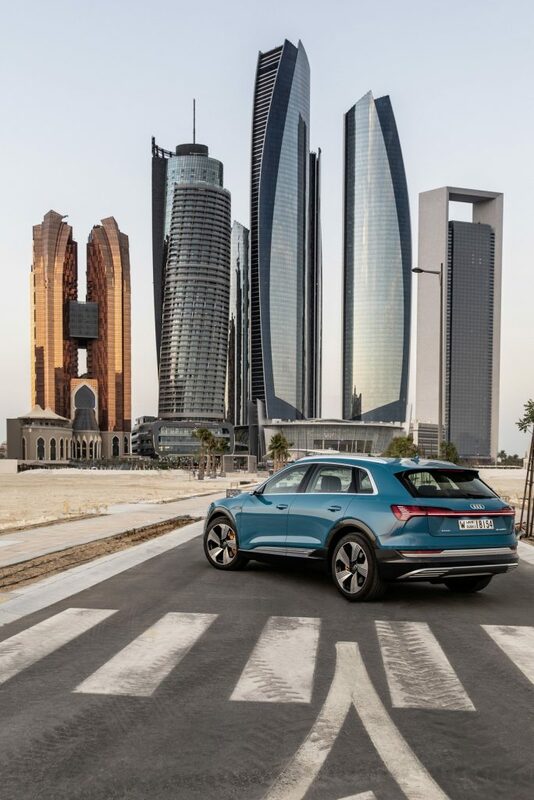 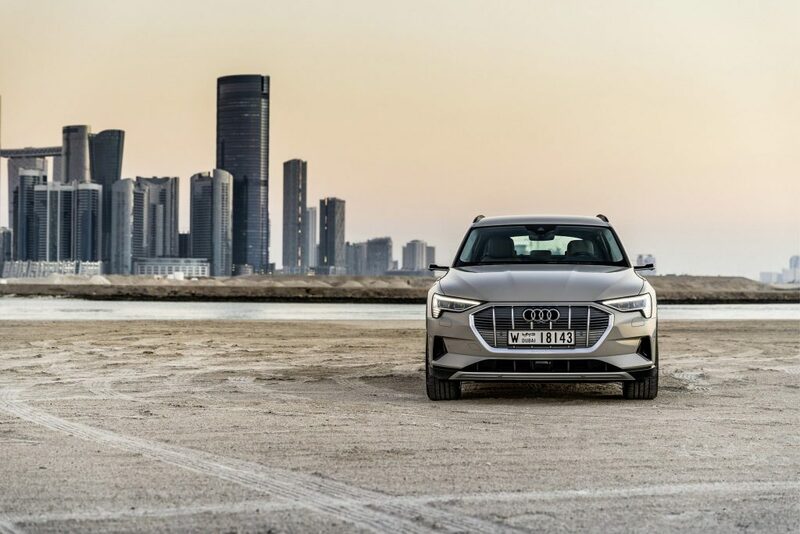 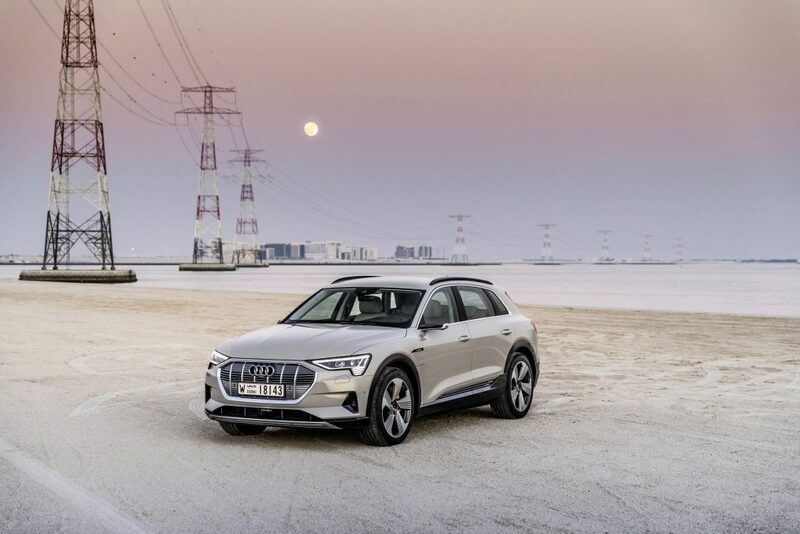 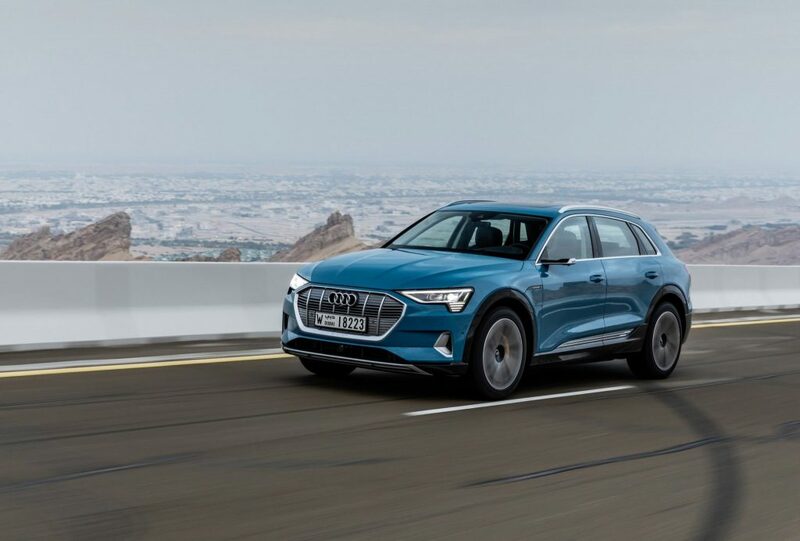 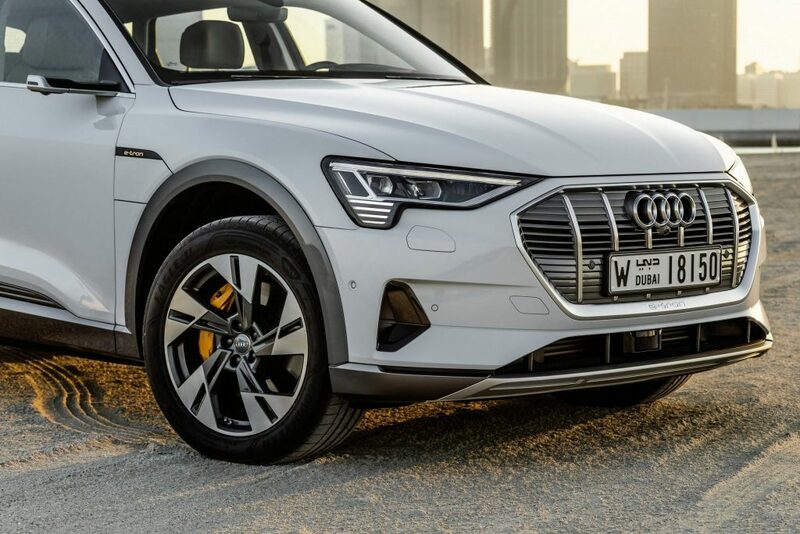 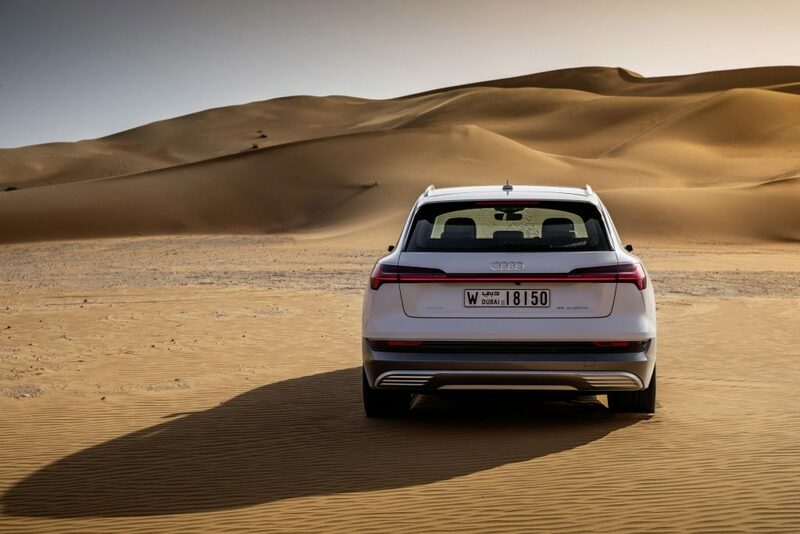 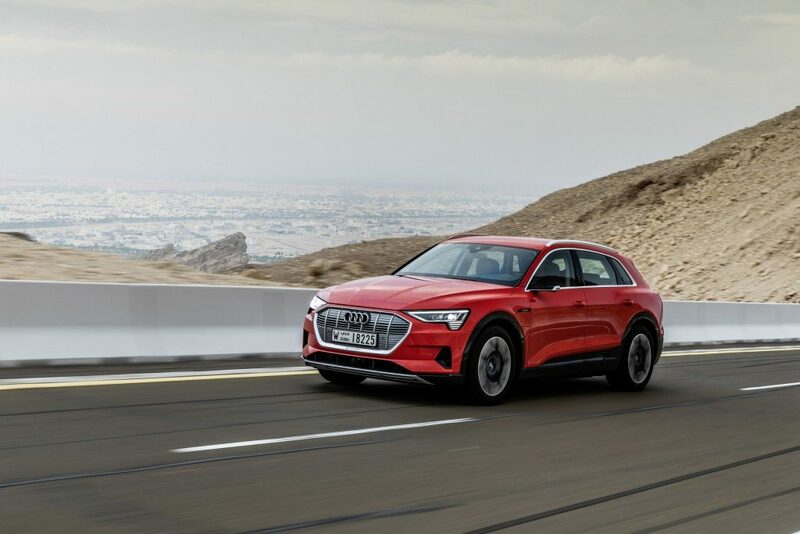 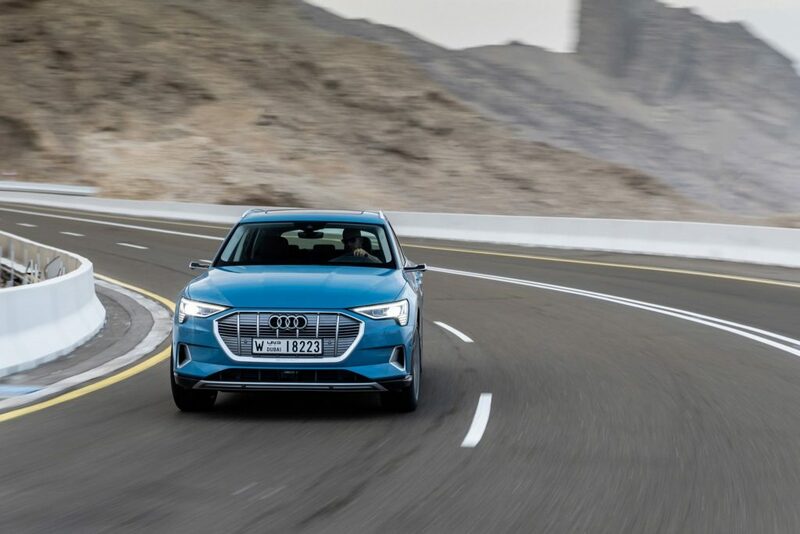 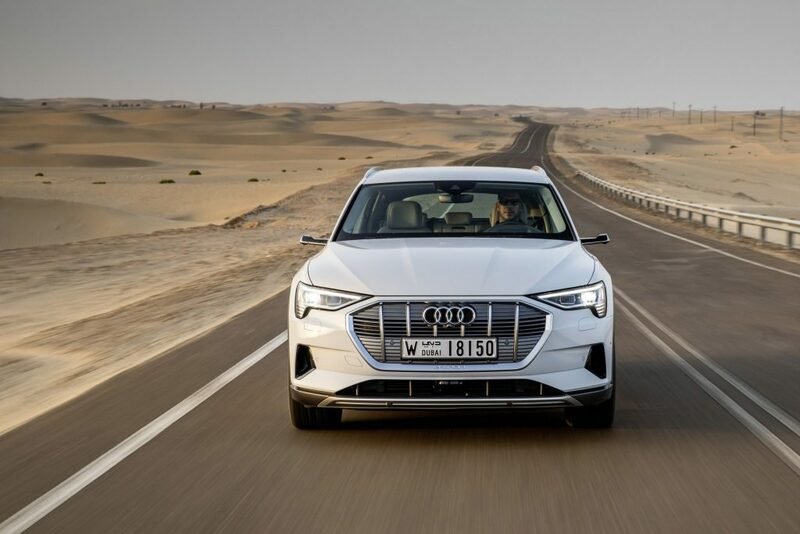 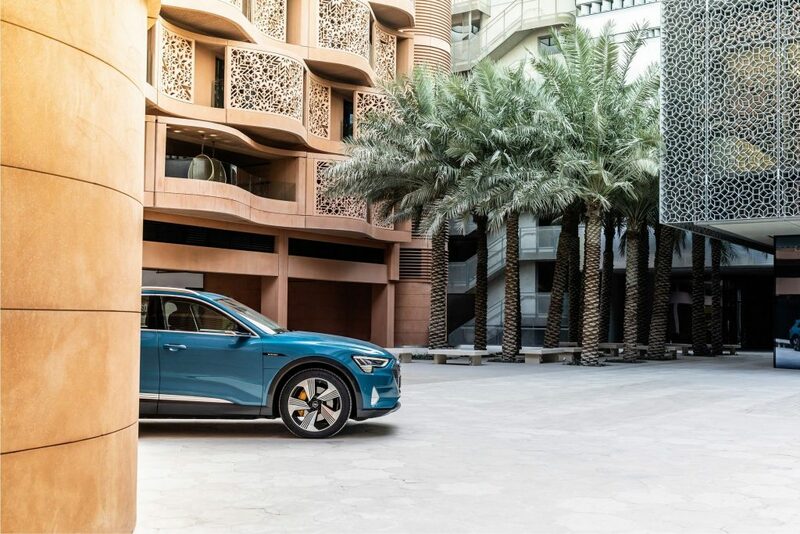 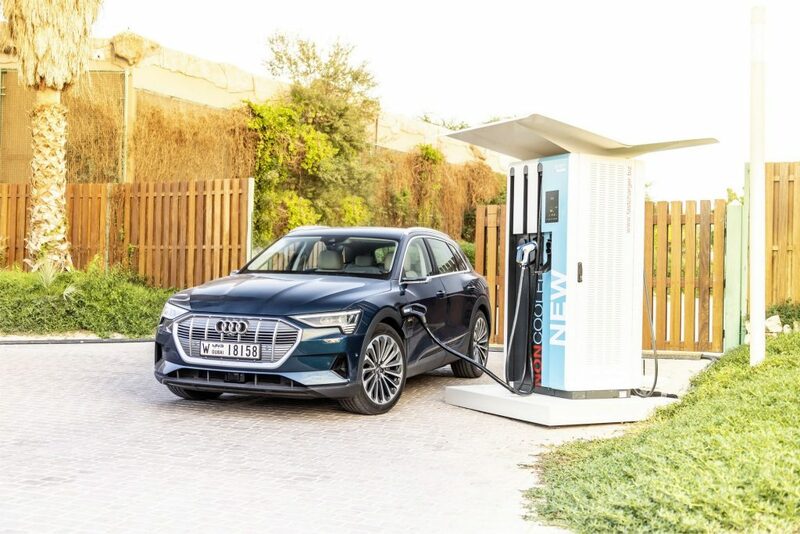 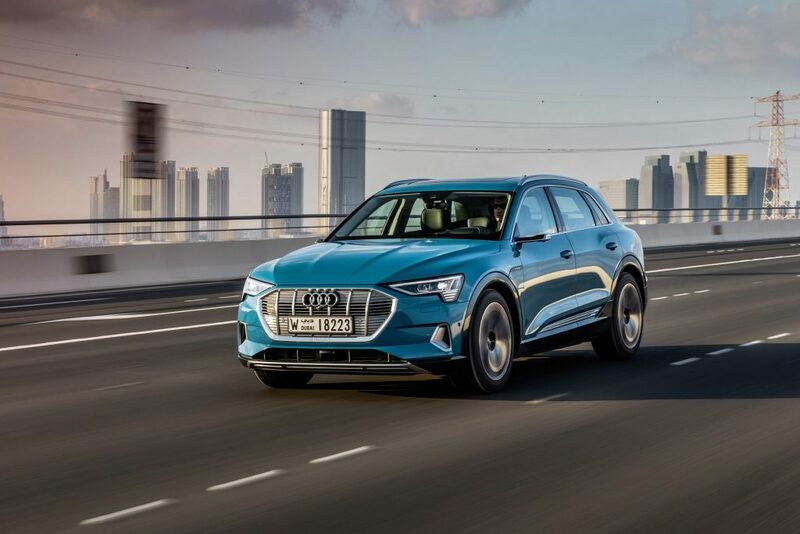 There is an obvious synergy between the Audi e-tron test drive, our own investment to help commercialize future mobility solutions here at Masdar City, and the broader commitment of Abu Dhabi to provide a global platform for collaboration through initiatives such as Abu Dhabi Sustainability Week,” declares Yousef Baselaib. 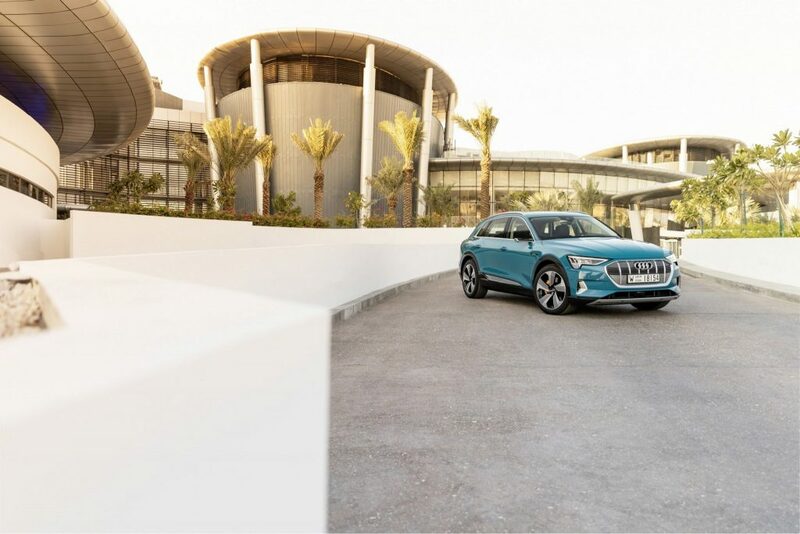 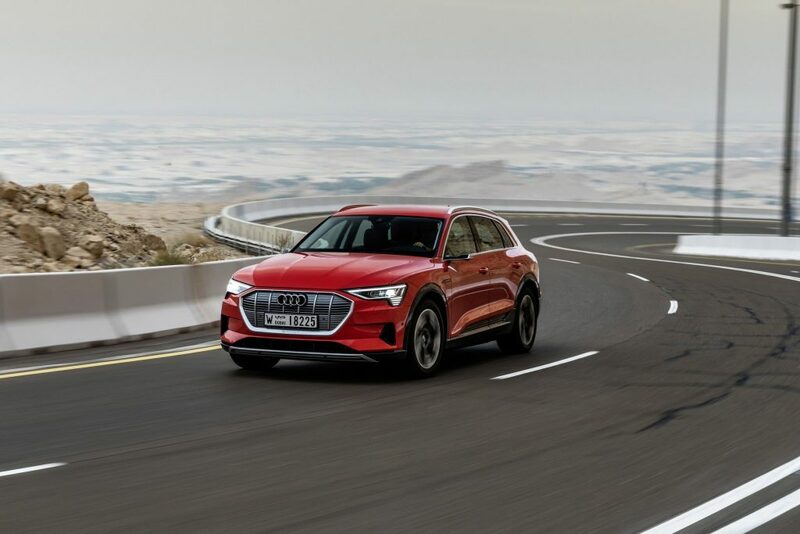 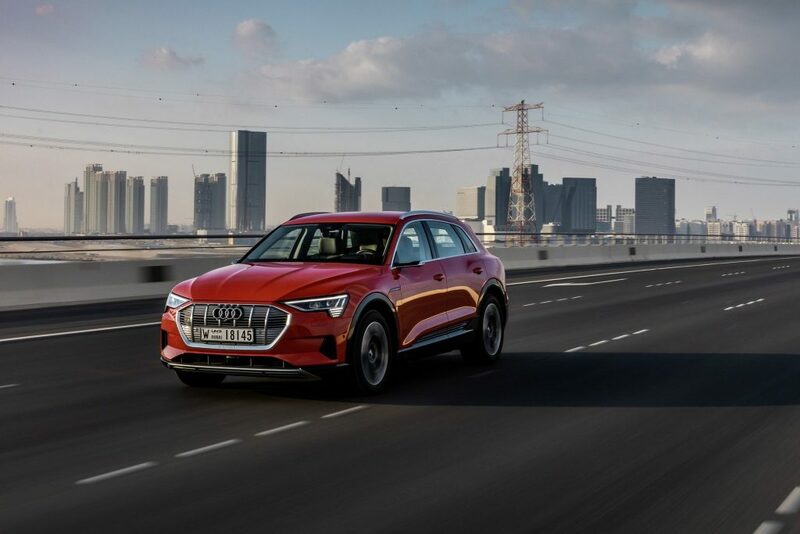 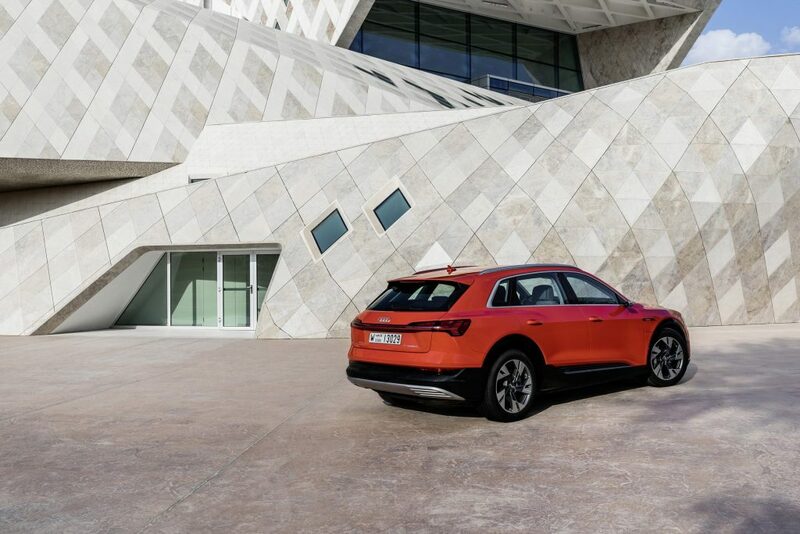 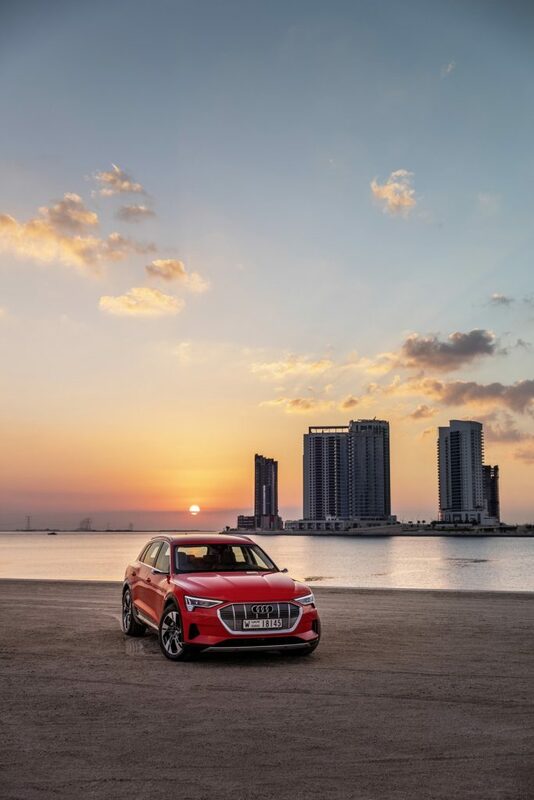 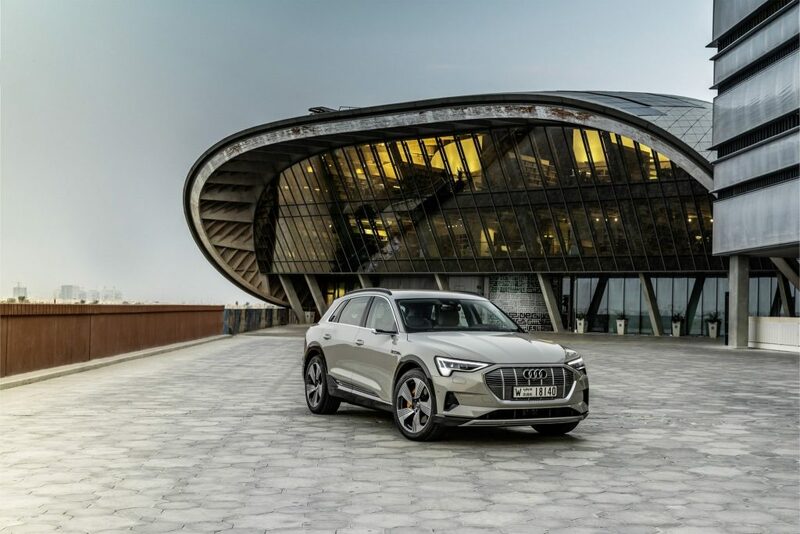 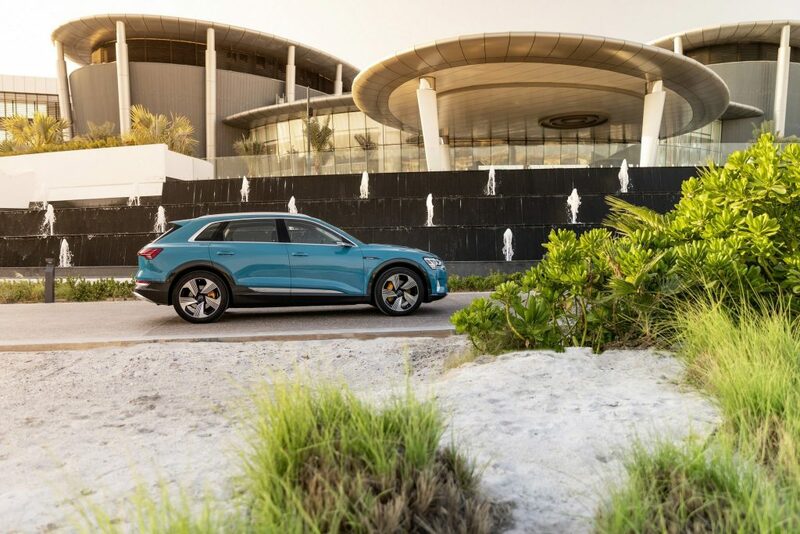 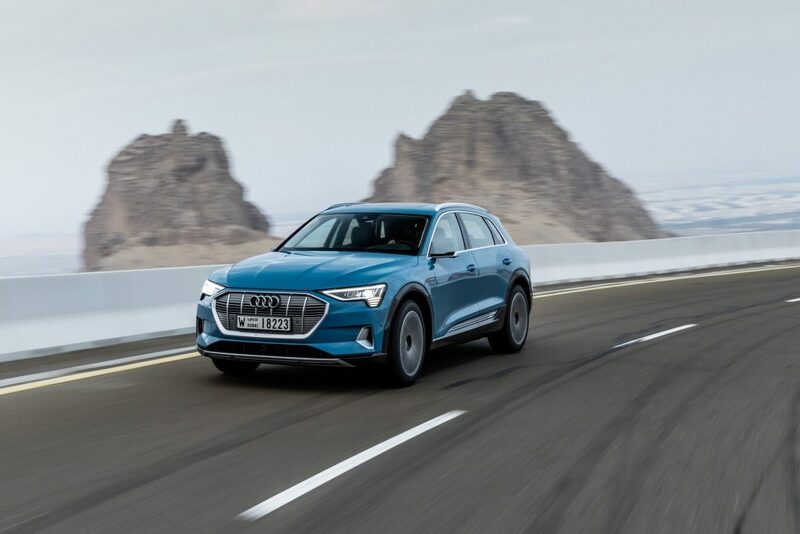 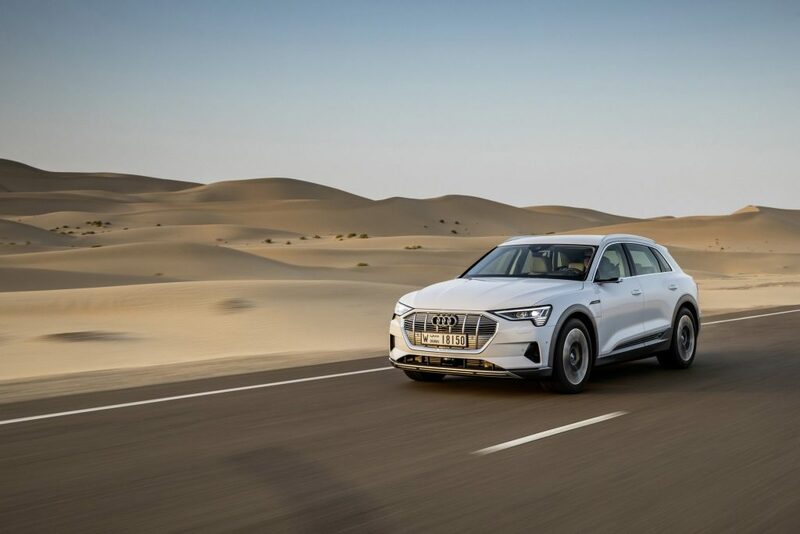 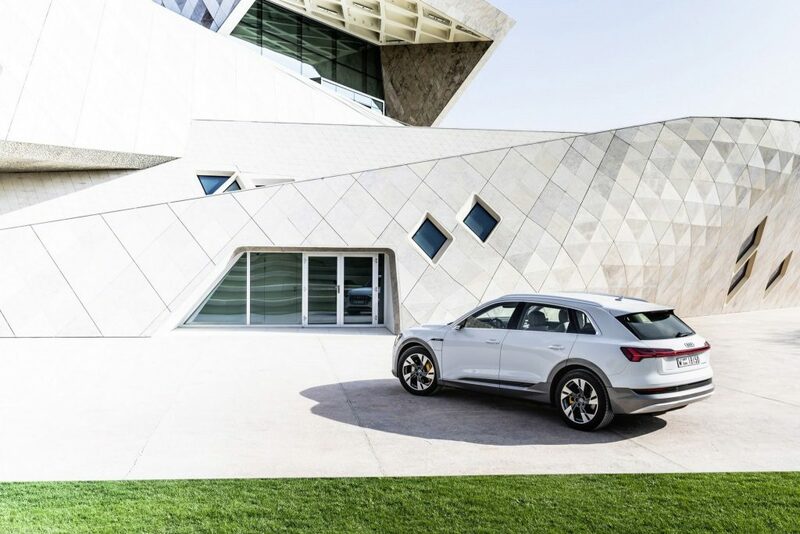 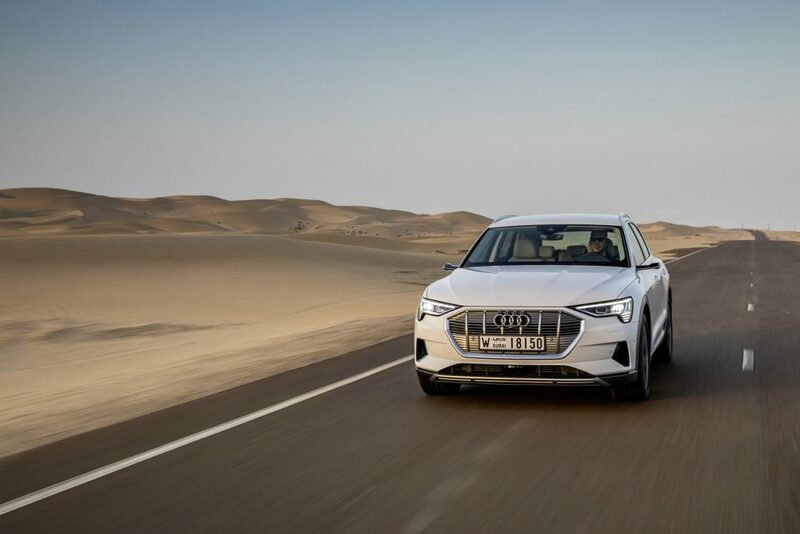 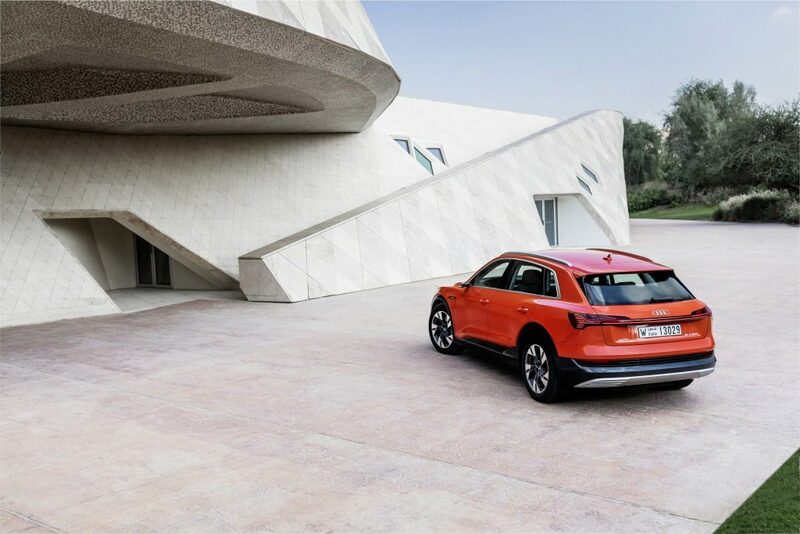 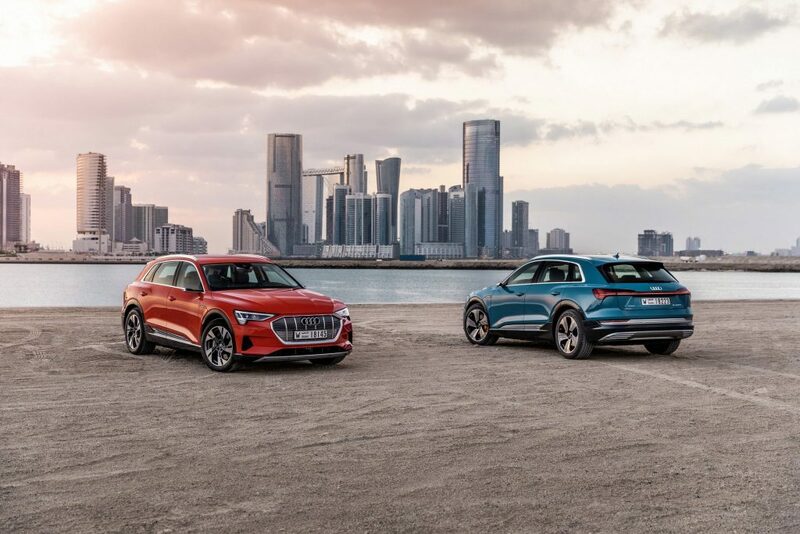 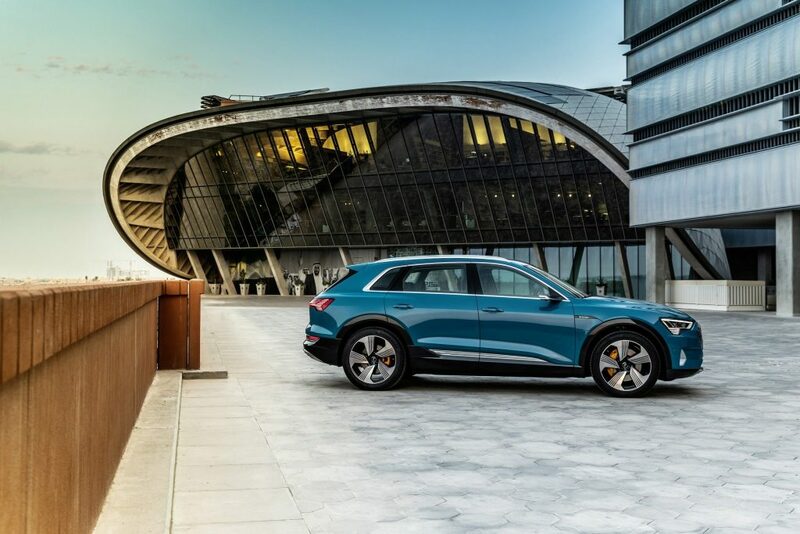 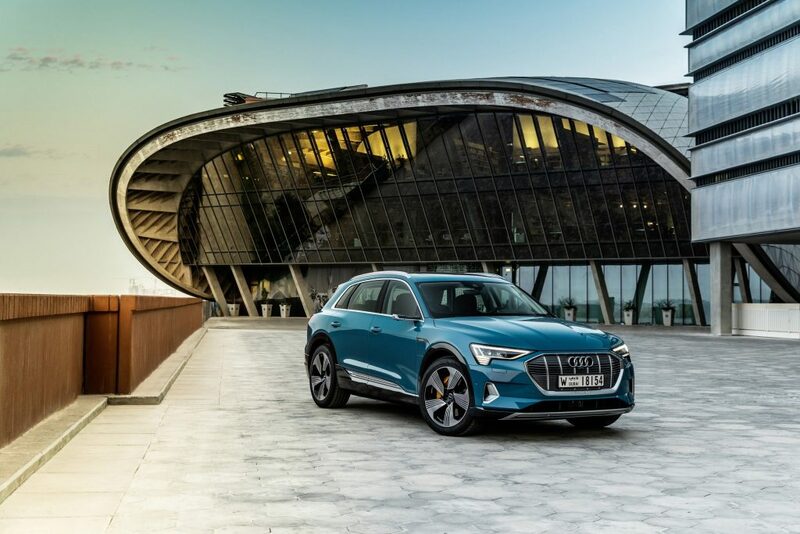 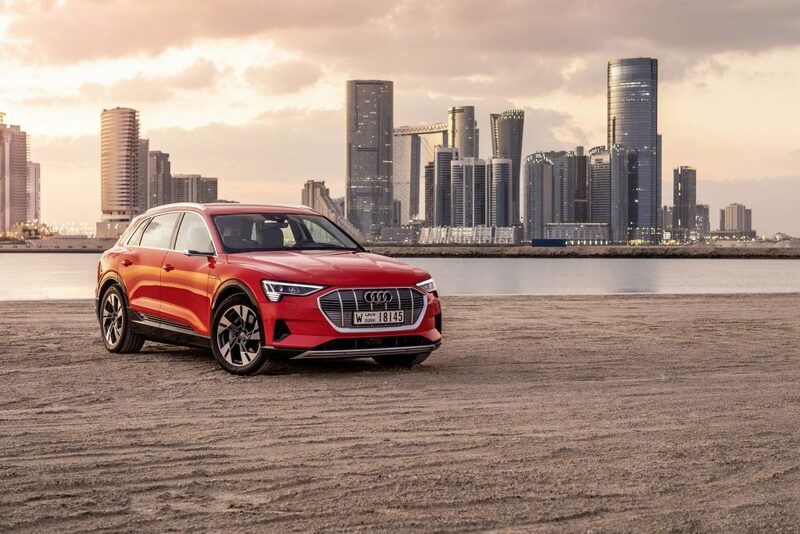 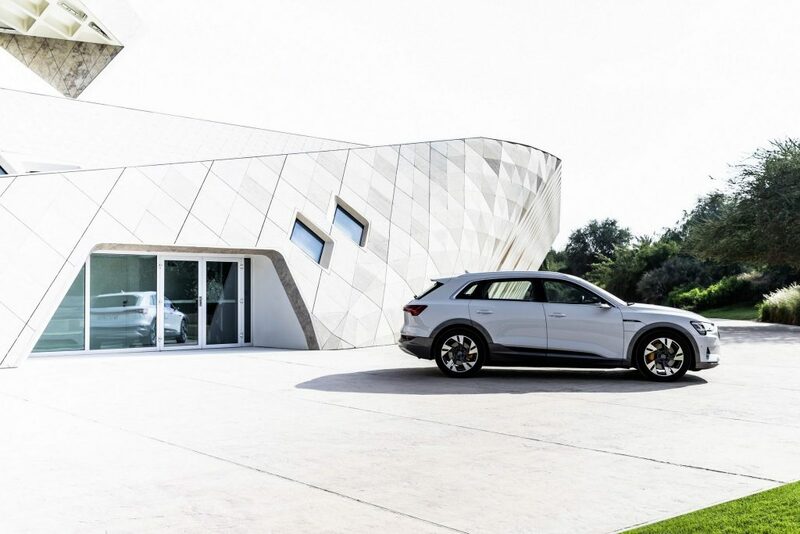 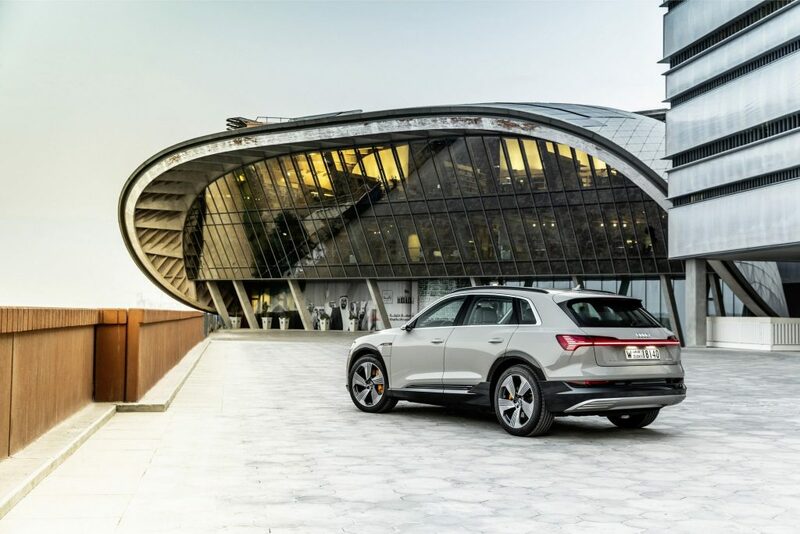 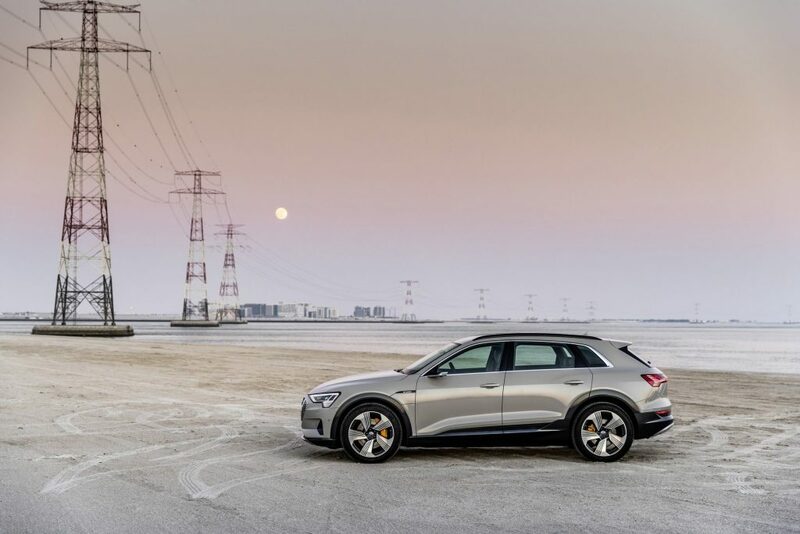 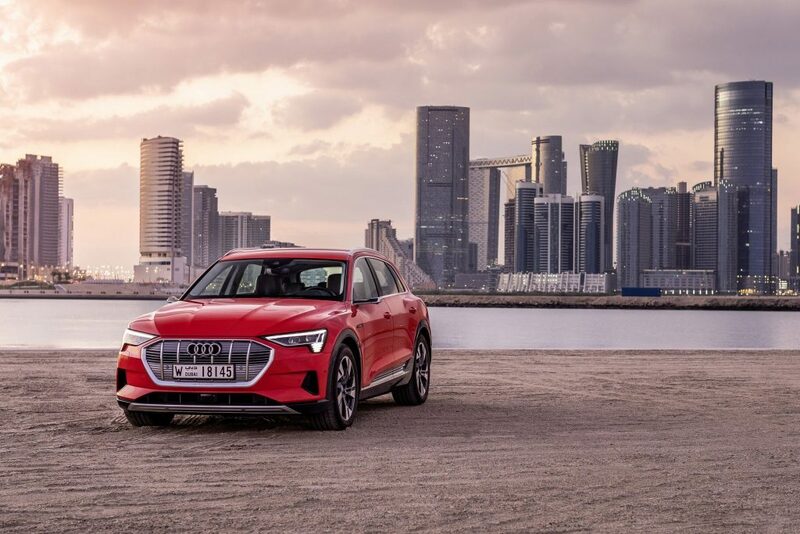 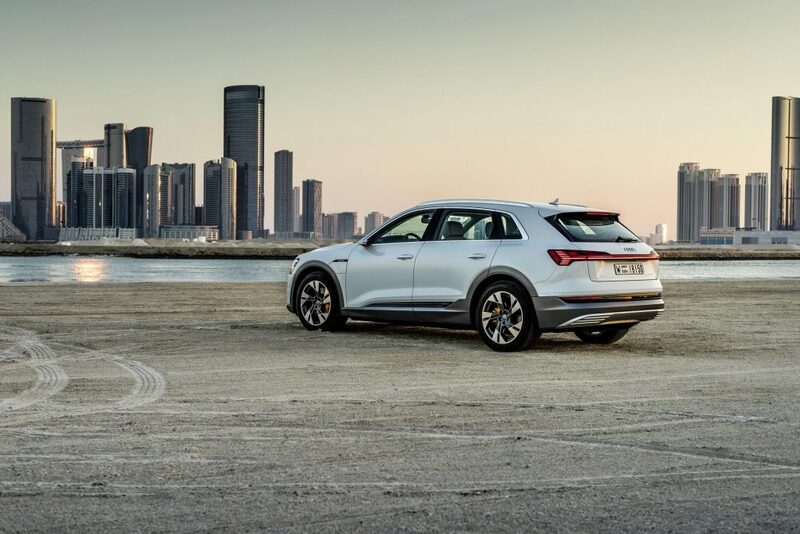 The intelligent overall concept of the Audi e-tron primarily comprises sustainable production, a locally CO2-neutral drive system and reliable charging service. 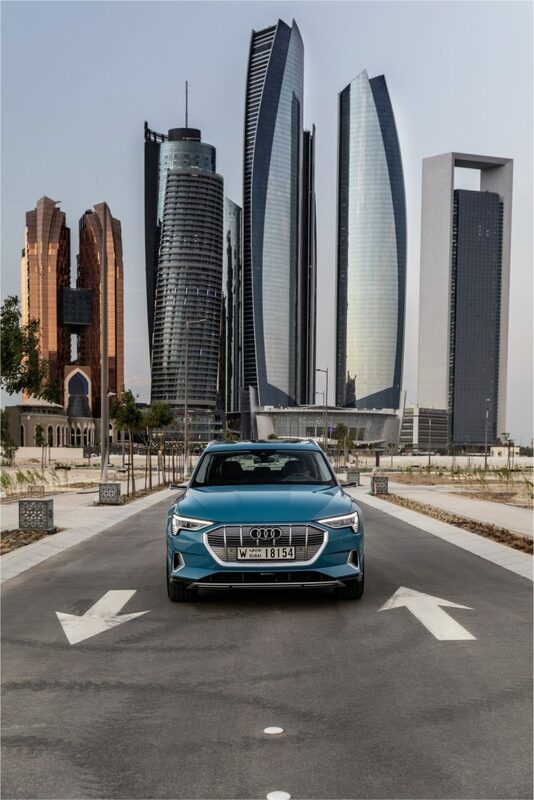 “In Masdar City, the future of mobility meets life in the cities of the future – emission-free, ecological and sustainable. 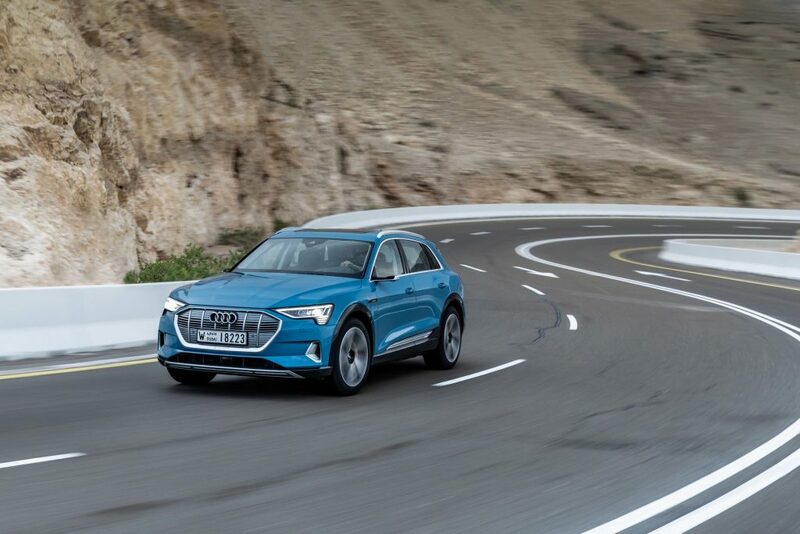 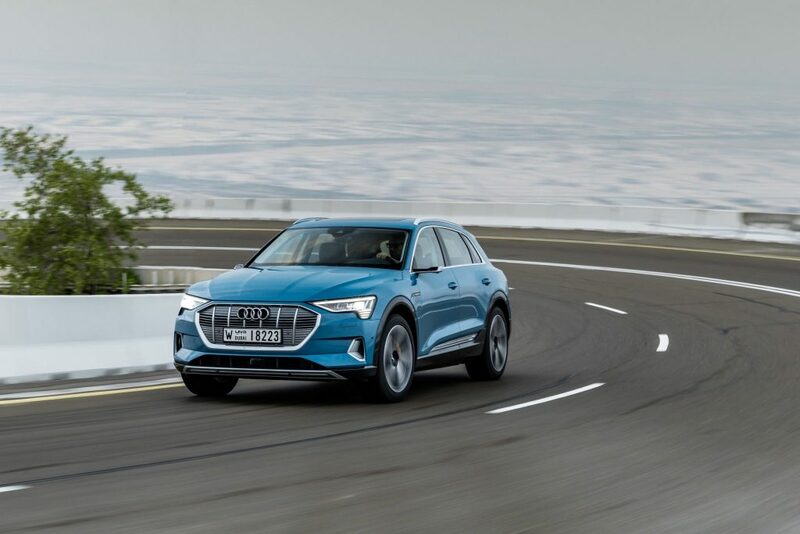 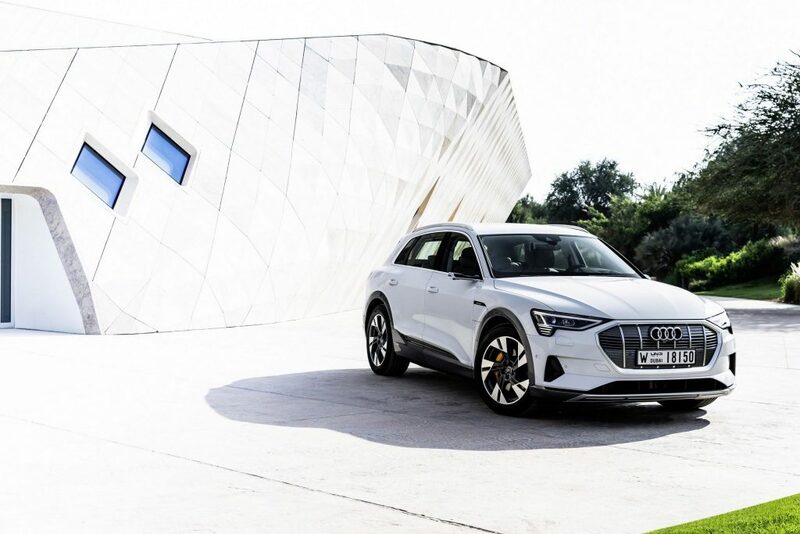 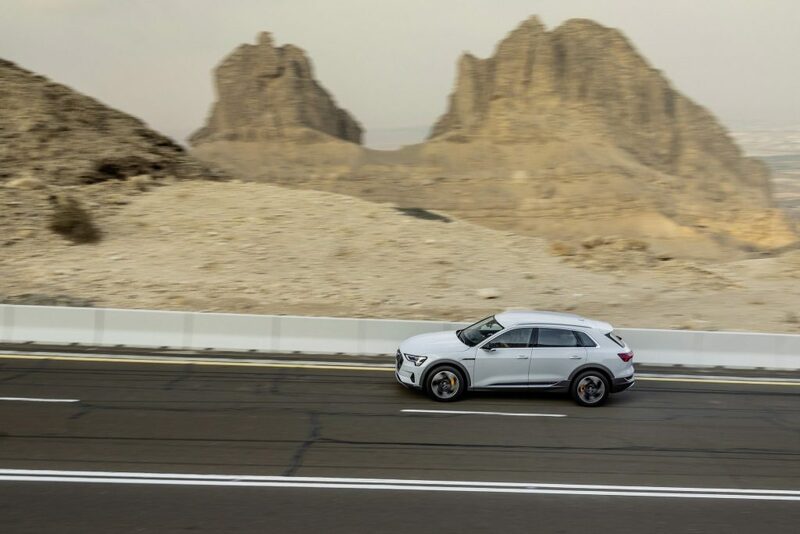 This is the perfect starting point for the Audi e-tron driving event,” says Peter Oberndorfer, Head of Product and Technology Communications. 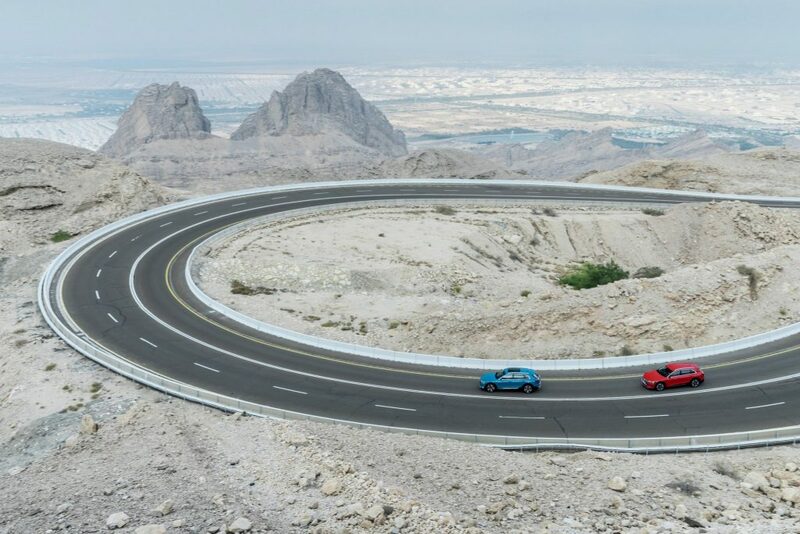 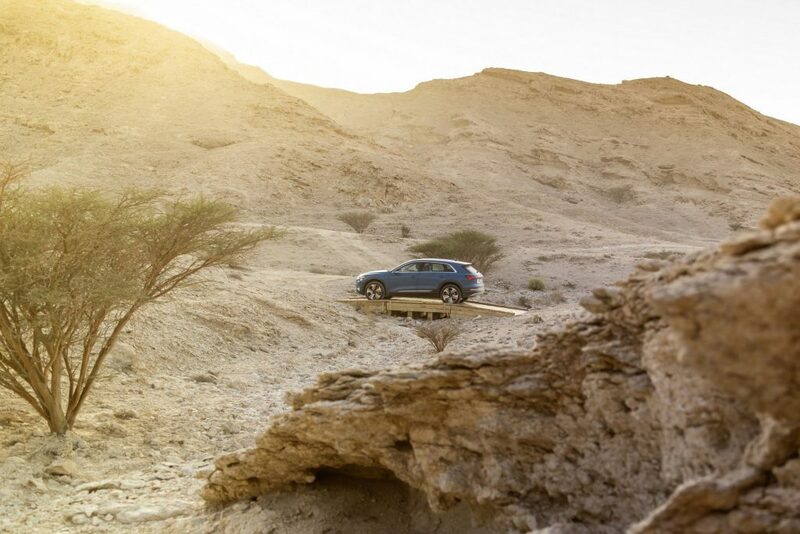 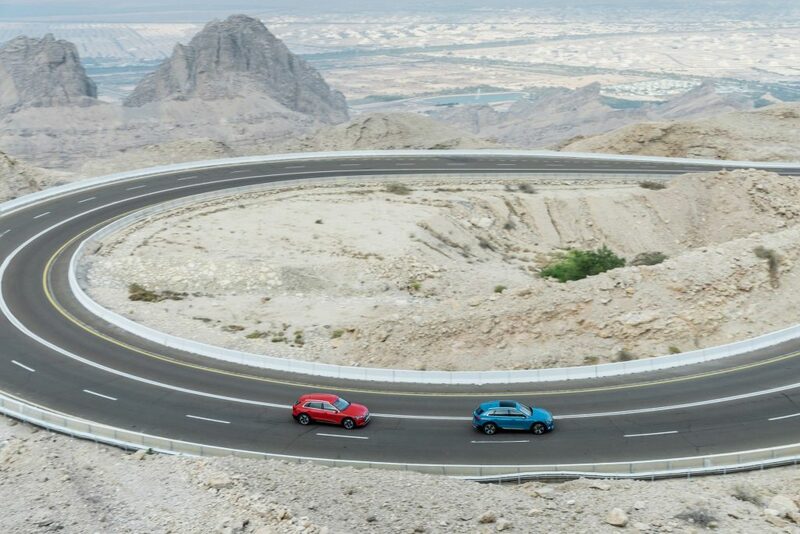 On highways and through switchbacks, the journalists drive to Jebel Hafeet, the second highest mountain in the United Arab Emirates. 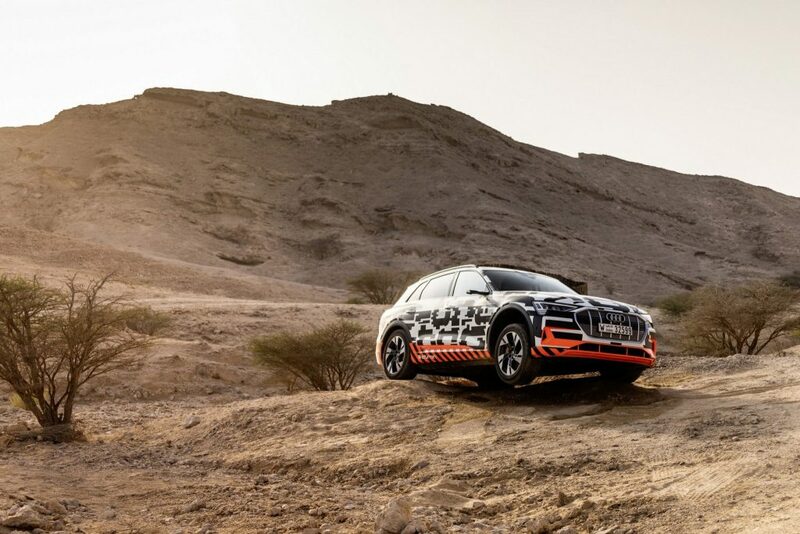 There, the Audi e-tron demonstrates its innovative recuperation system. 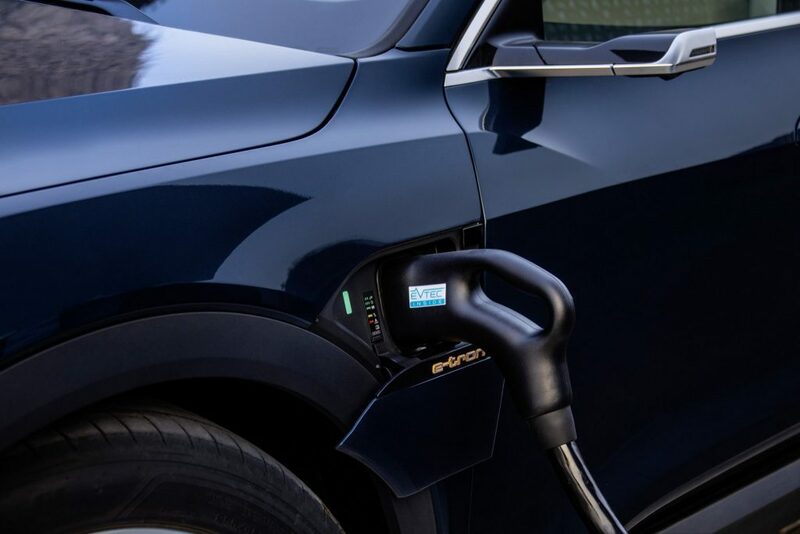 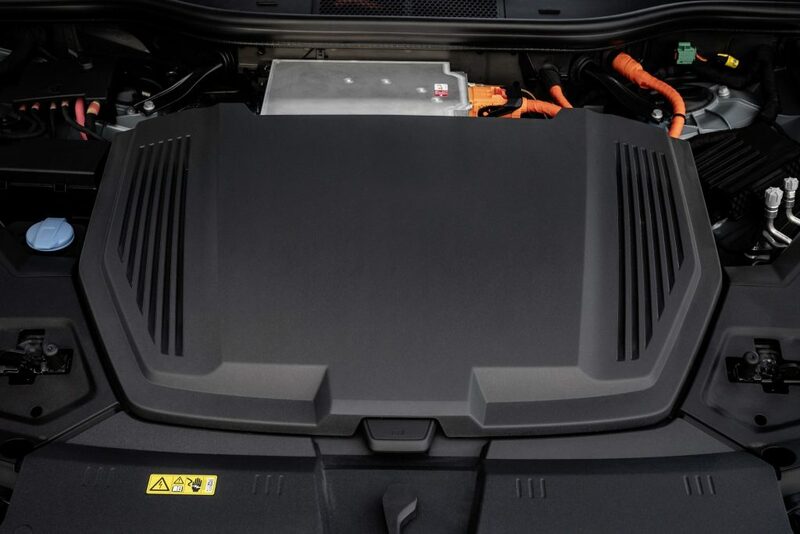 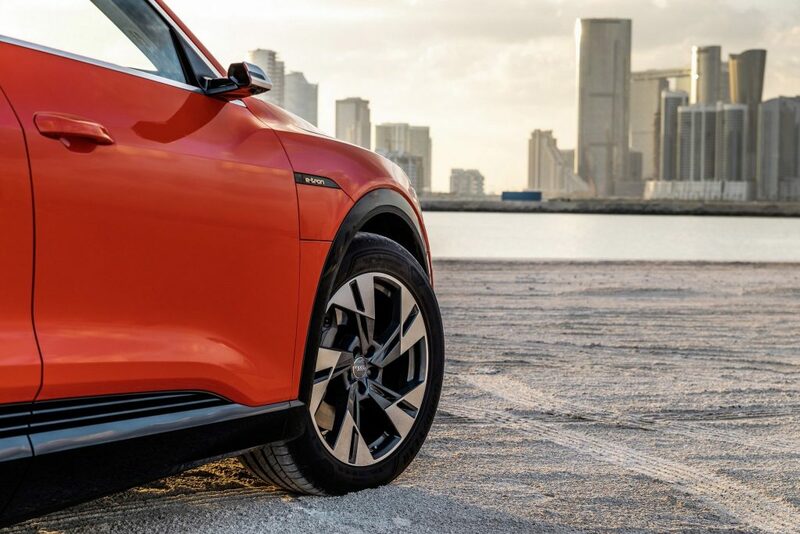 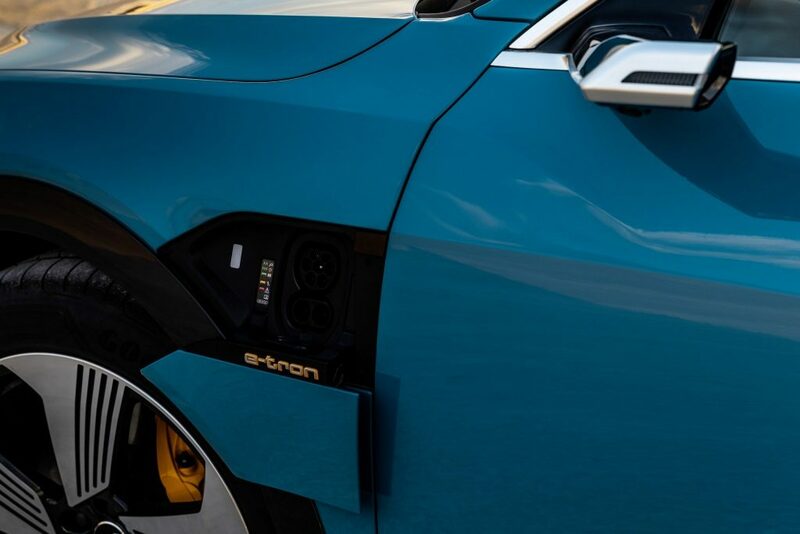 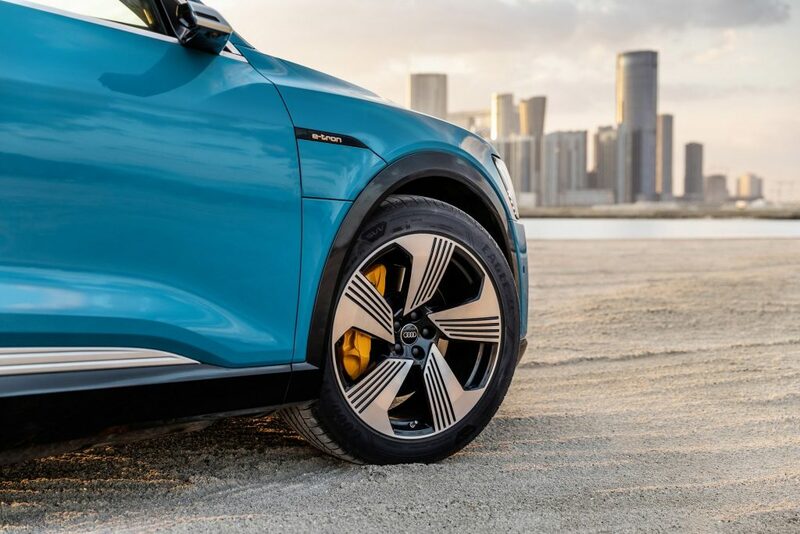 On average in more than 90 percent of all deceleration, the electric motors operate as generators and convert the SUV’s kinetic energy into electrical energy. 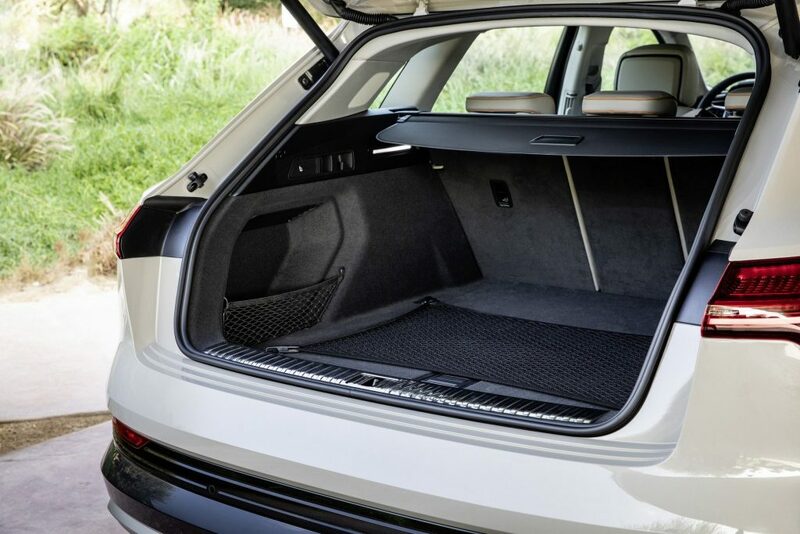 In this way, the system contributes up to 30 percent of the range. 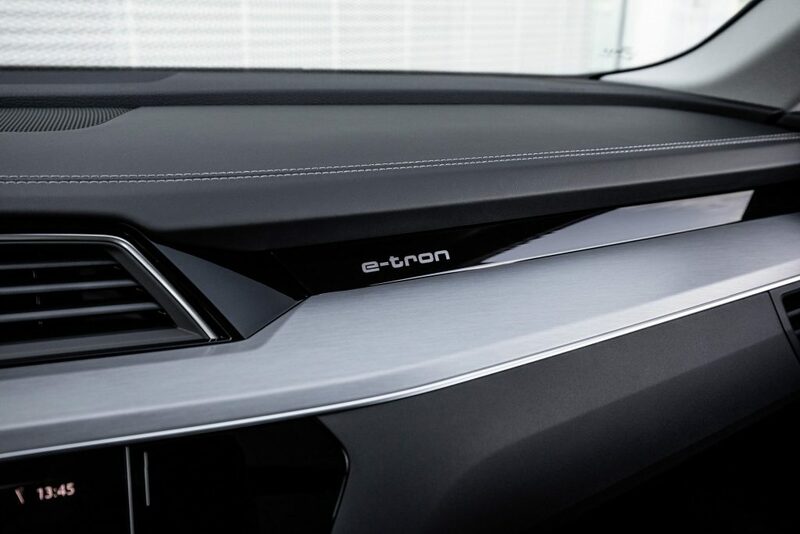 It operates intelligently with the electro-hydraulically integrated brake control system. 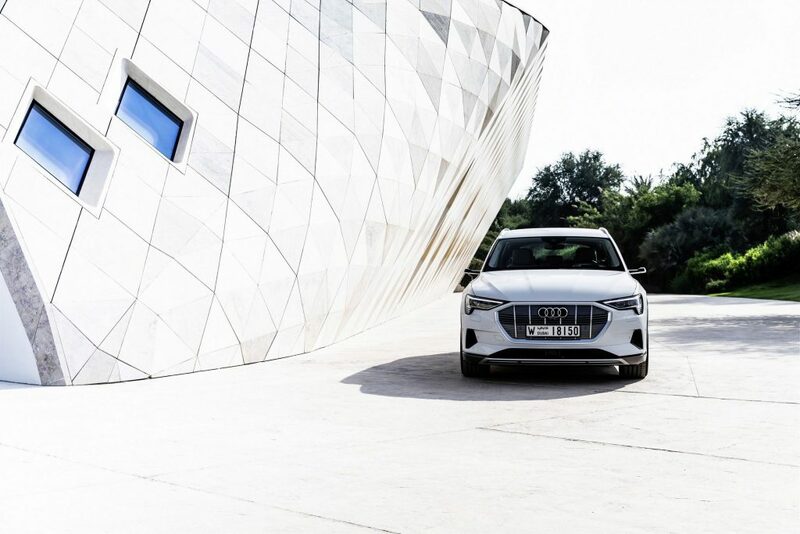 Audi is the world’s first manufacturer to use this in an electrically driven series-production car. 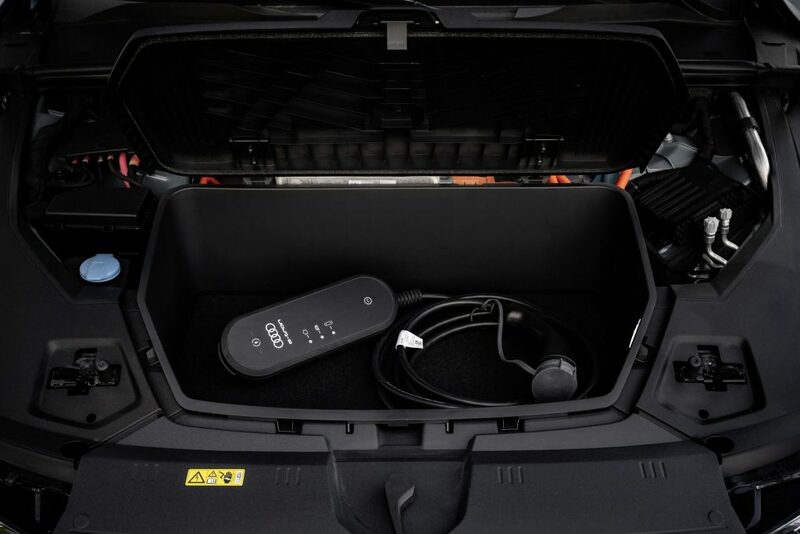 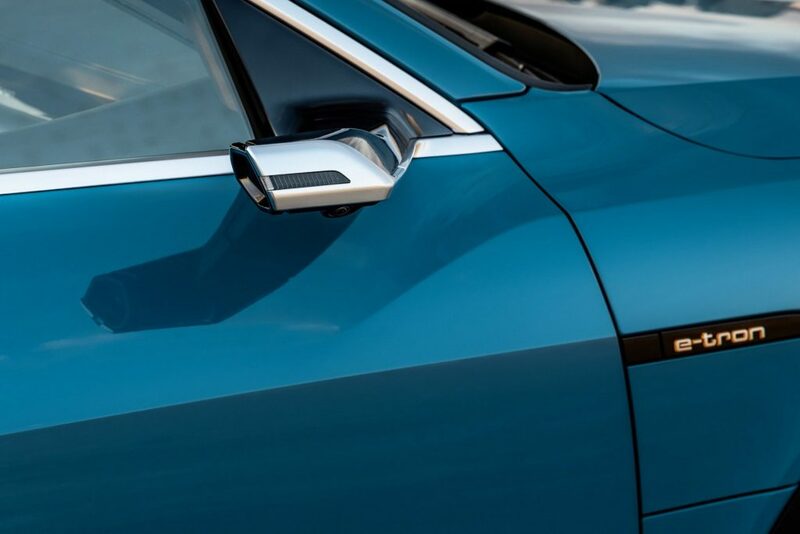 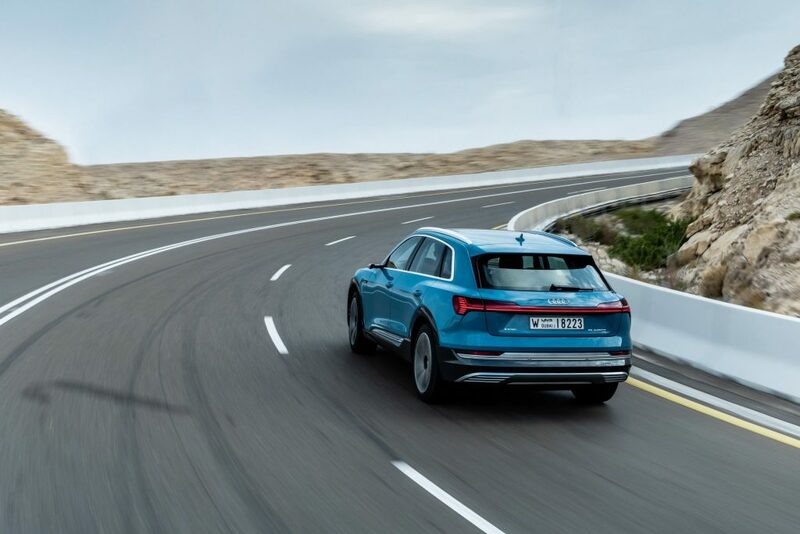 Depending on the driving situation, the brake control system decides whether the car uses the electric motor, wheel brake or a combination of both to decelerate – with this taking place individually at each axle. 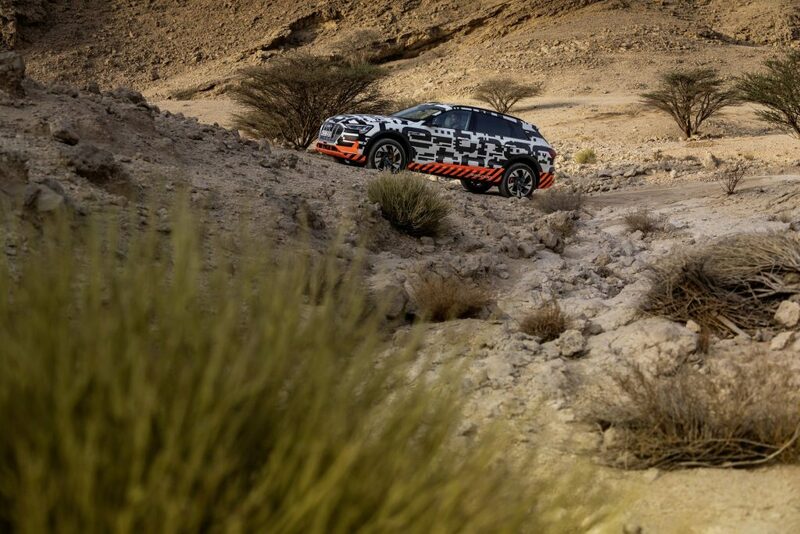 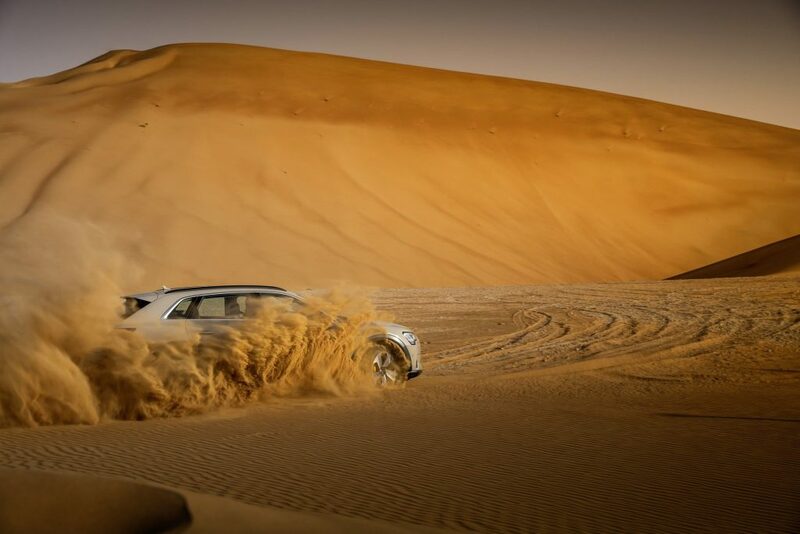 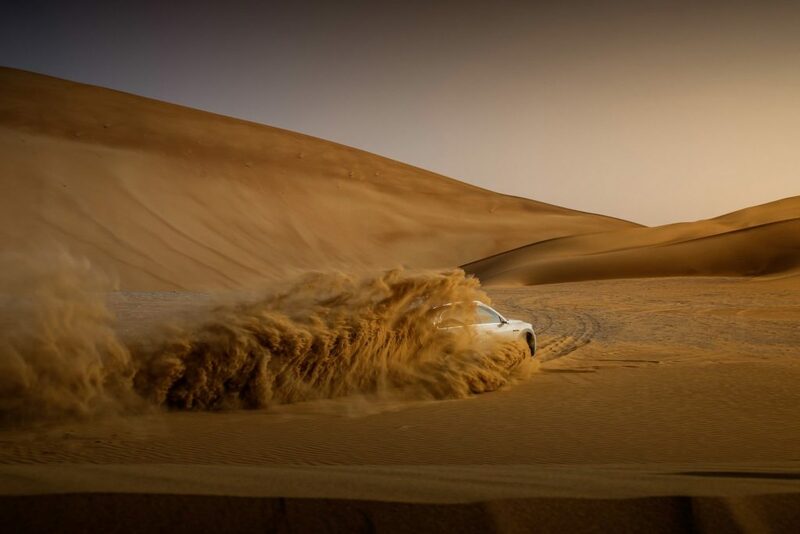 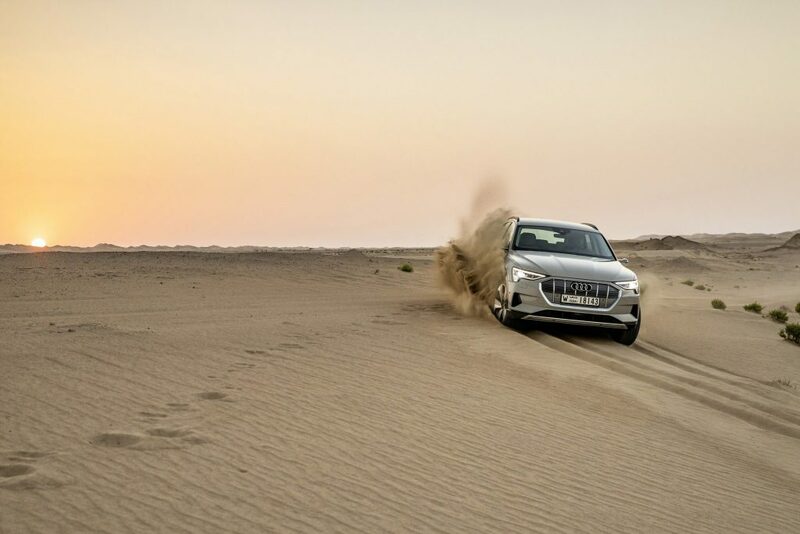 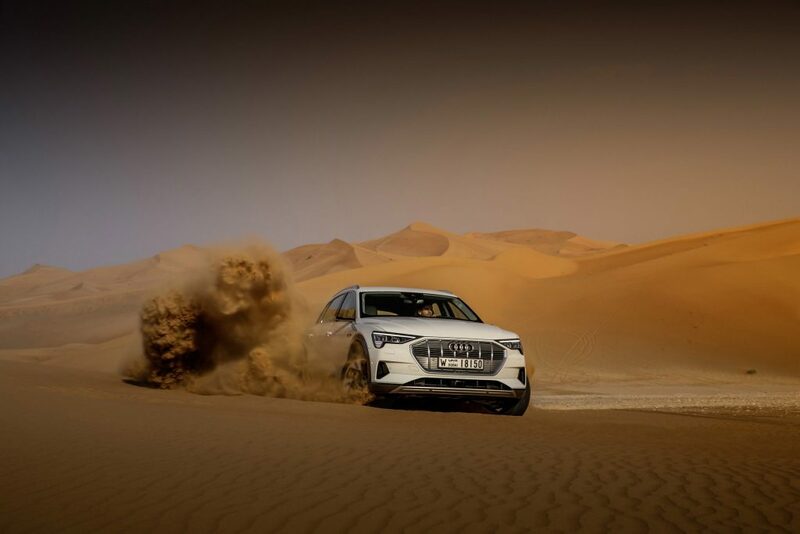 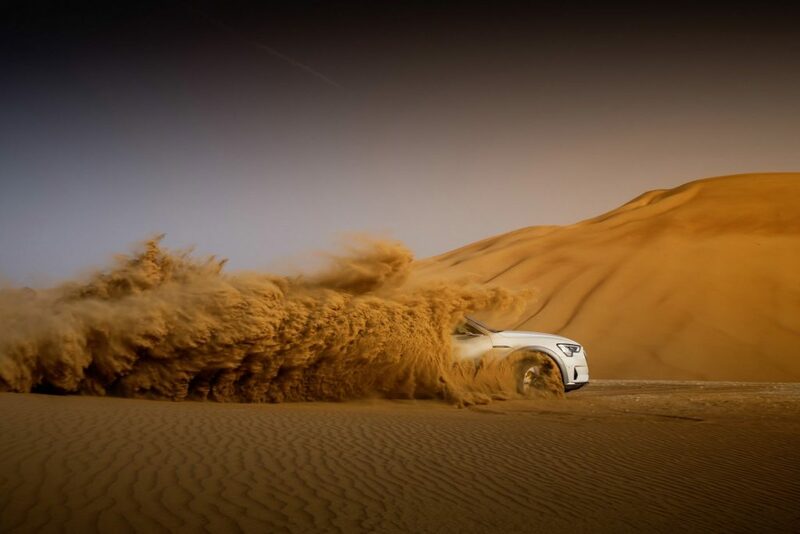 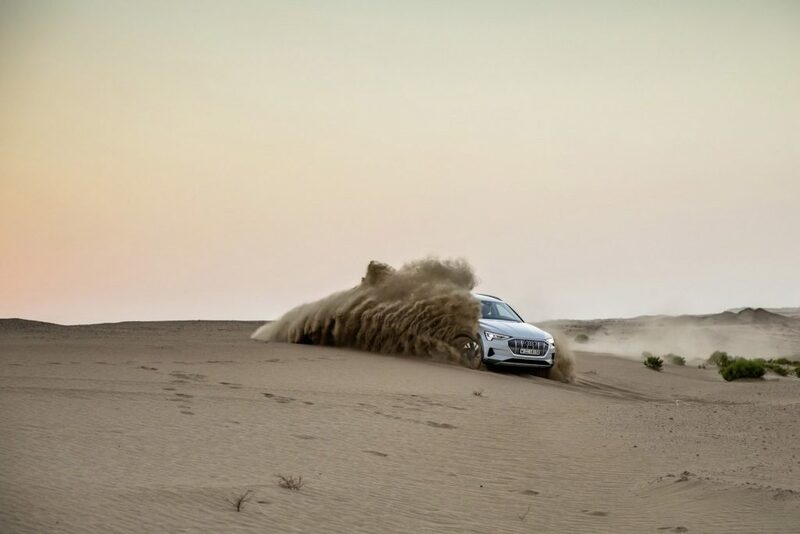 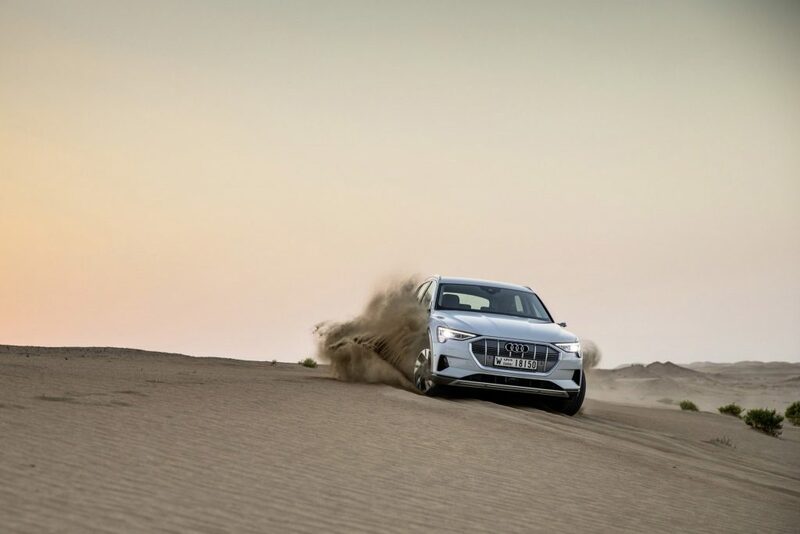 Part of the test drive route is on gravel tracks and desert sand. 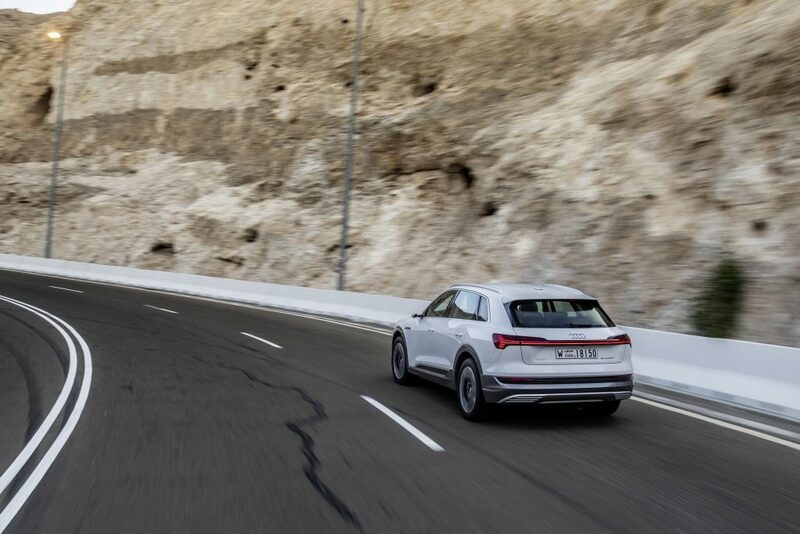 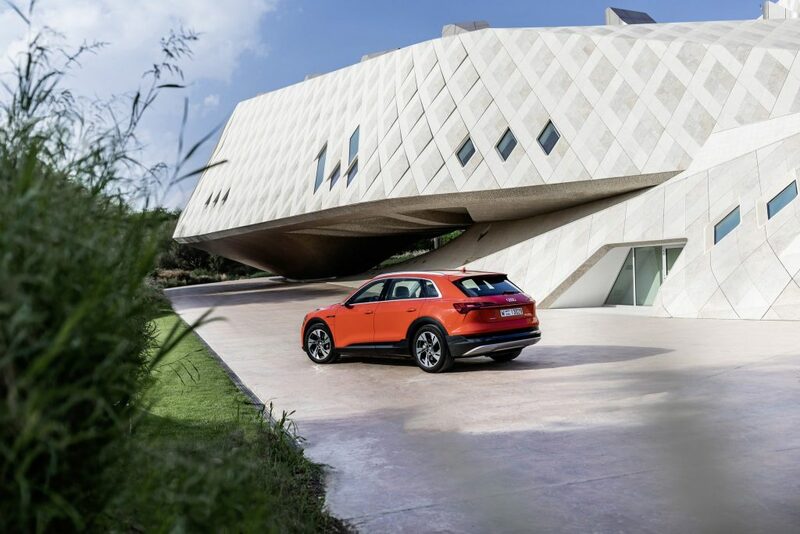 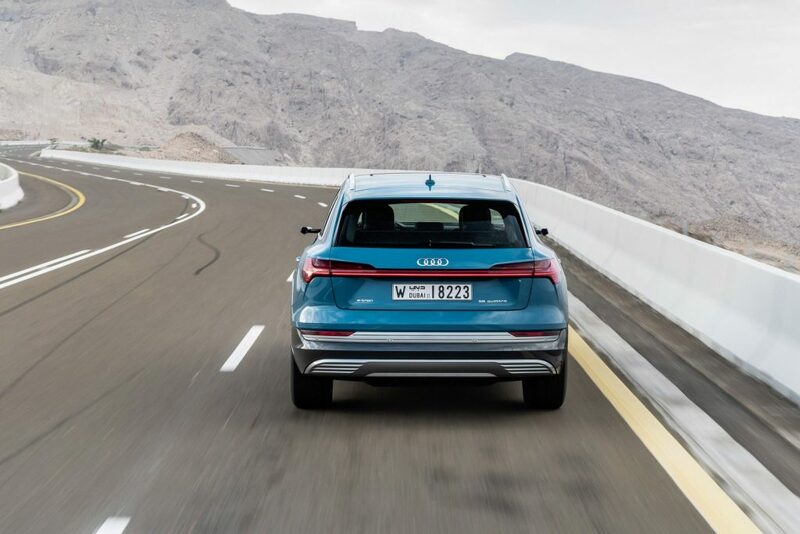 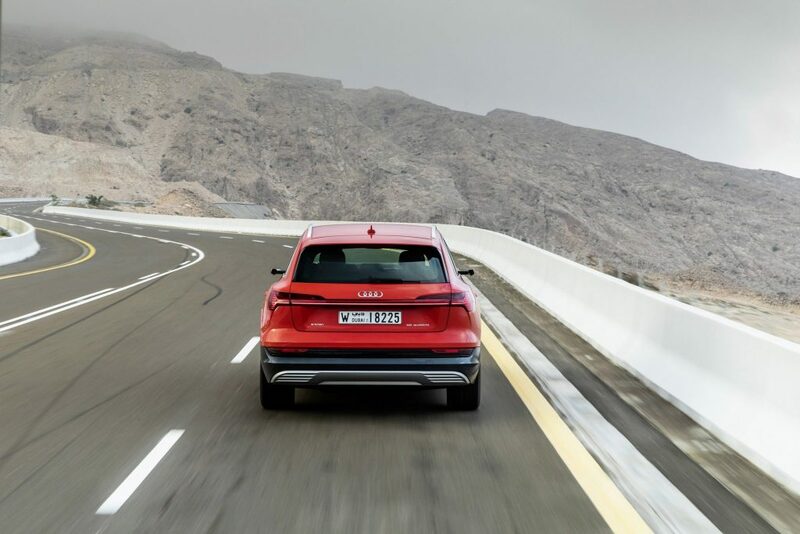 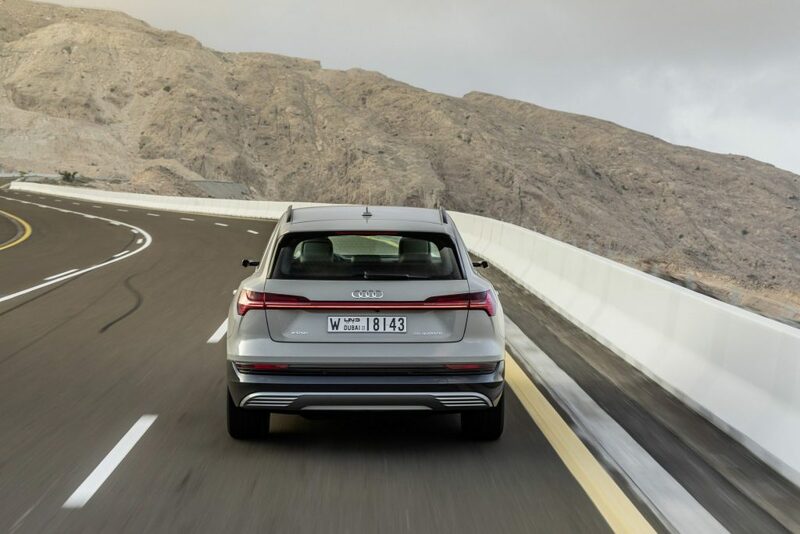 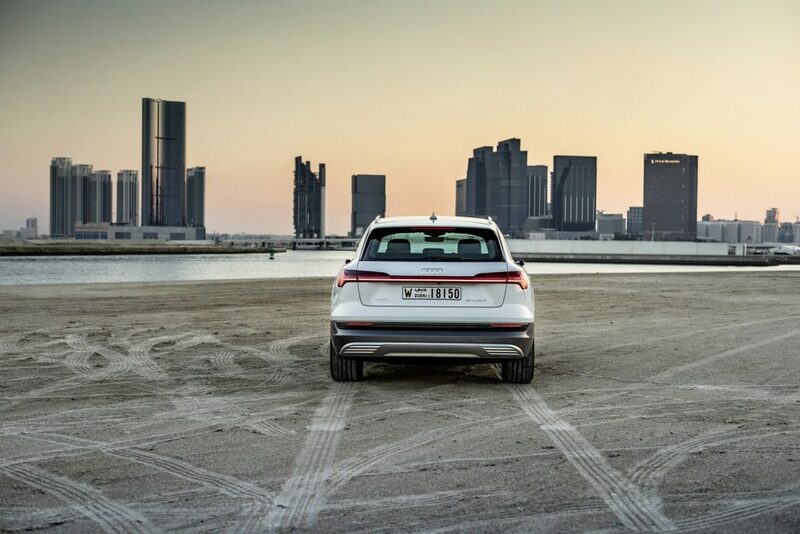 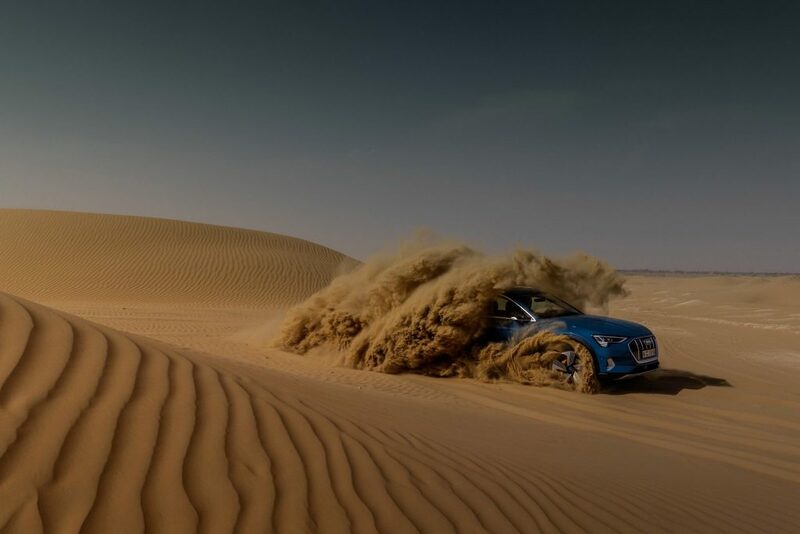 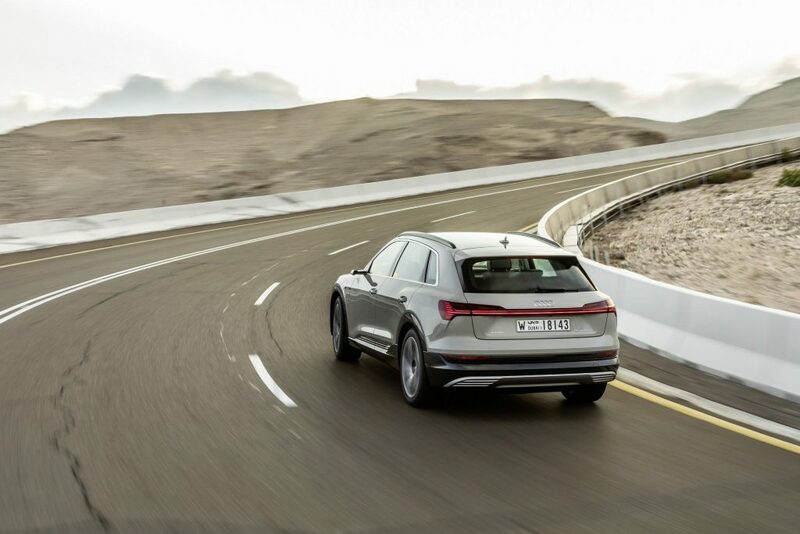 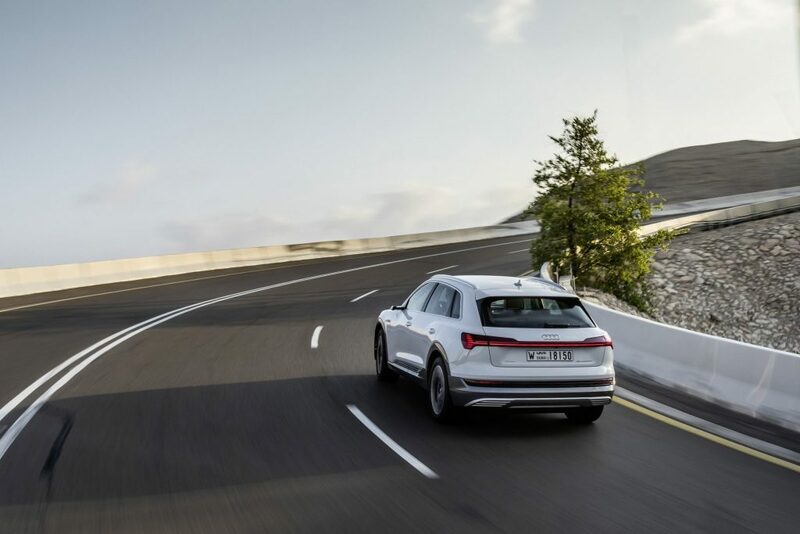 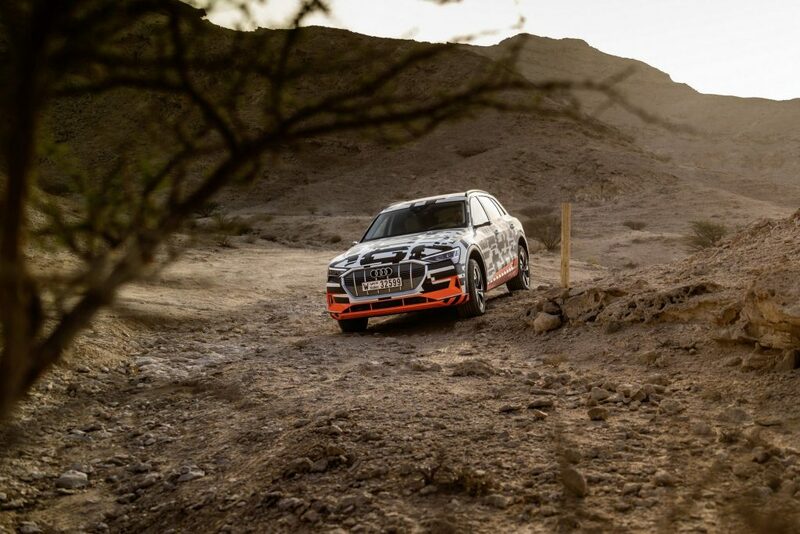 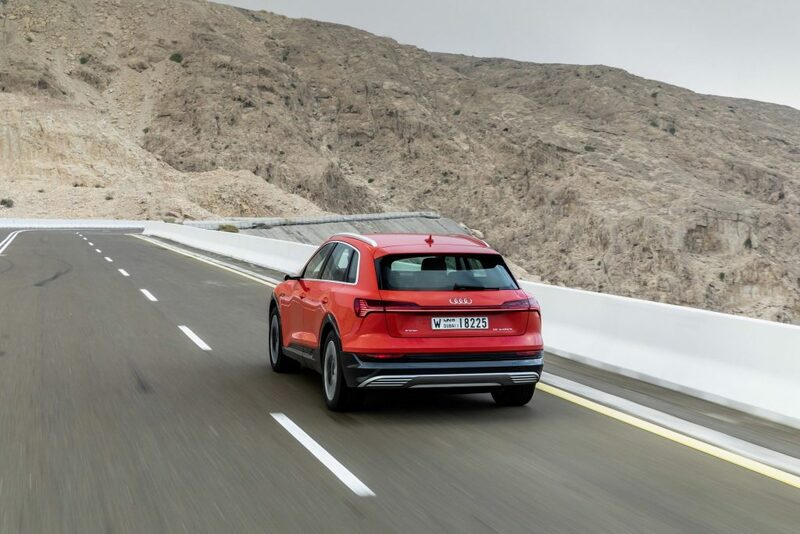 On this loose surface, the Audi e-tron demonstrates its excellent traction and dynamics. 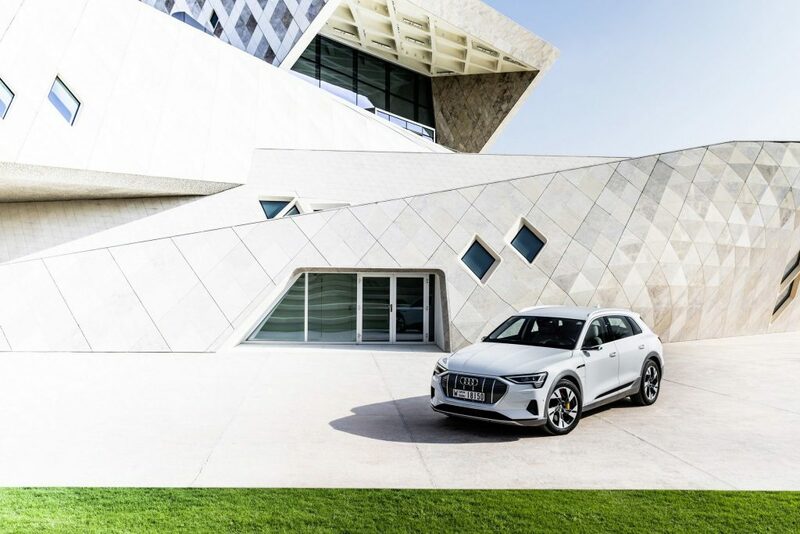 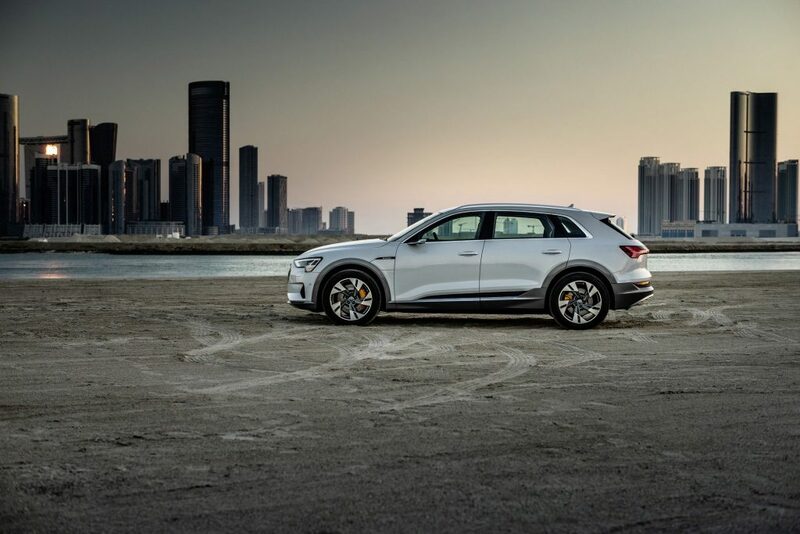 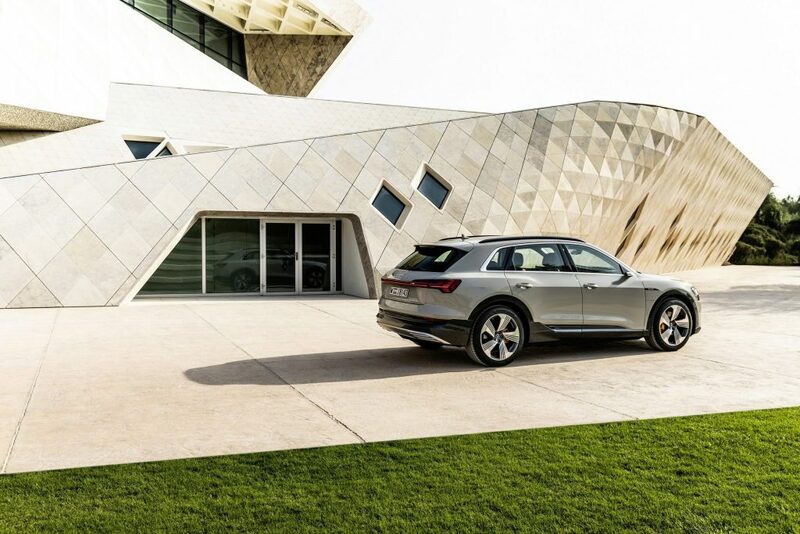 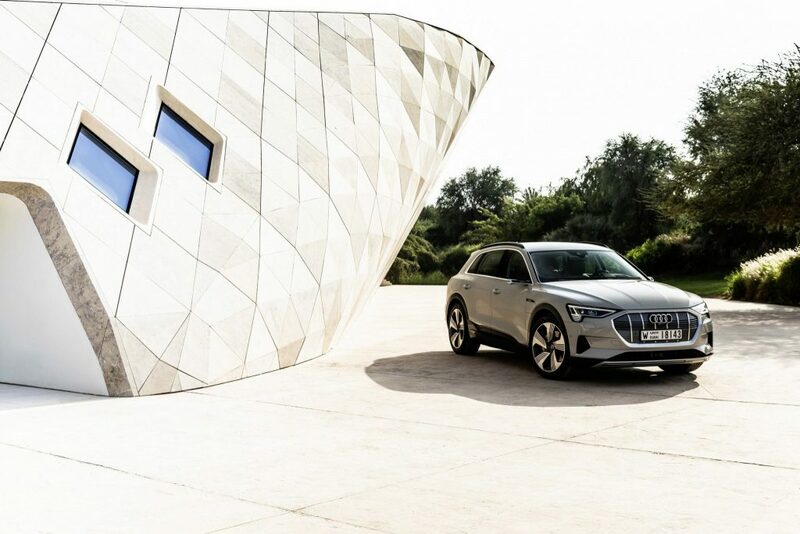 This is all made possible thanks to a new generation of quattro drive – the electric all-wheel drive. 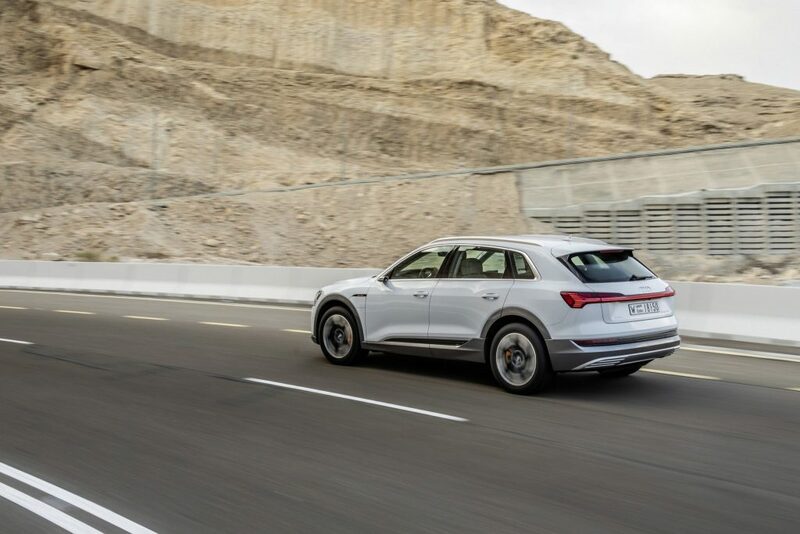 It ensures permanent and variable regulation of the ideal drive torque distribution between the two axles – within fractions of a second. 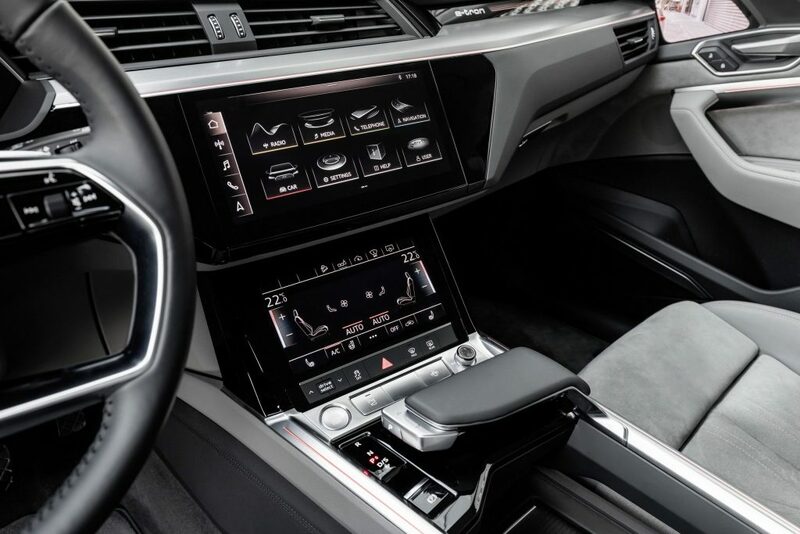 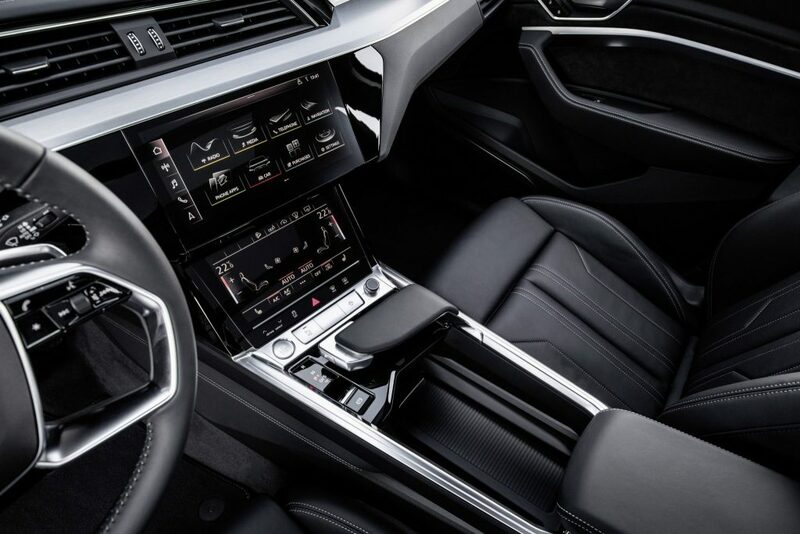 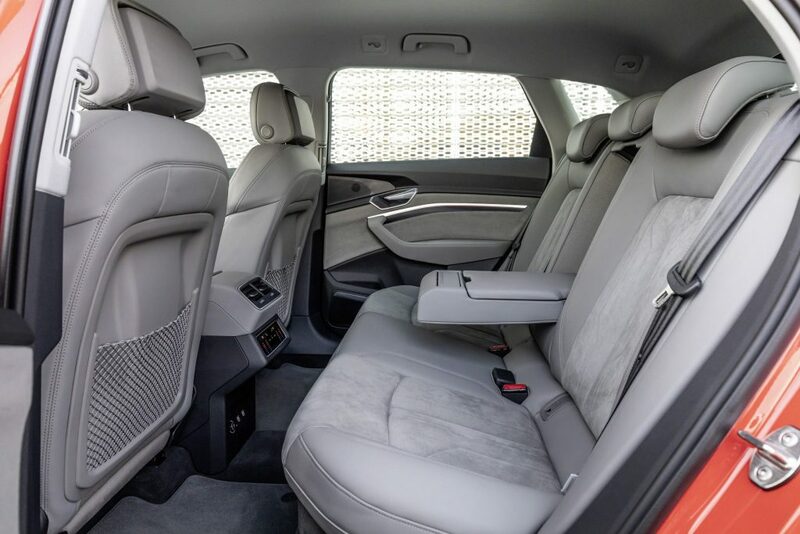 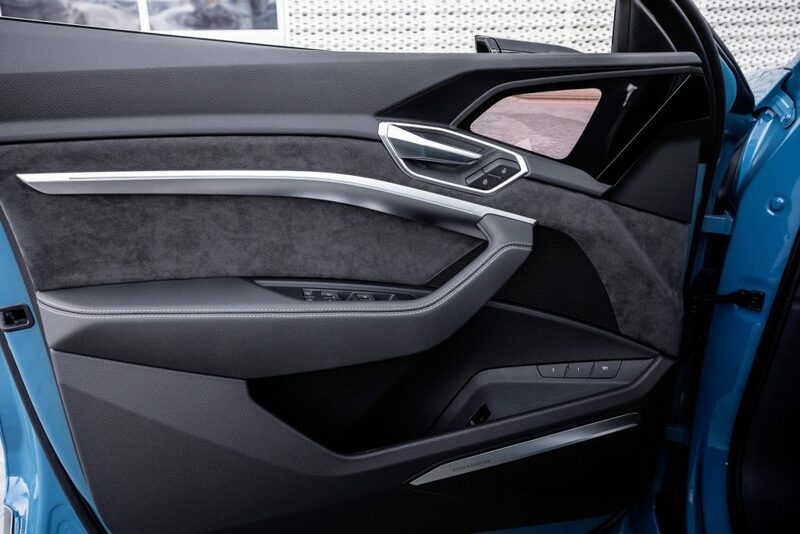 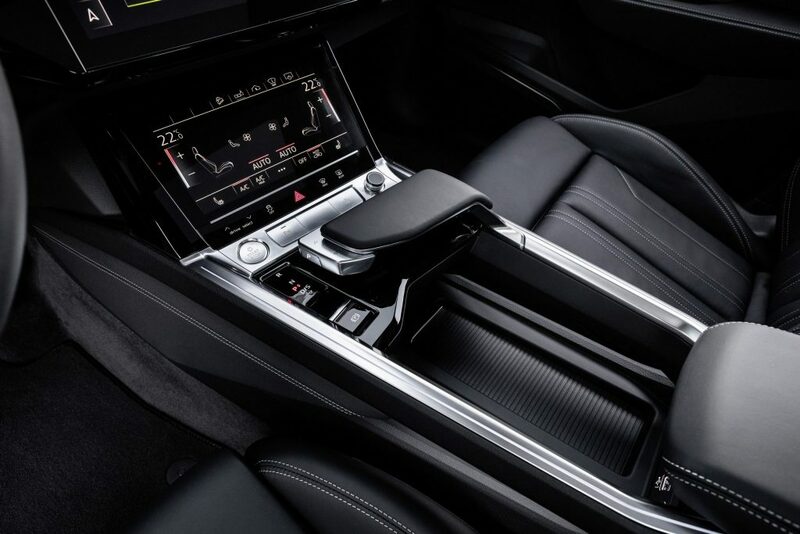 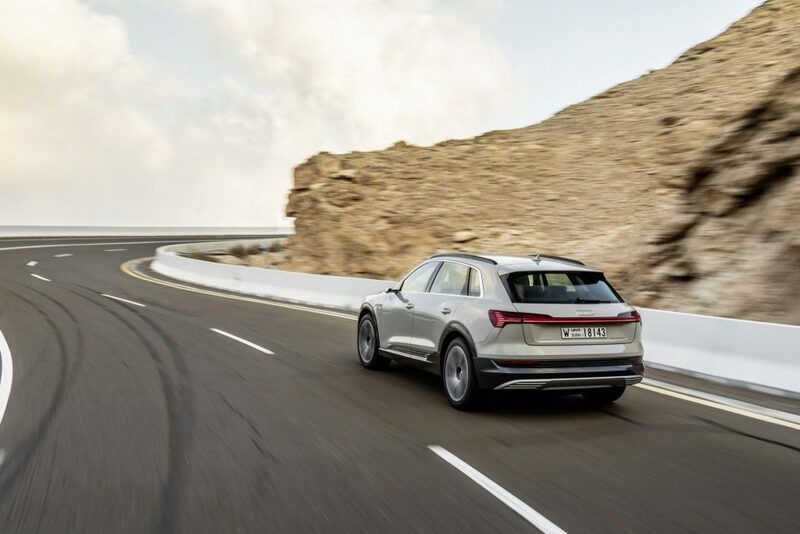 At the same time, it is intelligently networked with numerous chassis systems, above all the four-stage electronic stabilization control, which can also be switched off completely, and the standard Audi drive select dynamic handling system. 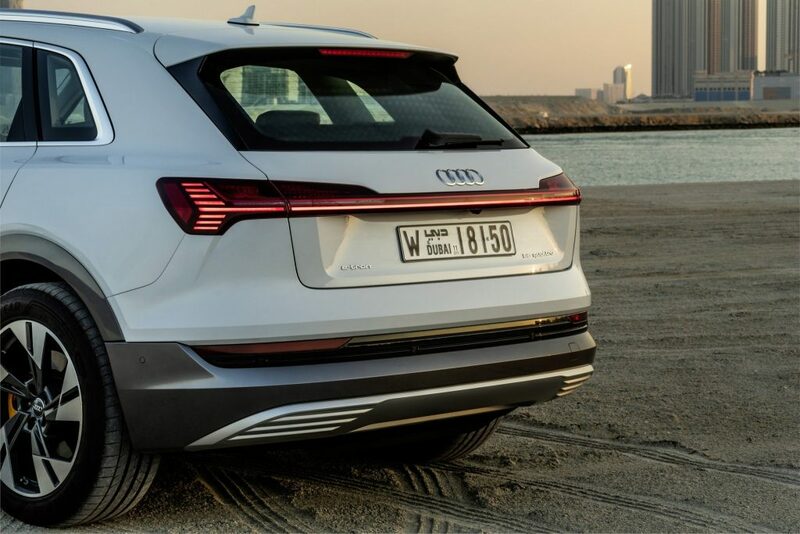 In addition to the drive characteristics, this also affects the factory-fitted air suspension. 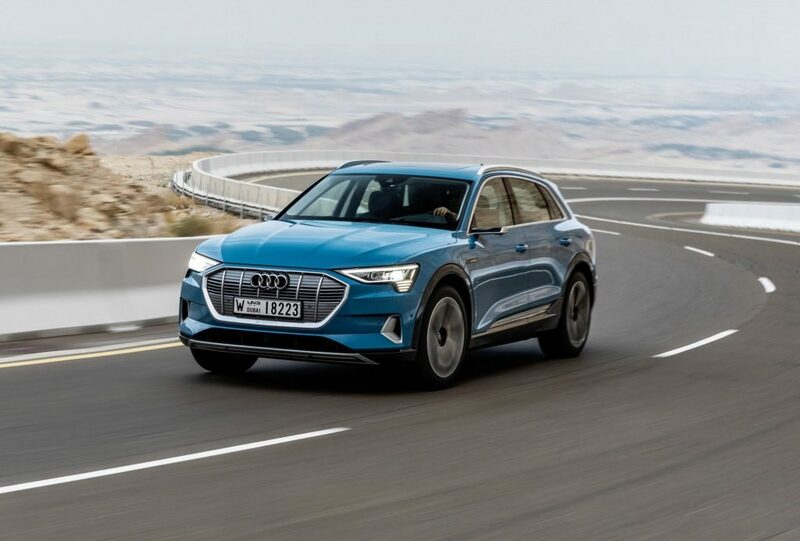 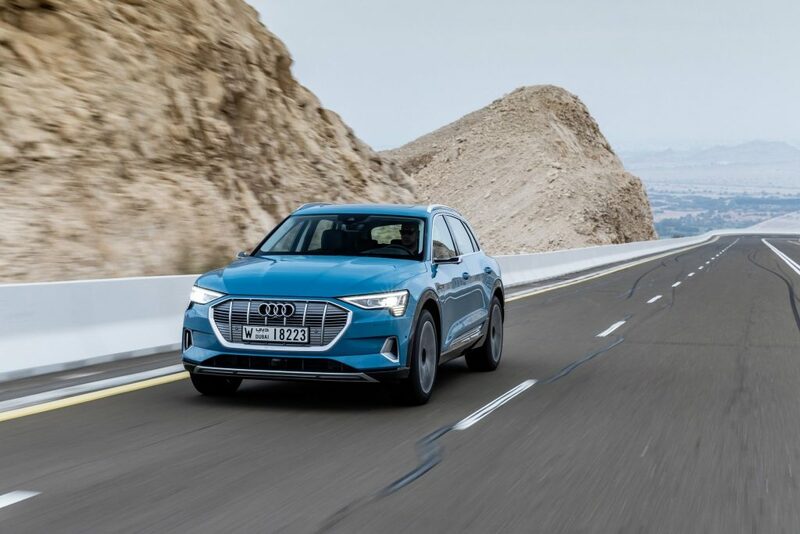 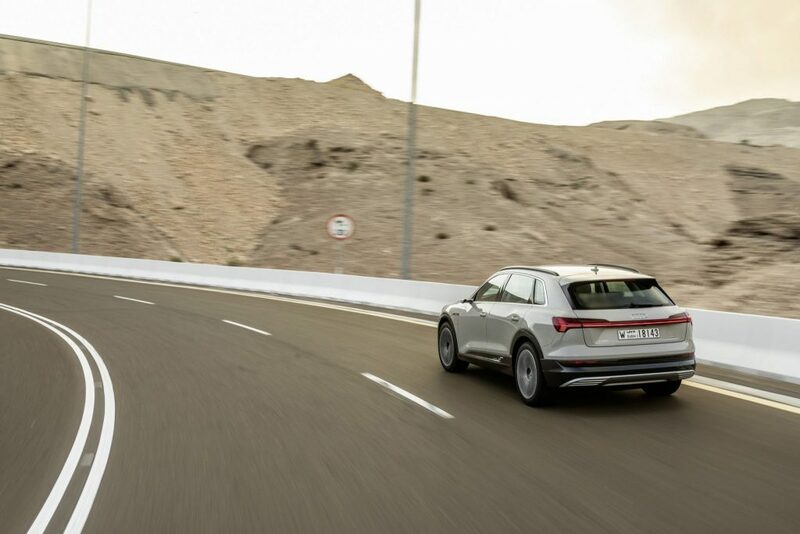 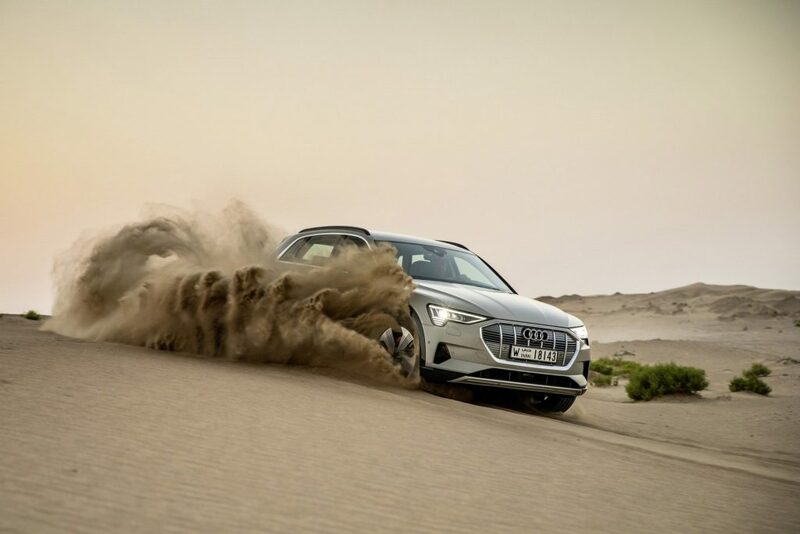 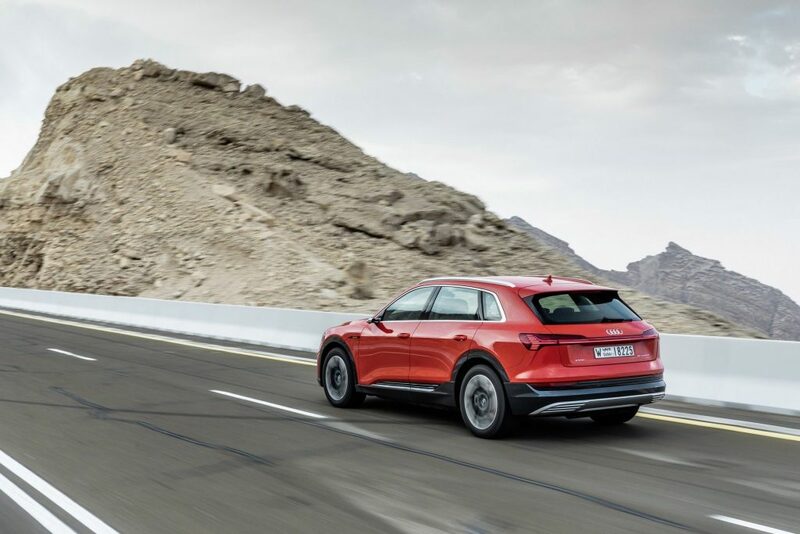 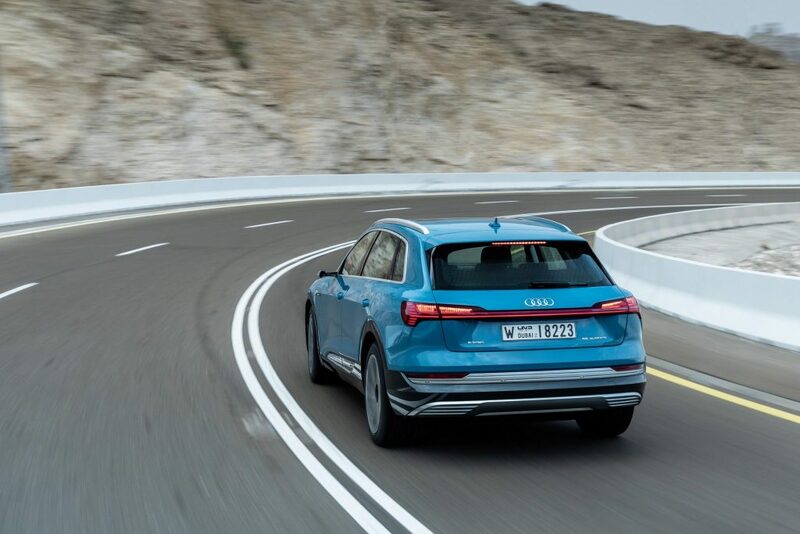 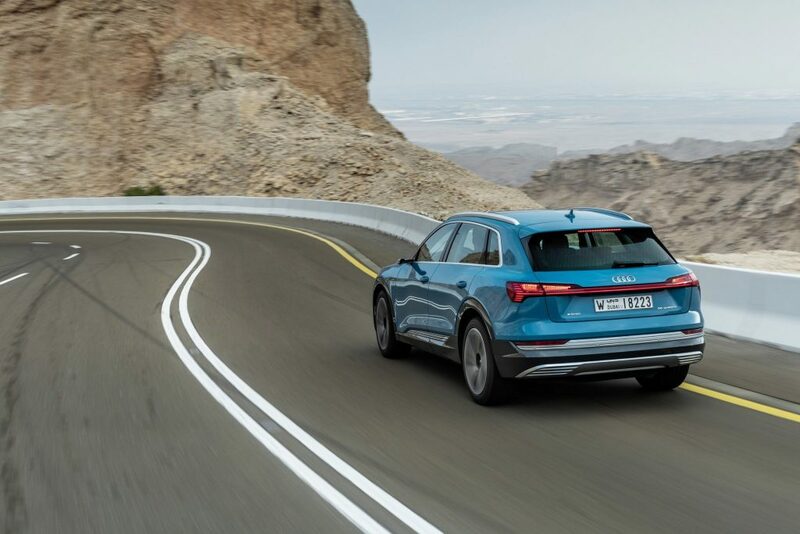 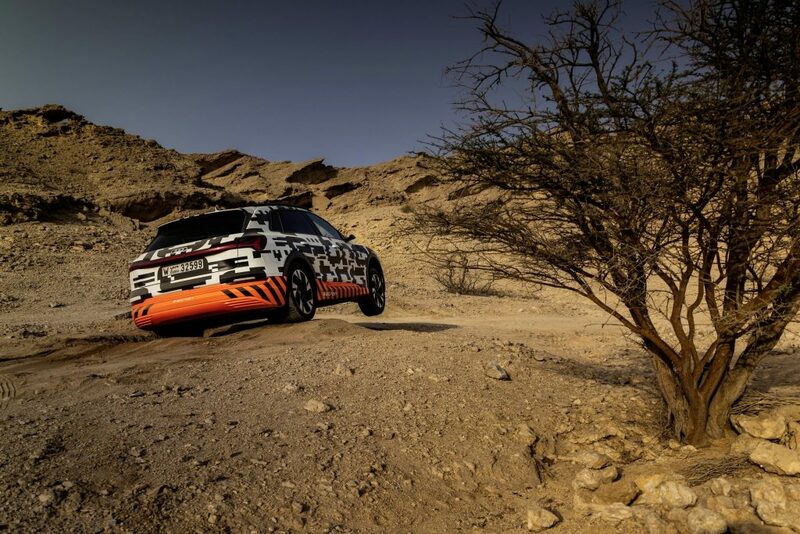 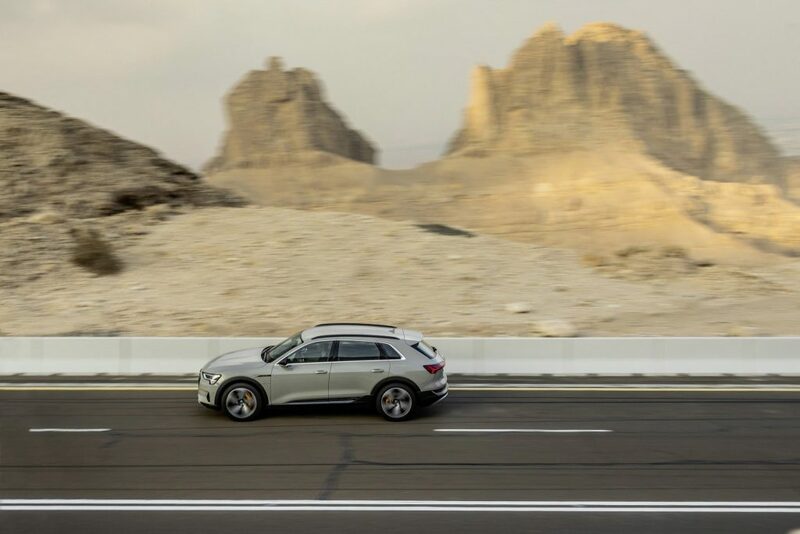 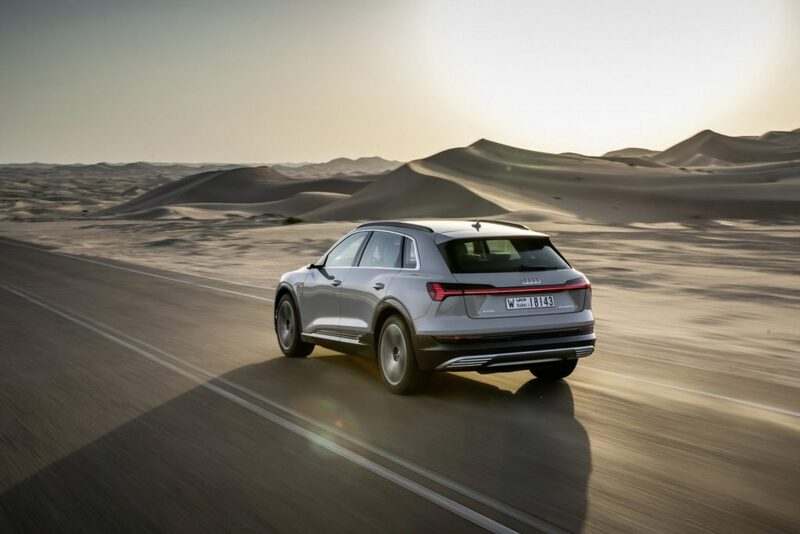 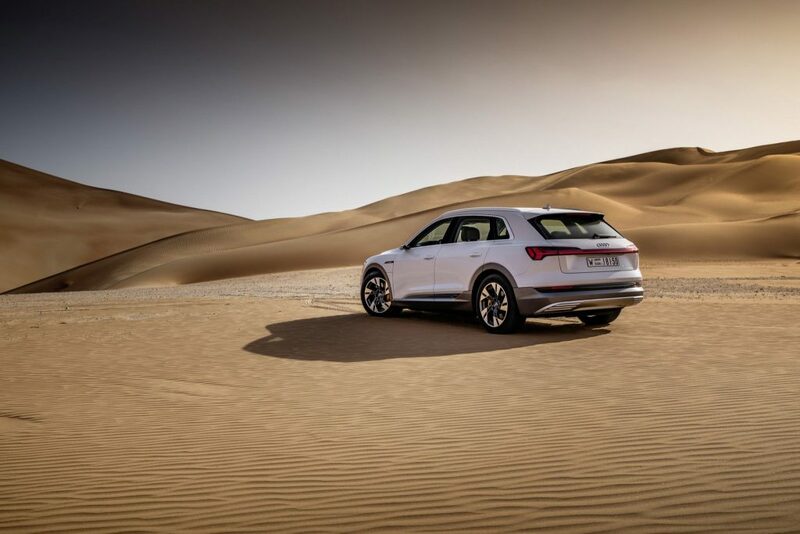 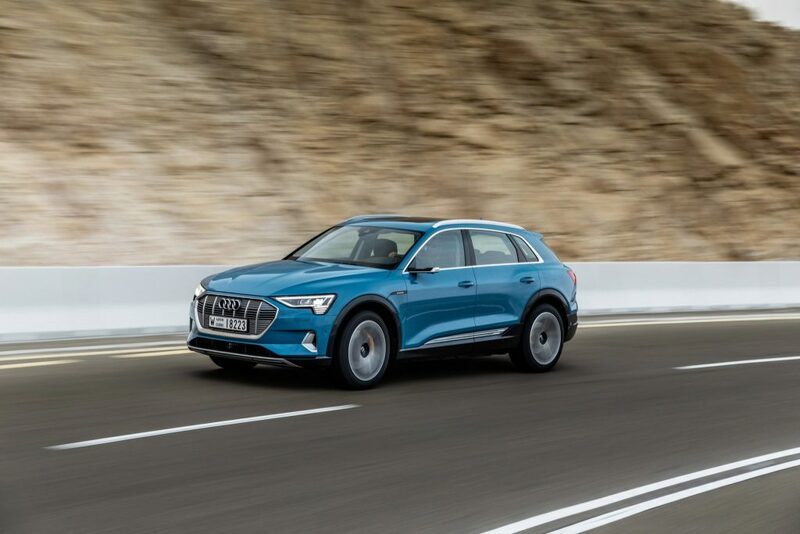 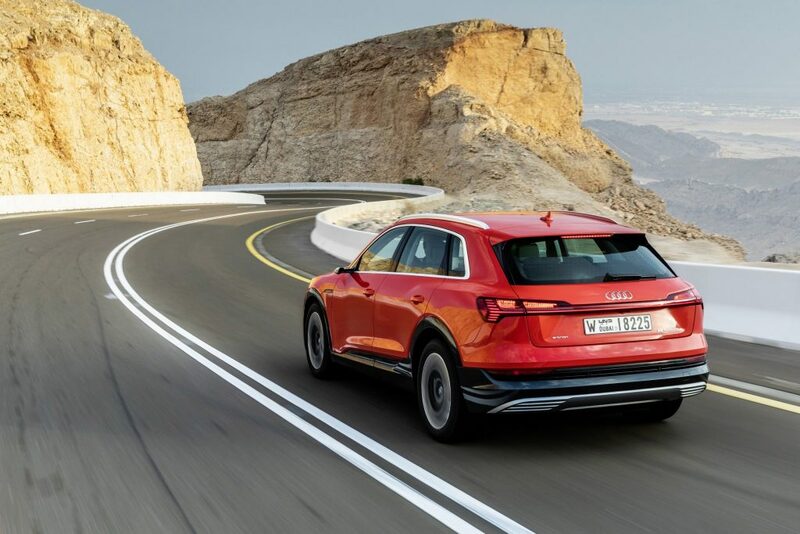 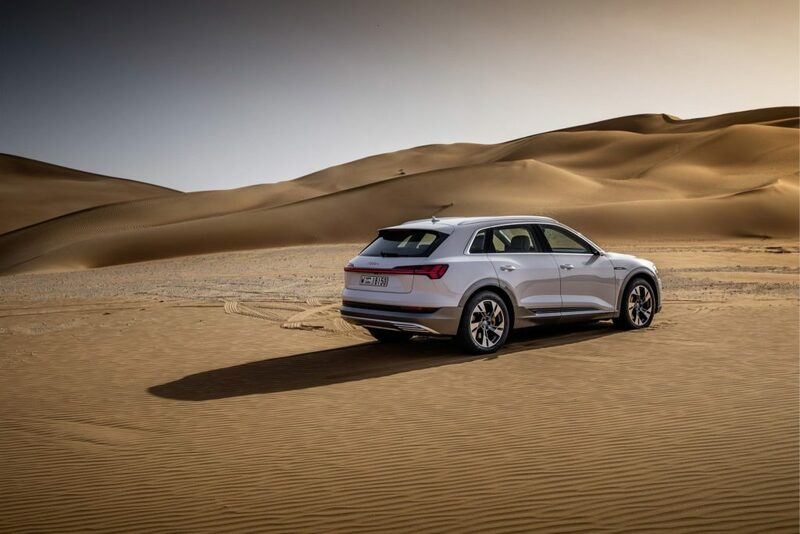 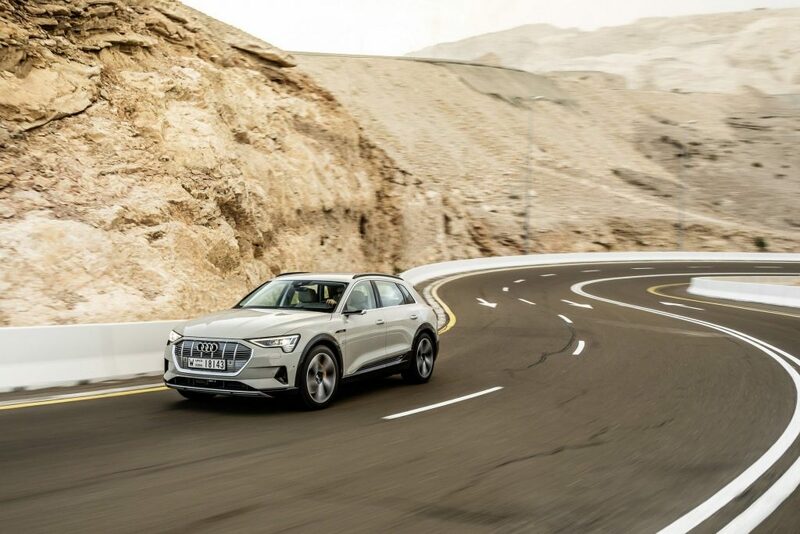 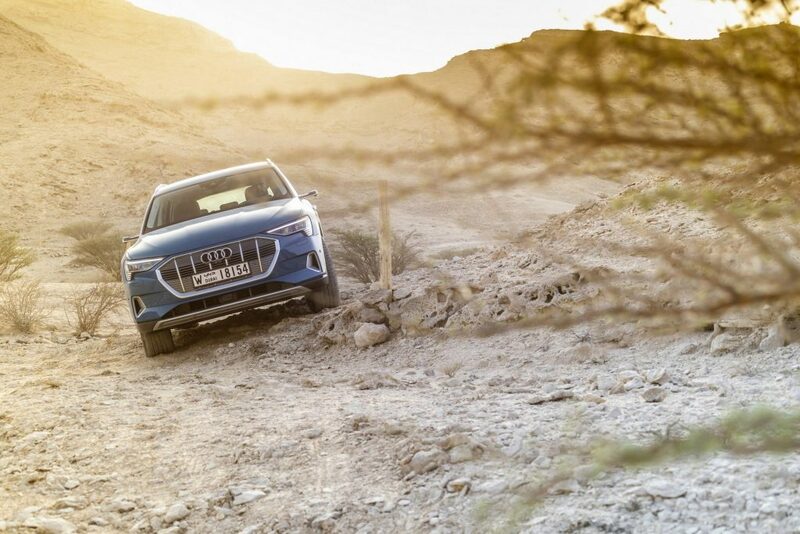 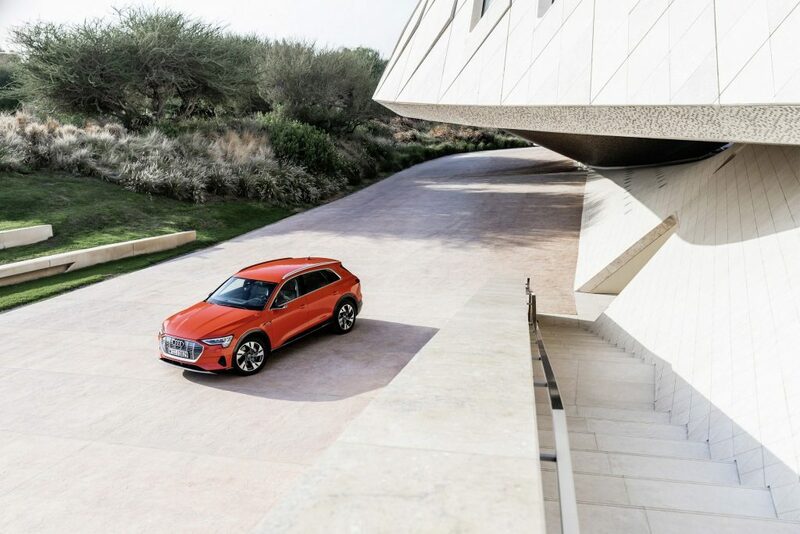 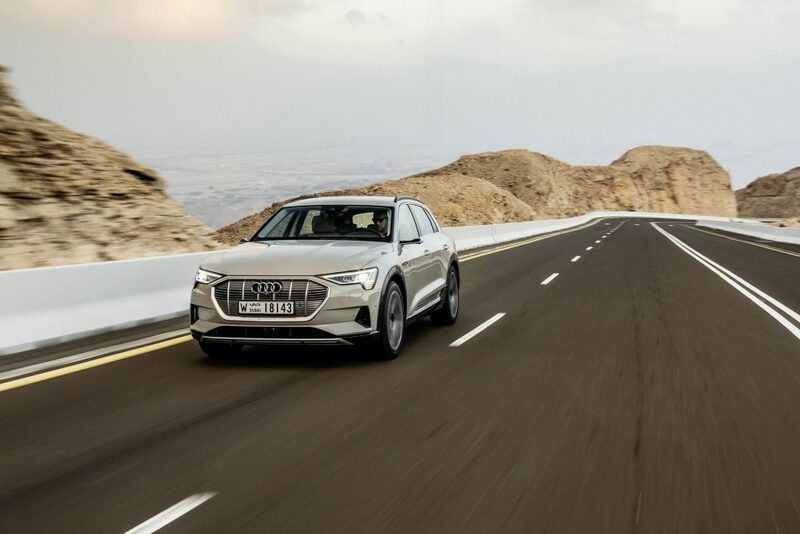 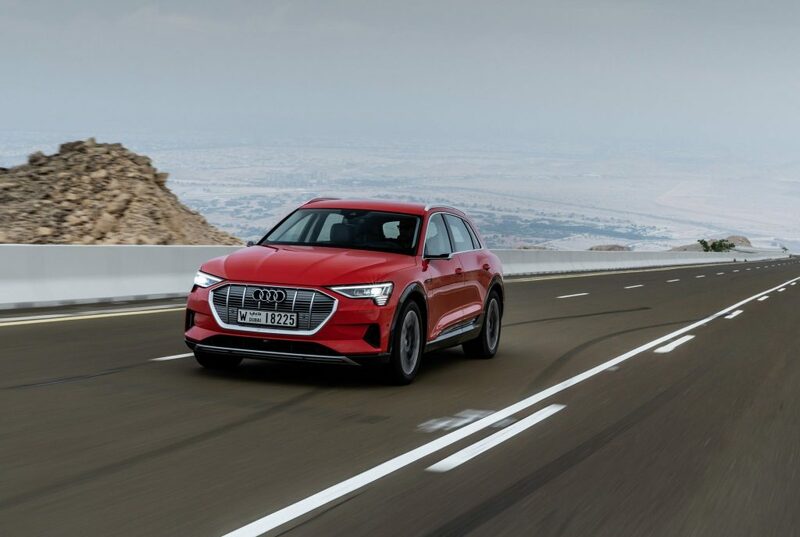 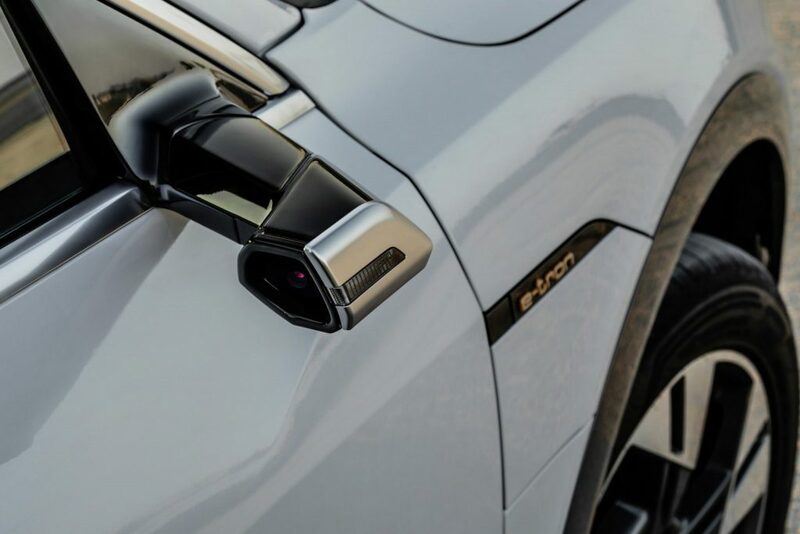 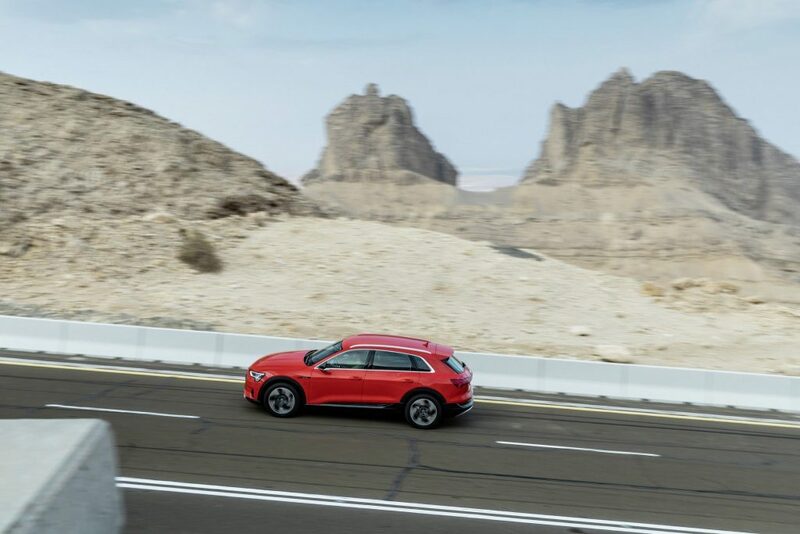 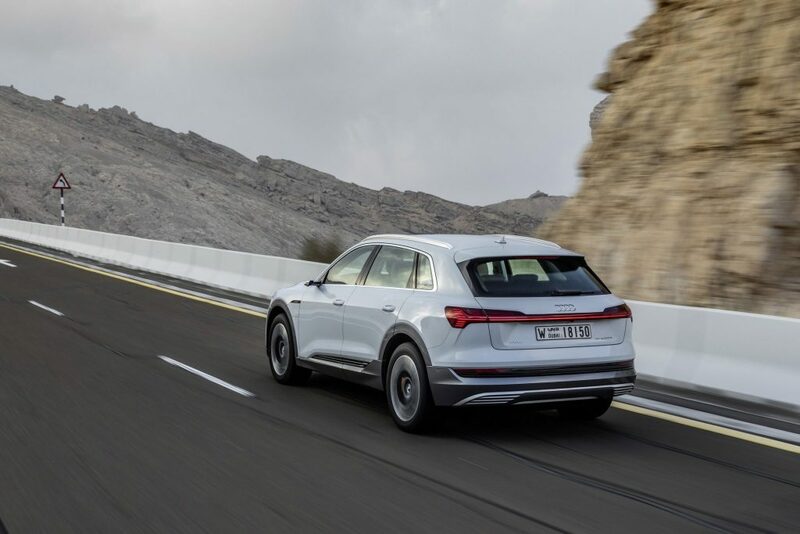 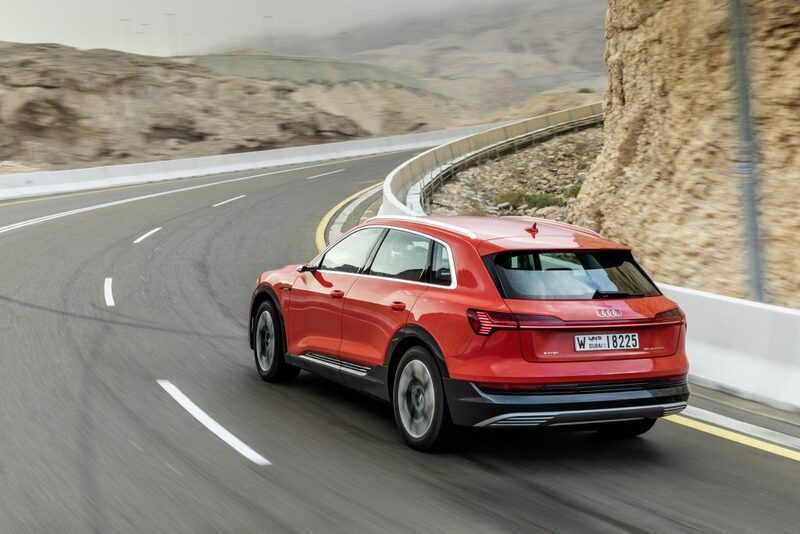 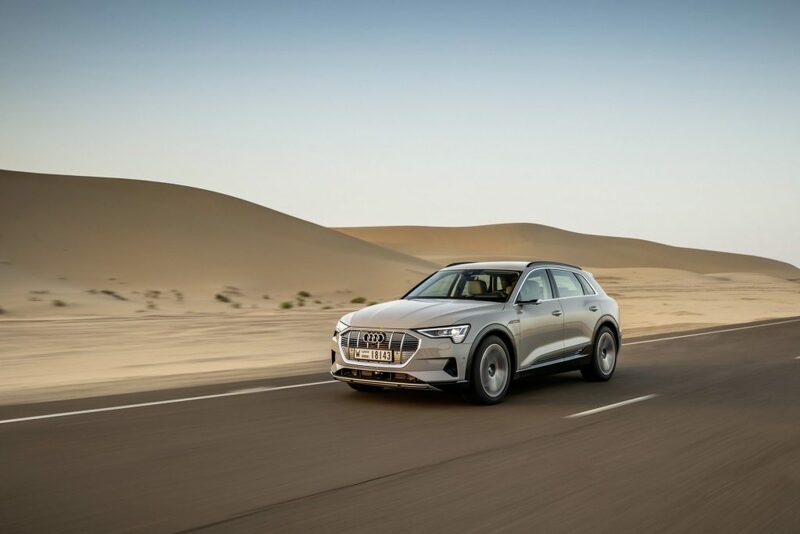 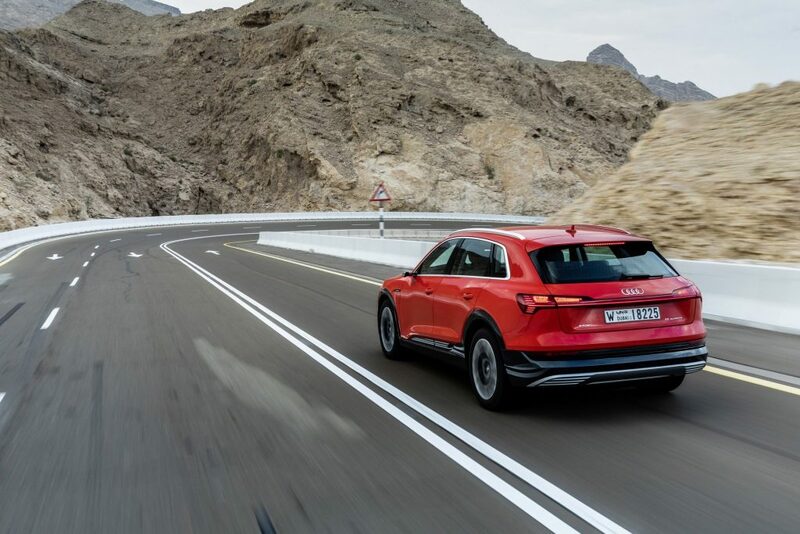 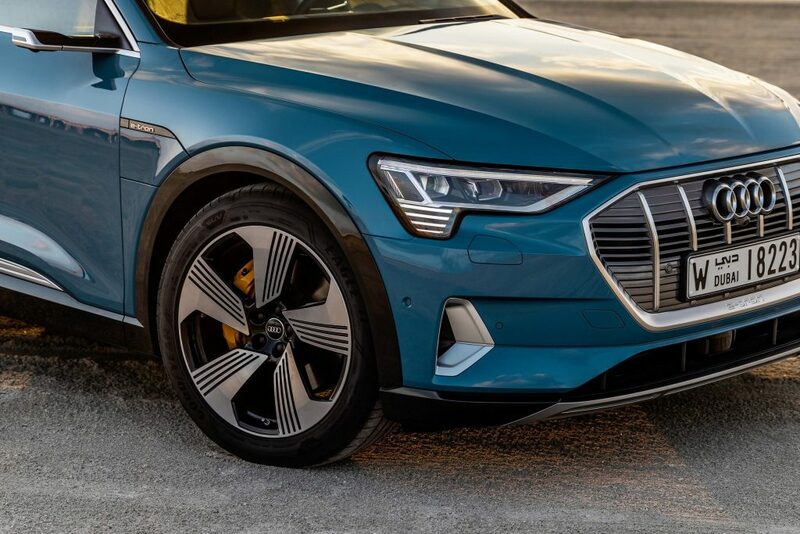 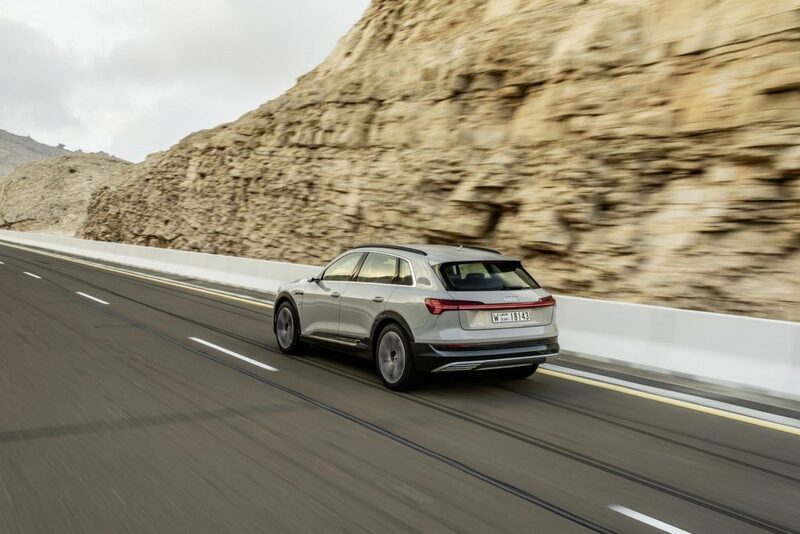 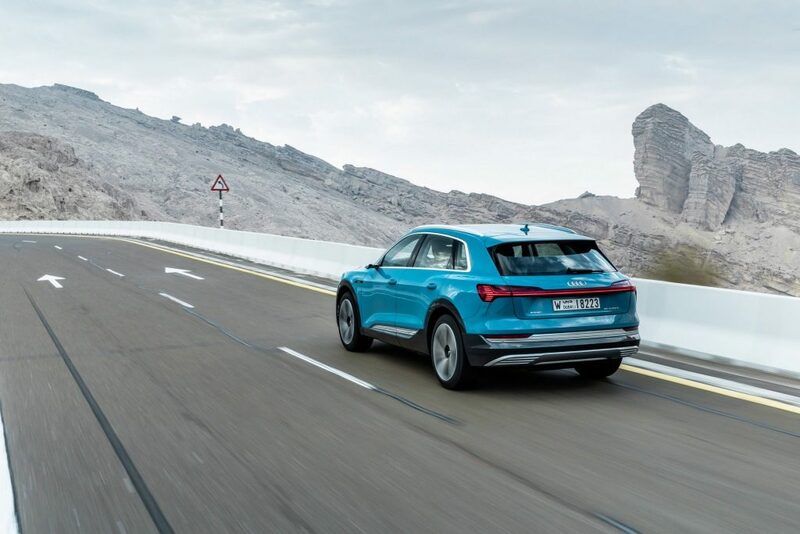 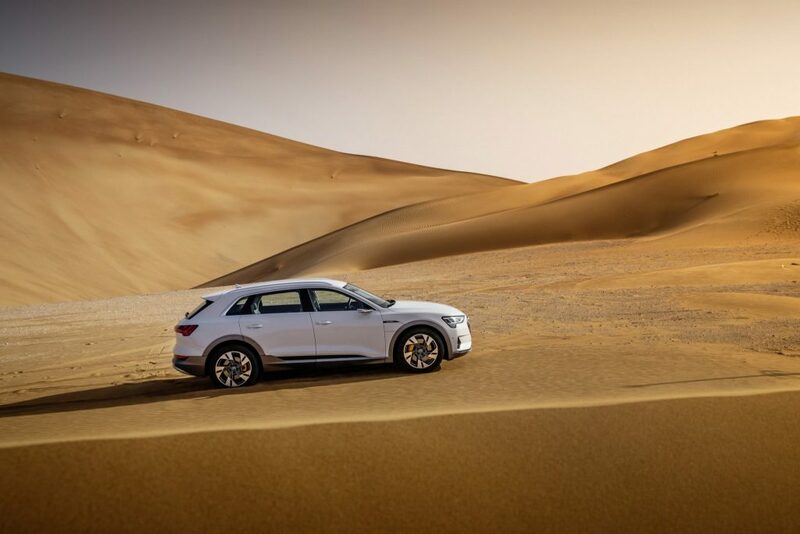 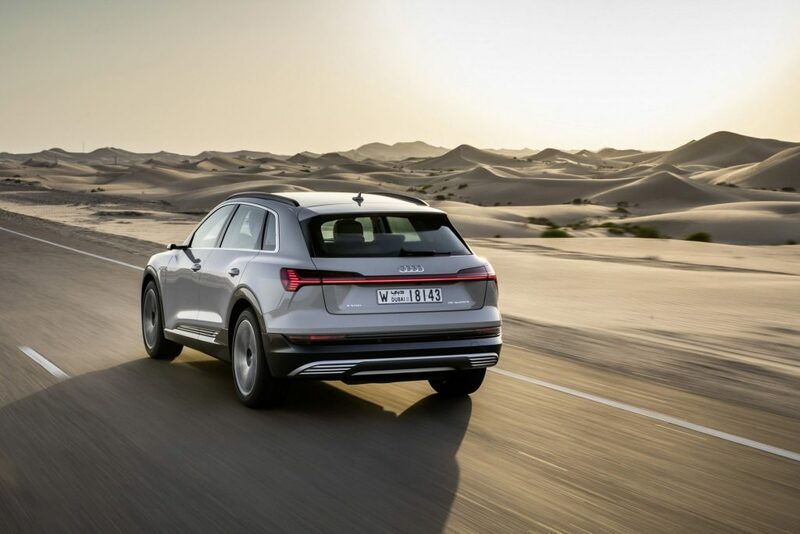 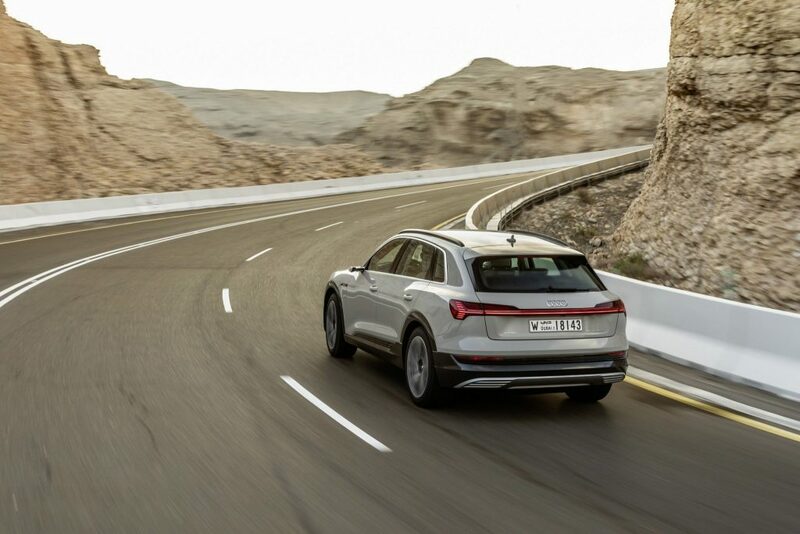 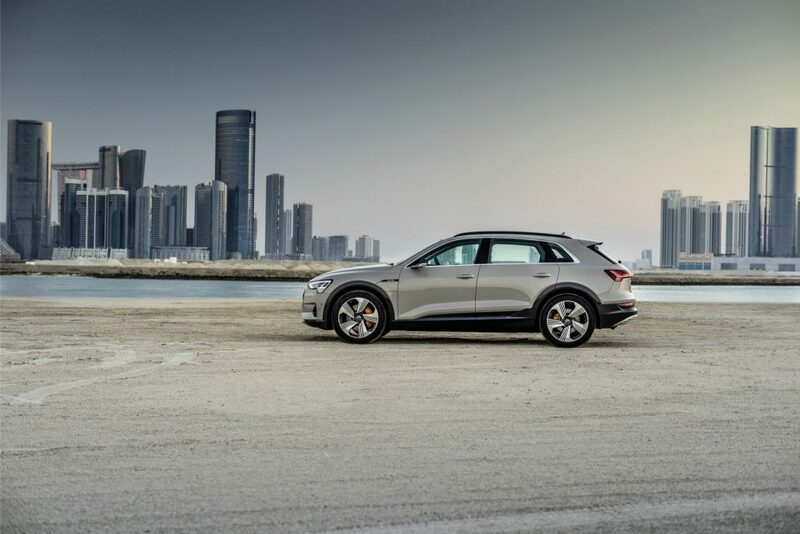 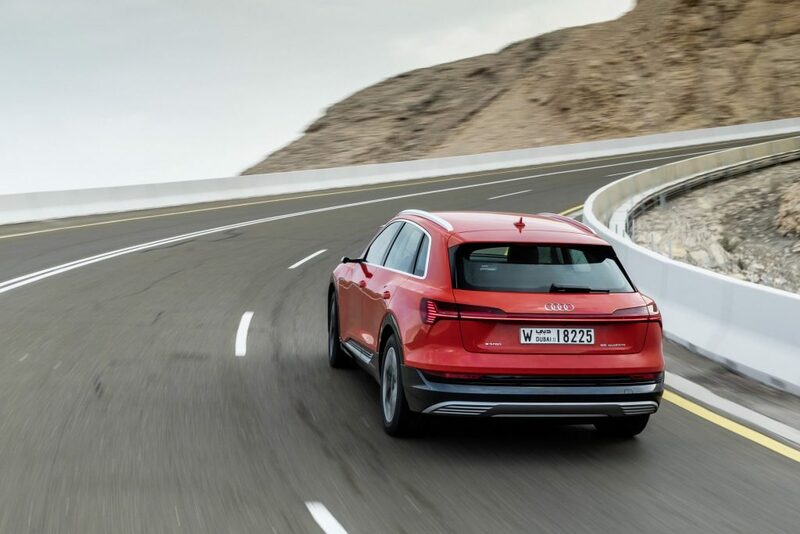 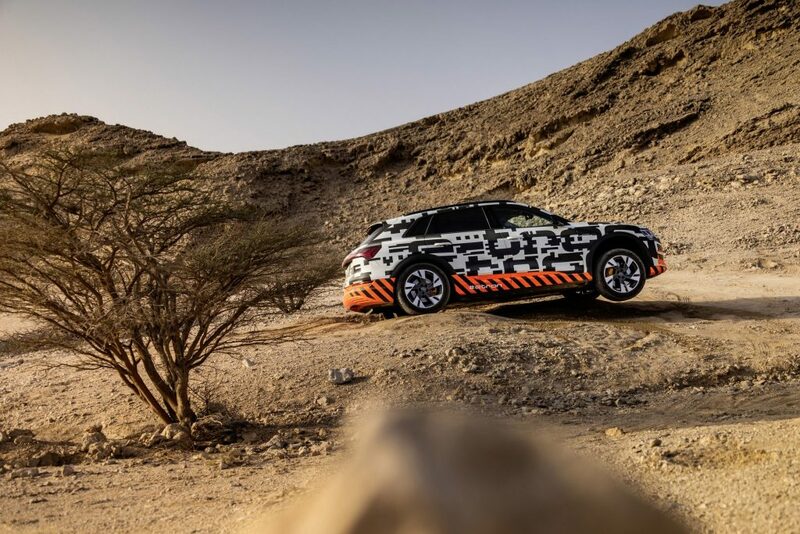 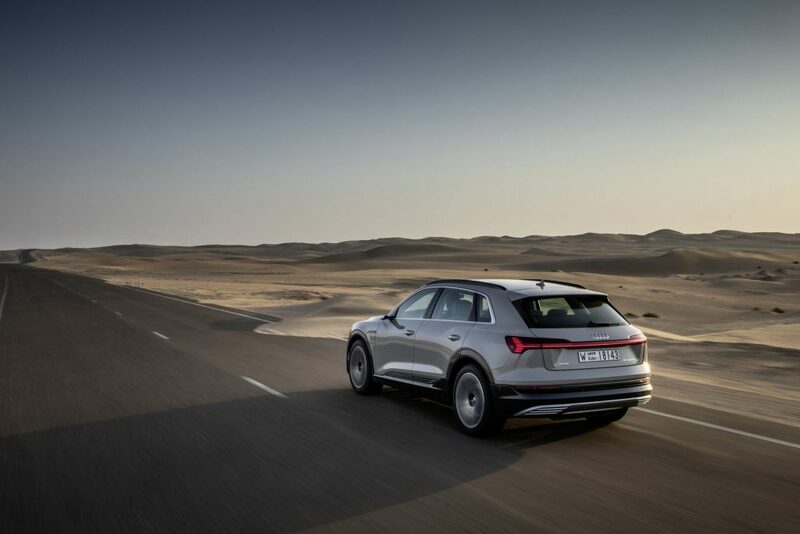 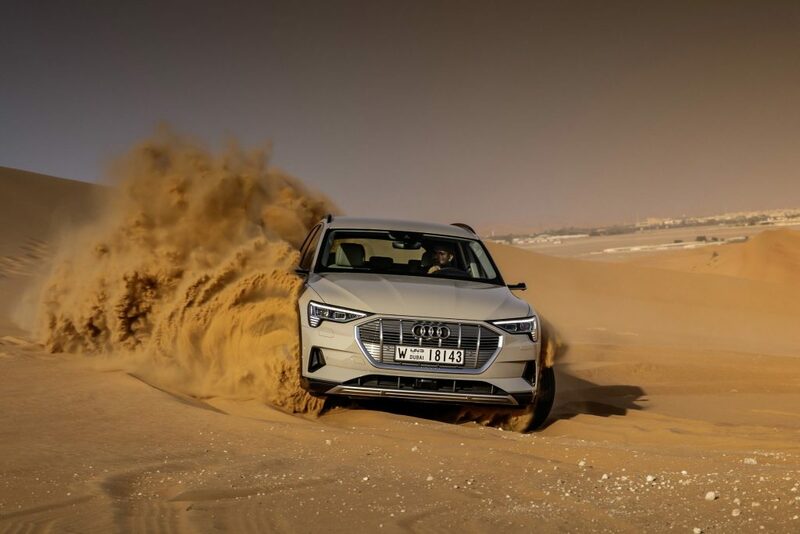 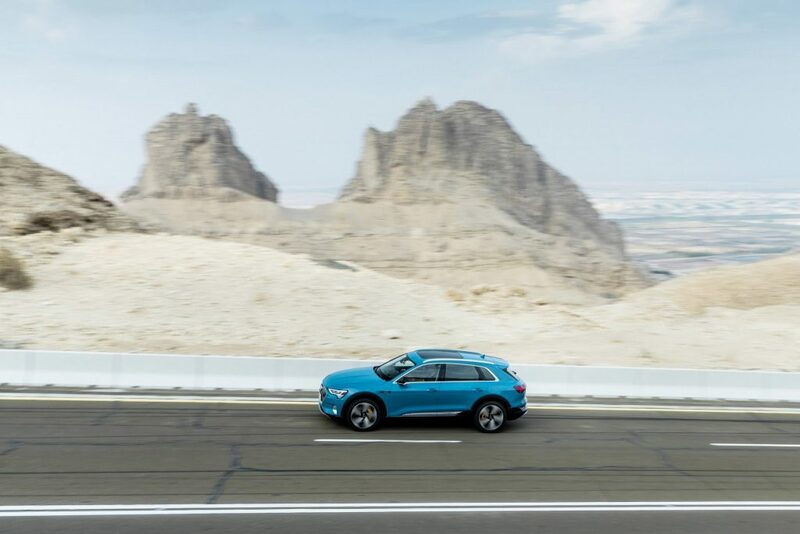 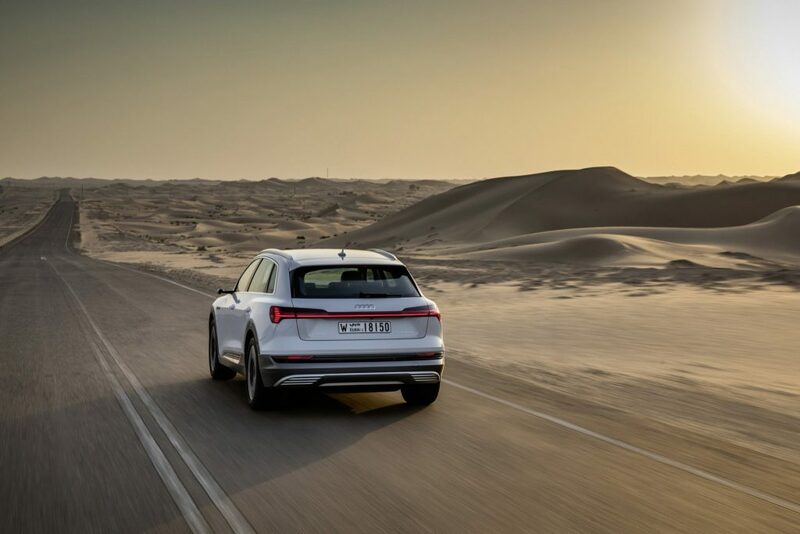 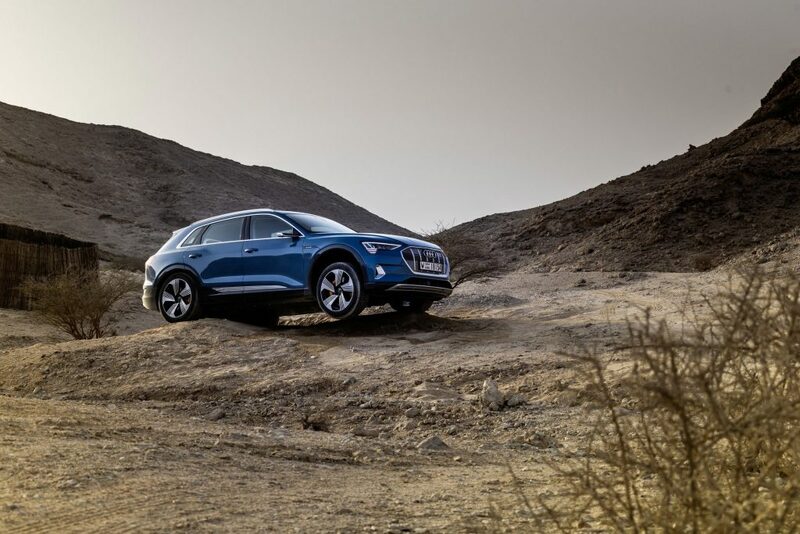 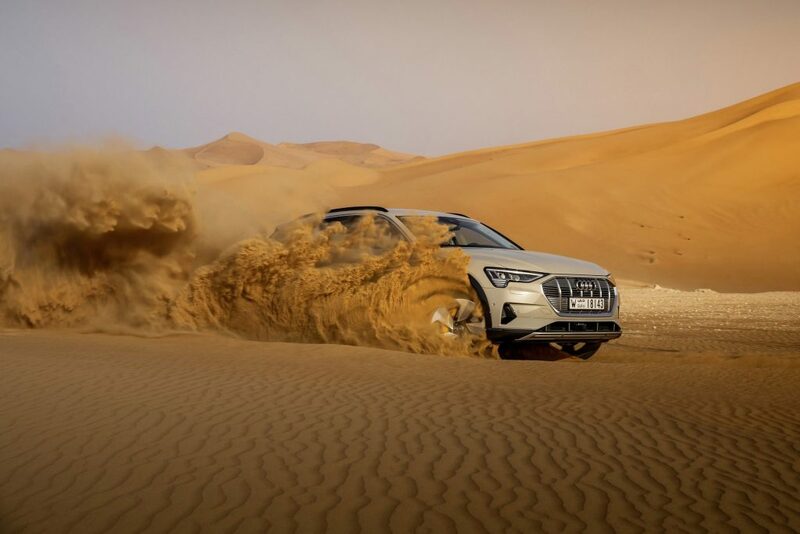 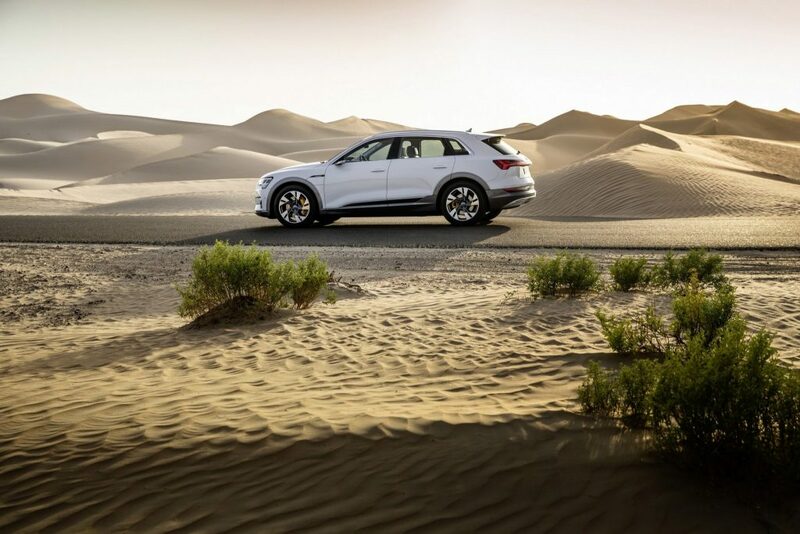 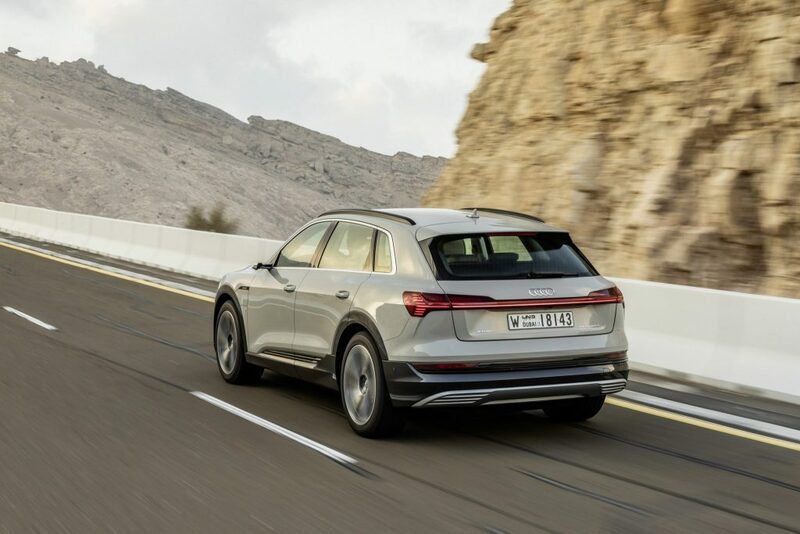 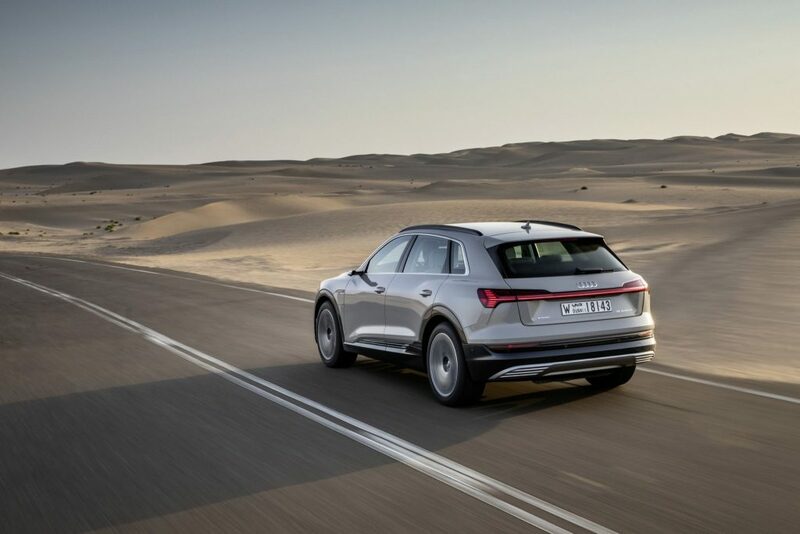 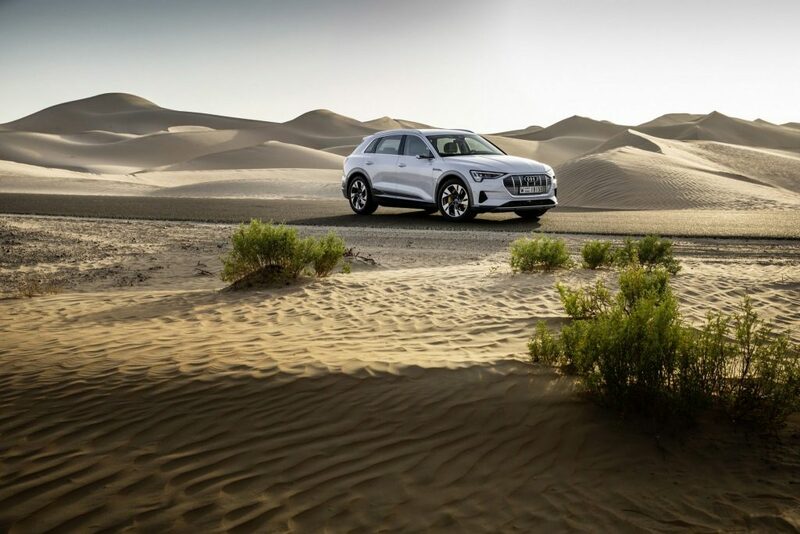 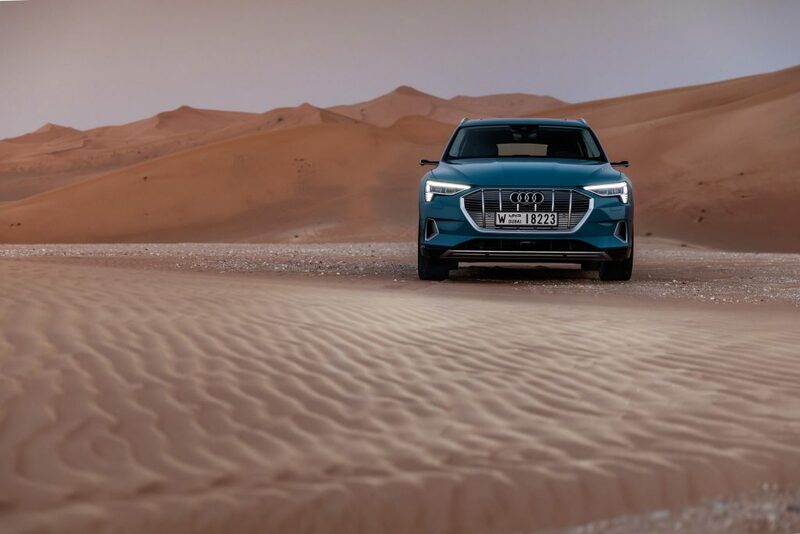 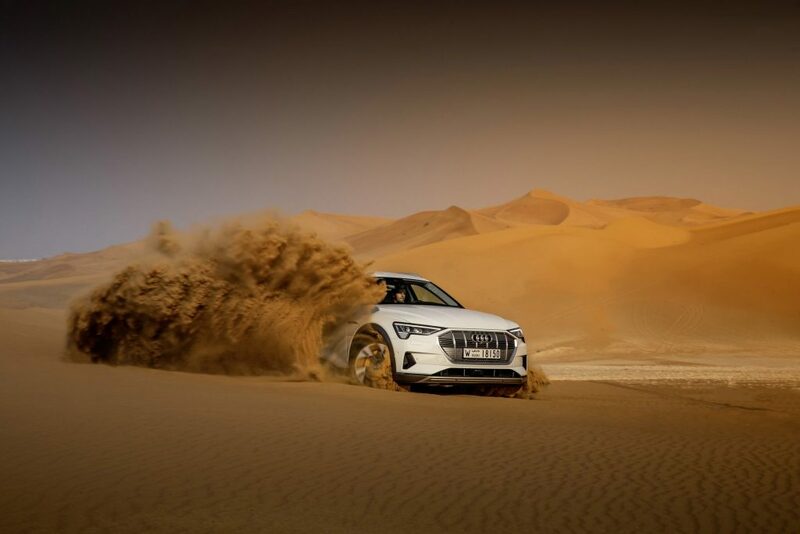 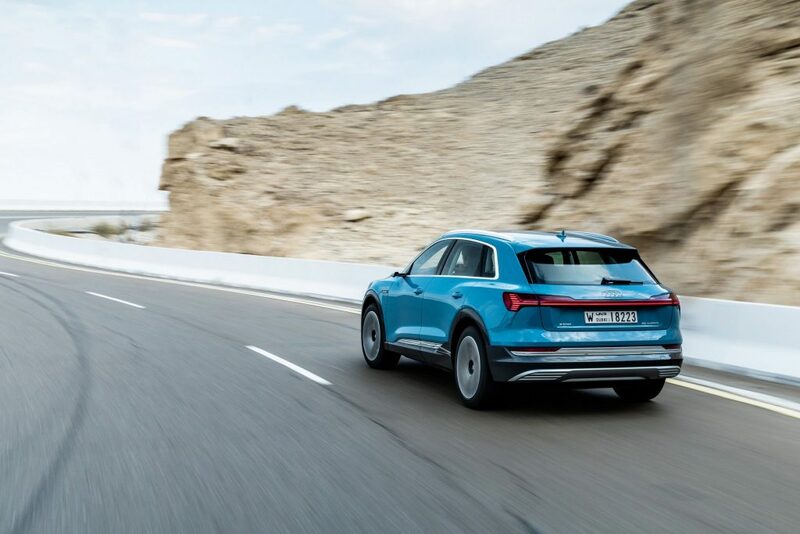 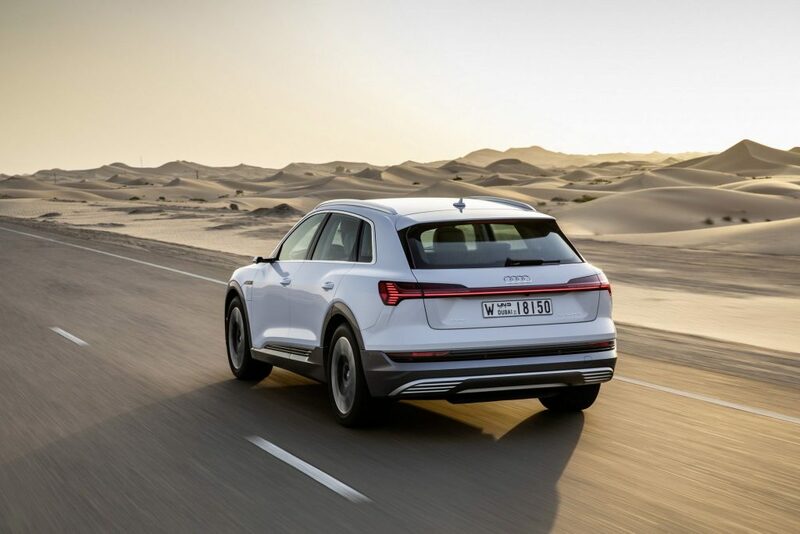 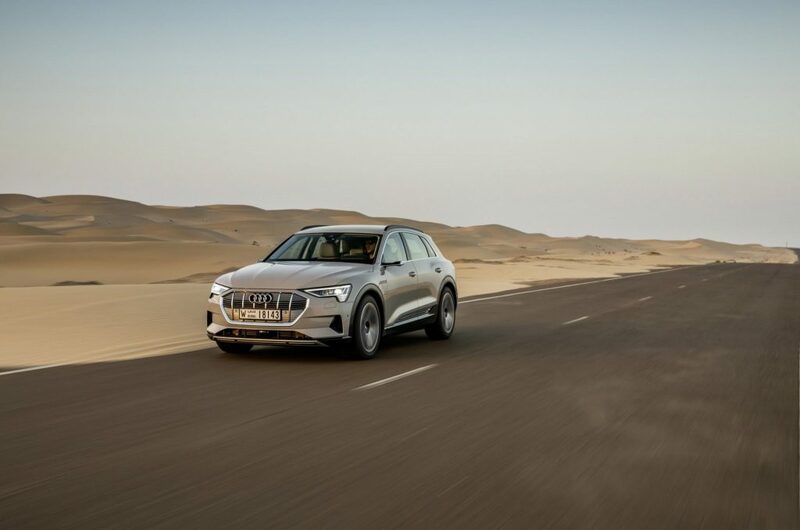 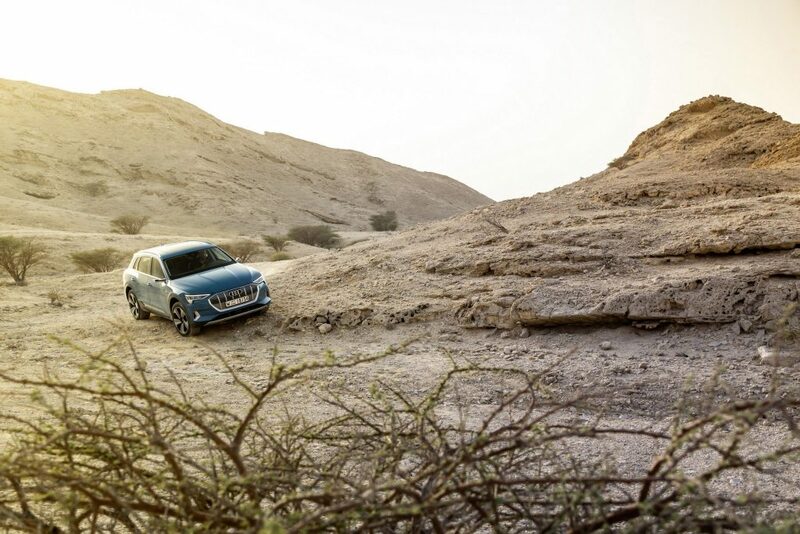 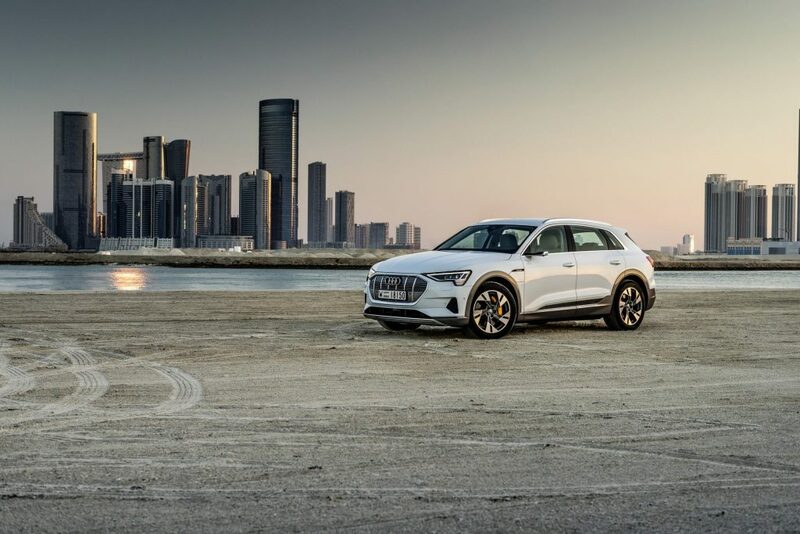 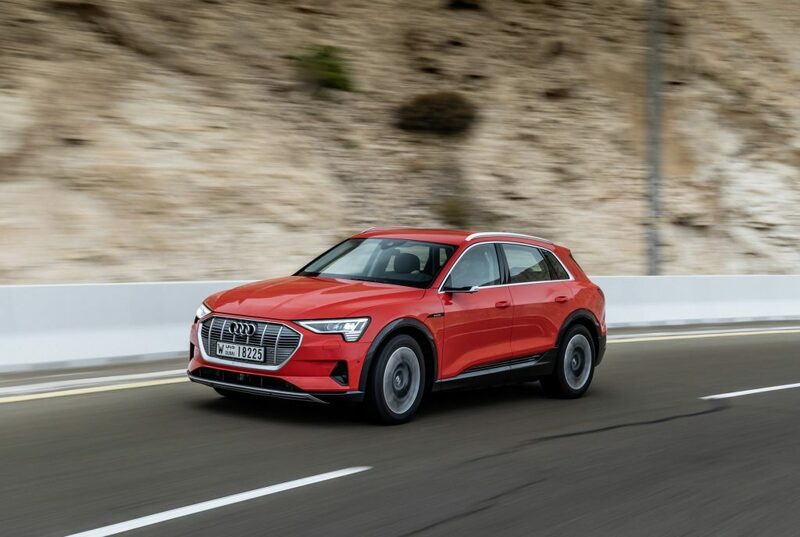 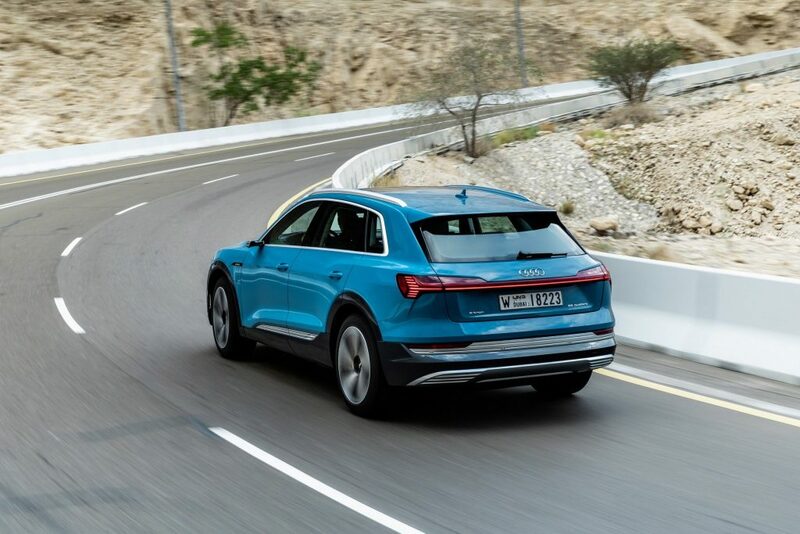 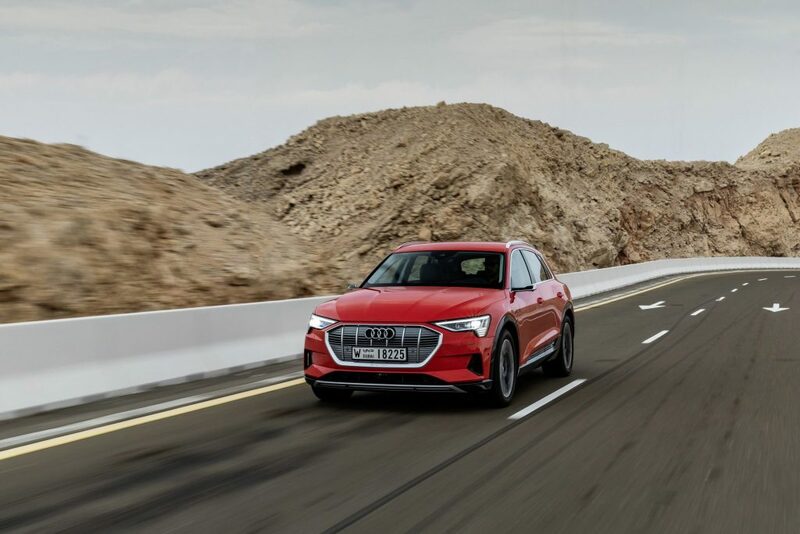 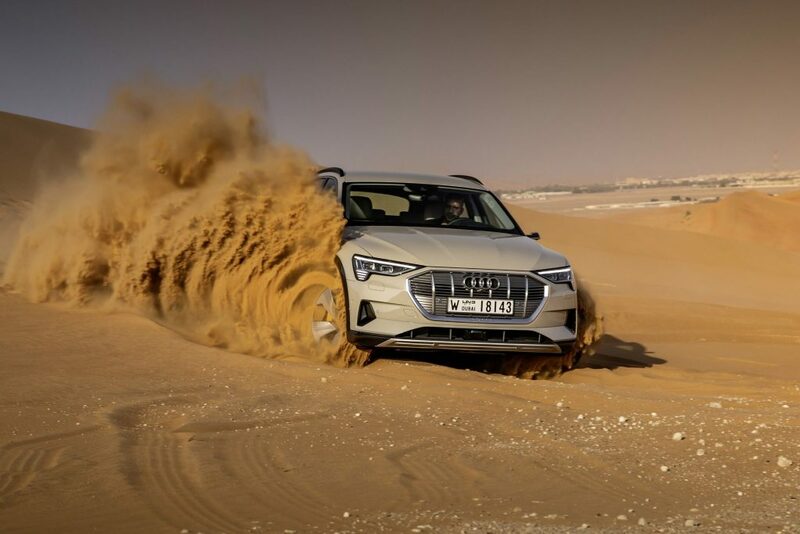 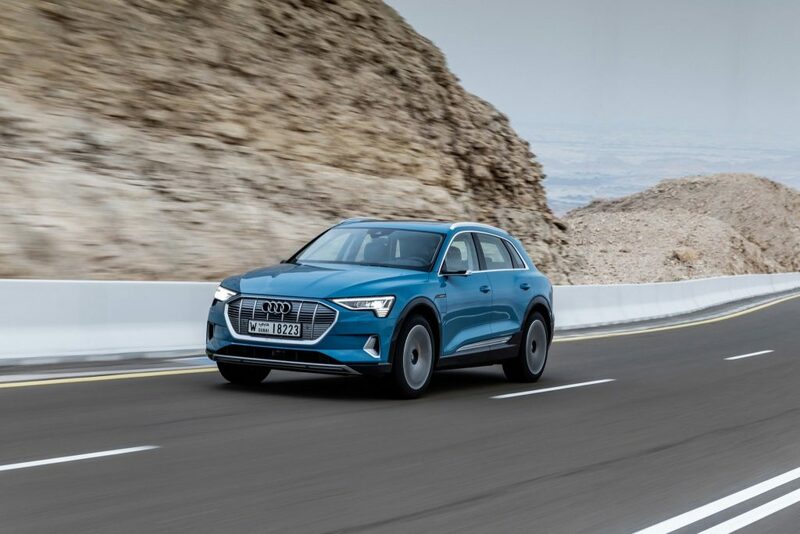 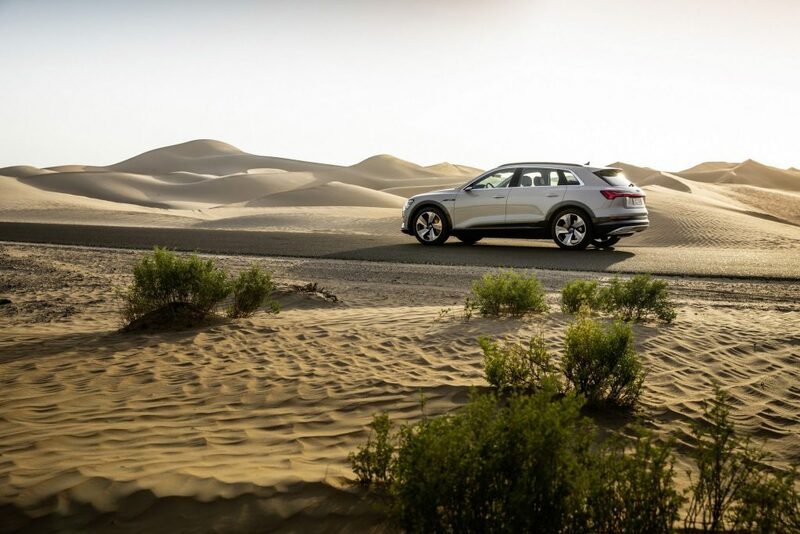 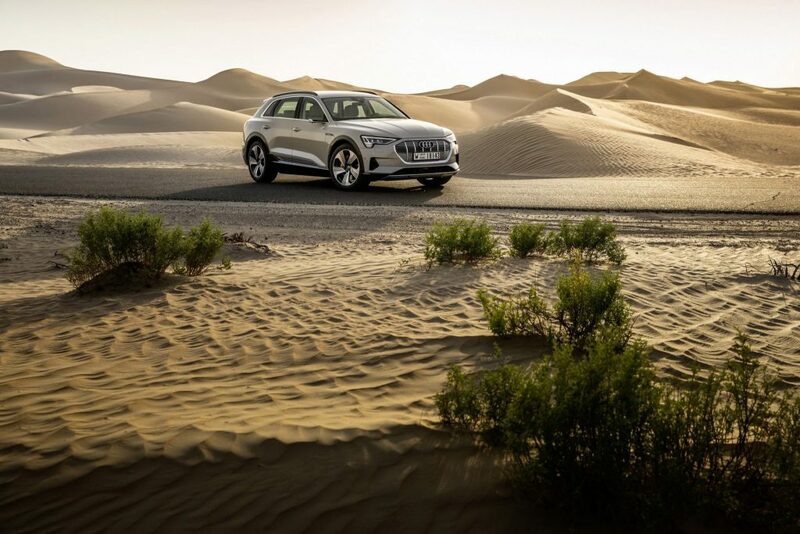 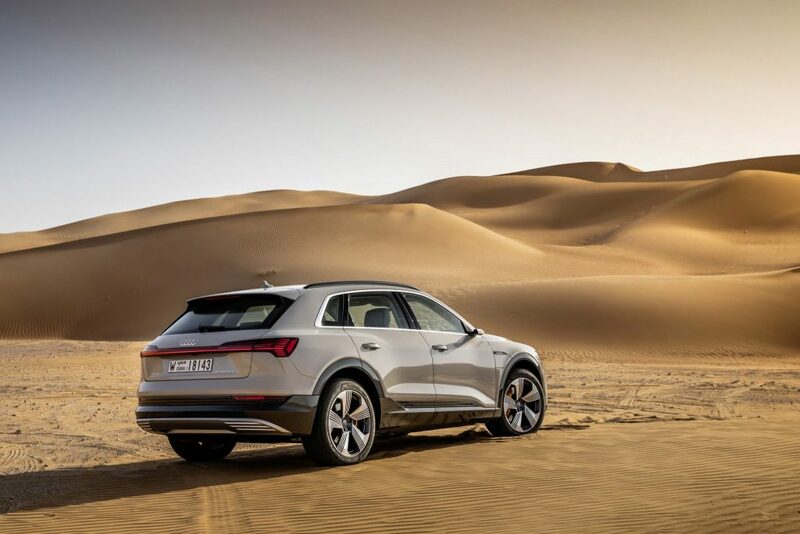 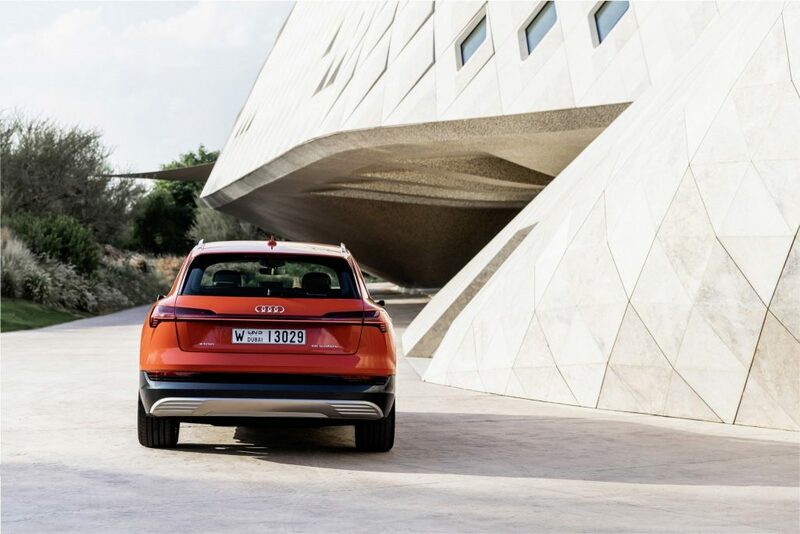 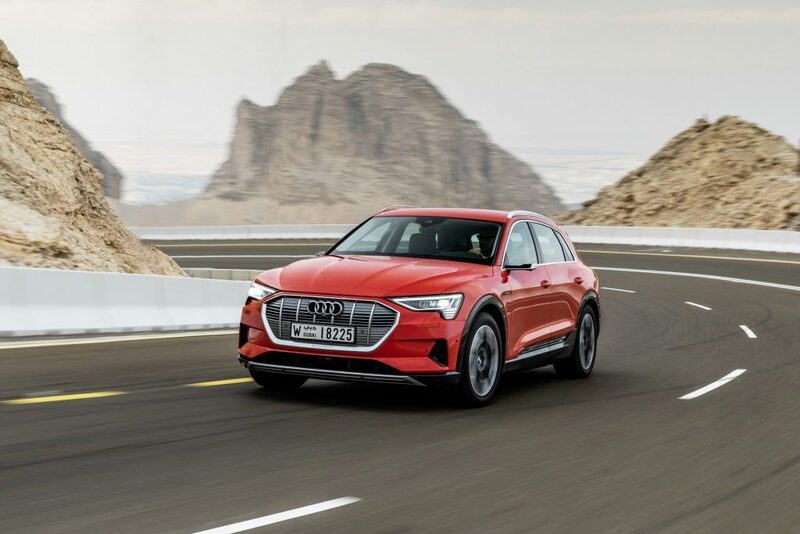 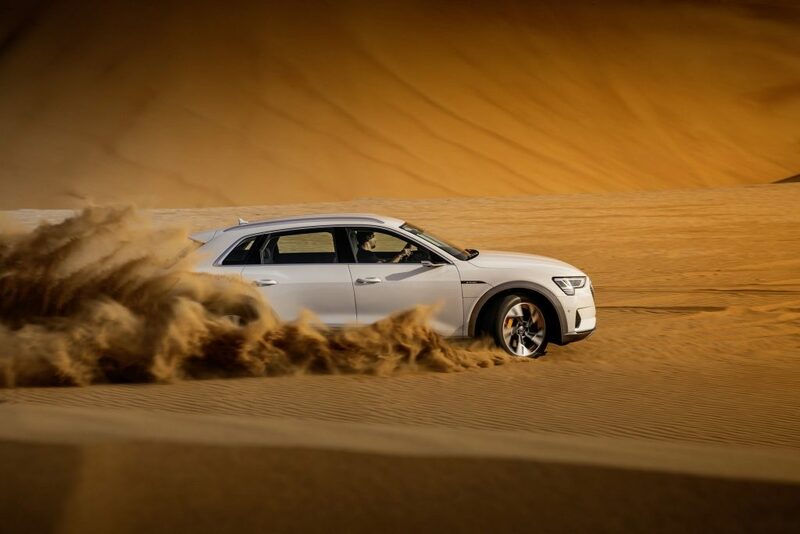 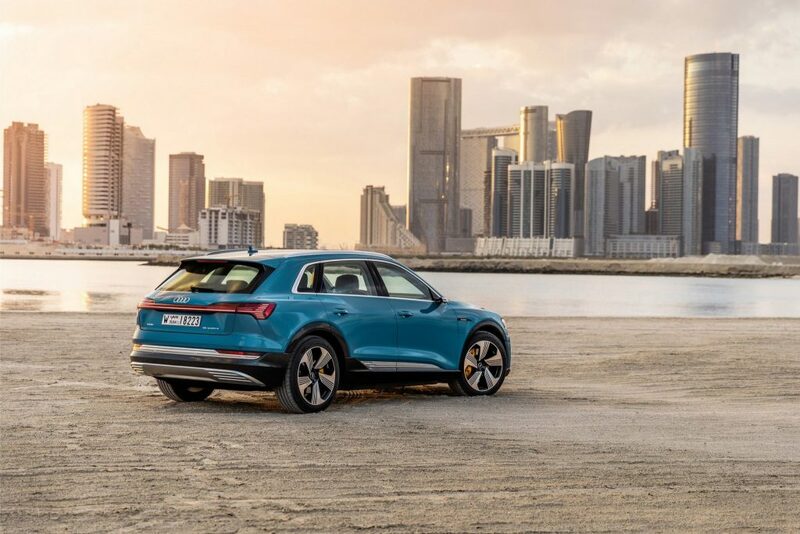 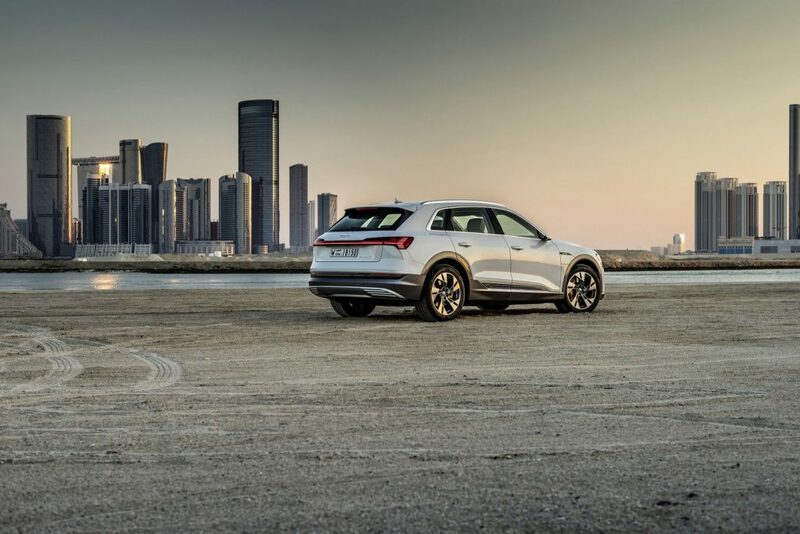 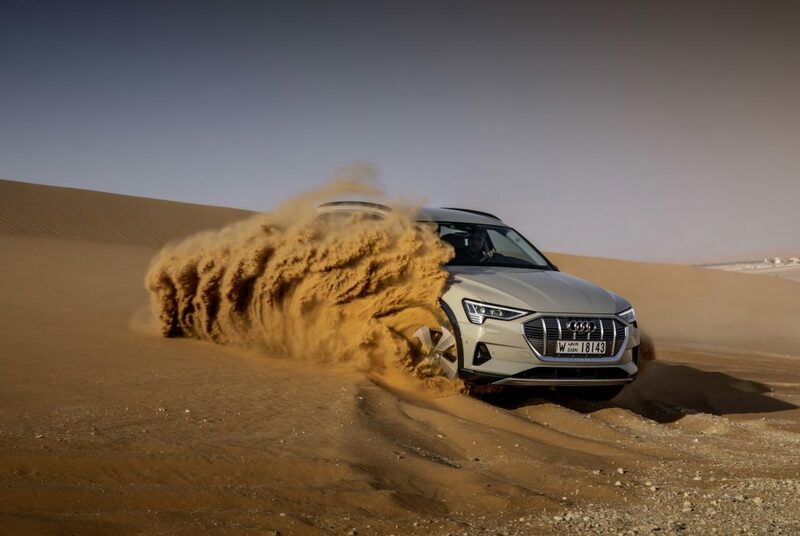 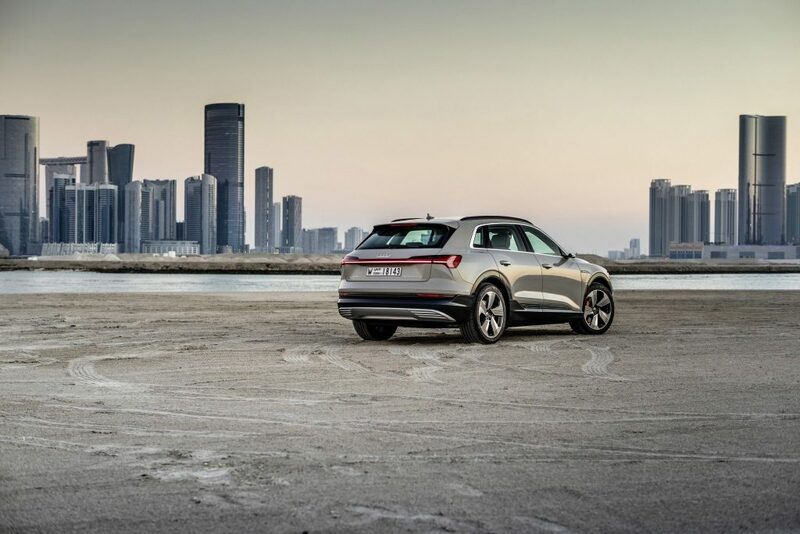 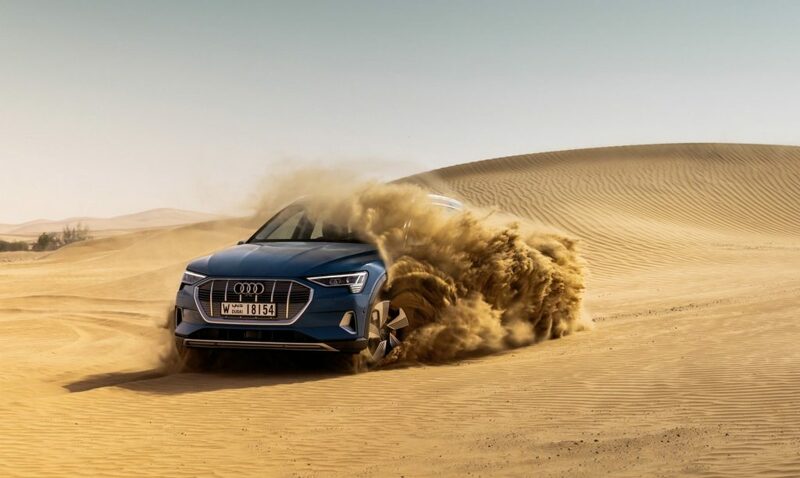 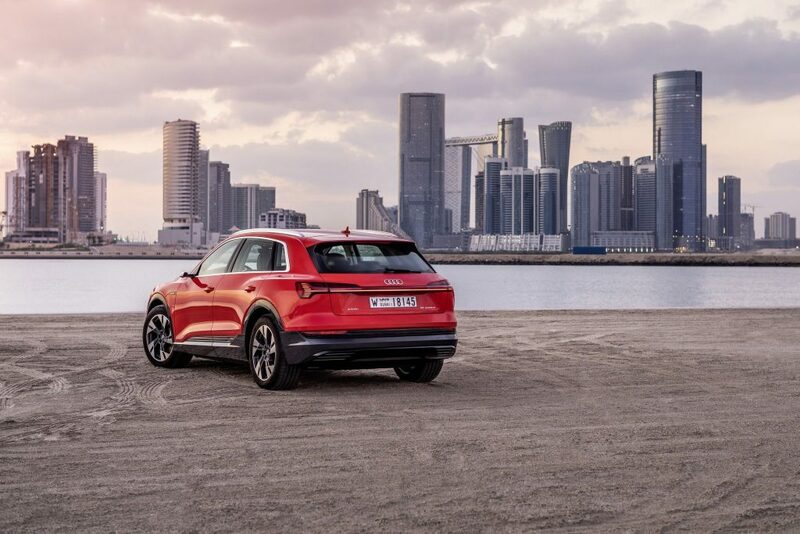 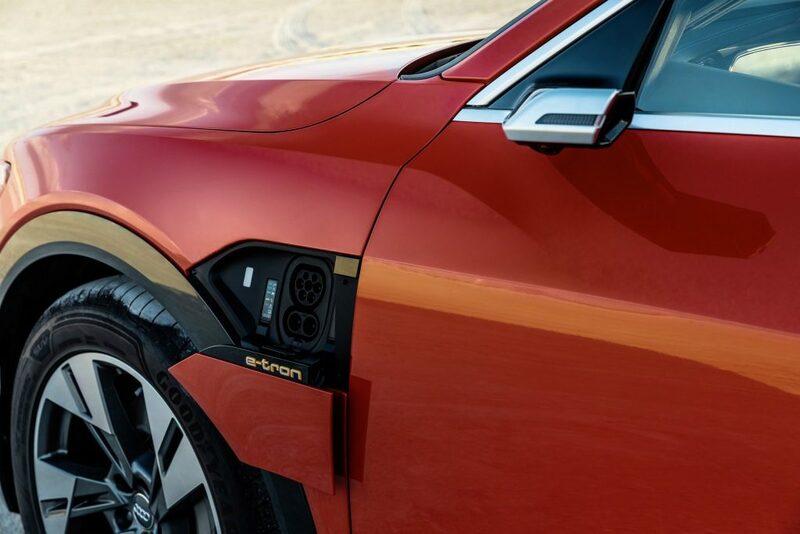 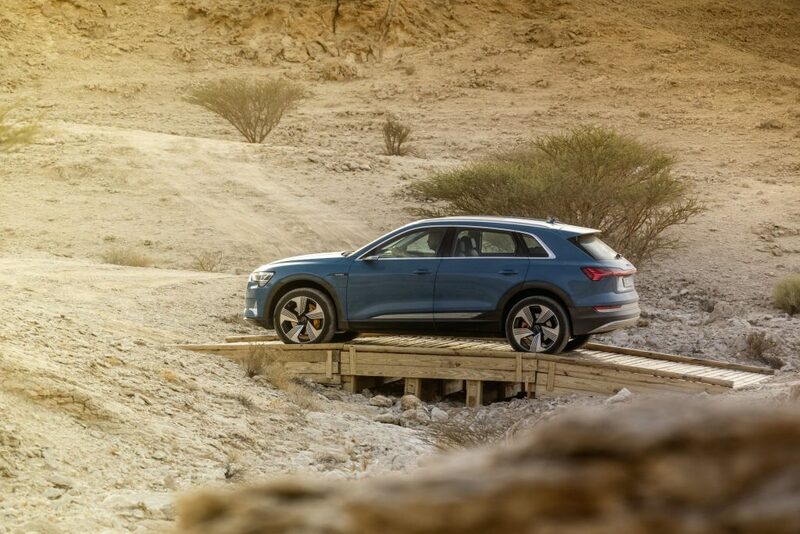 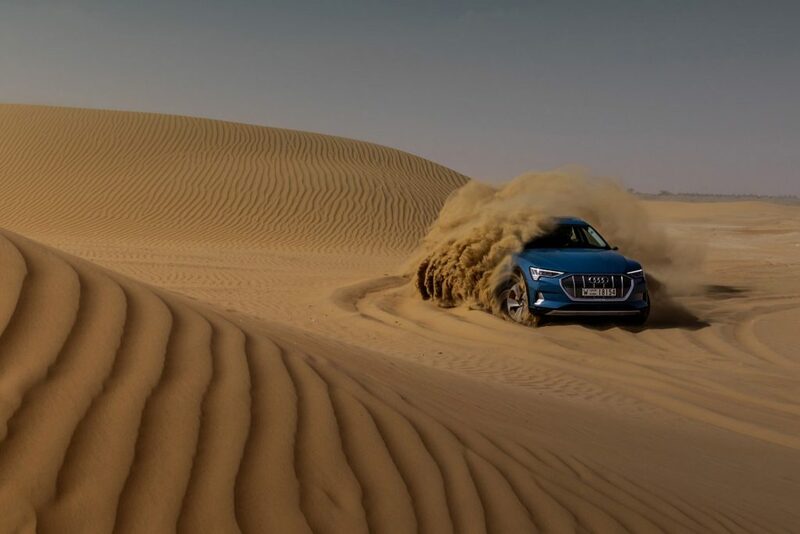 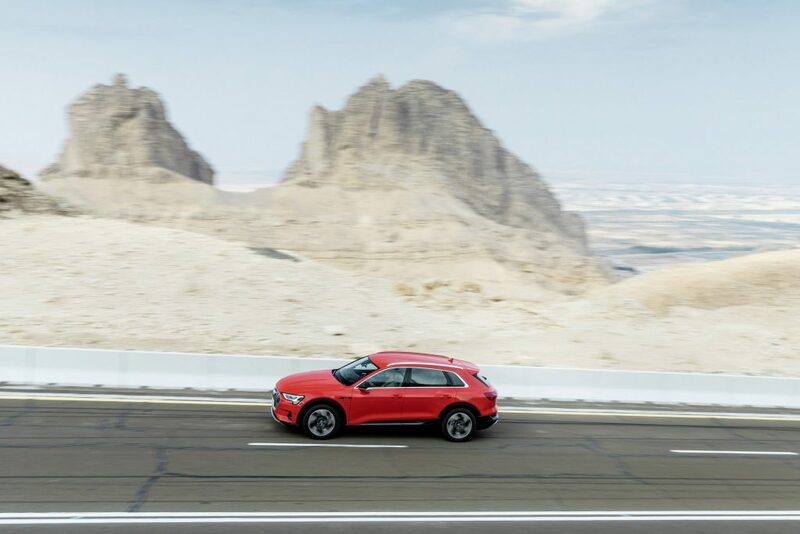 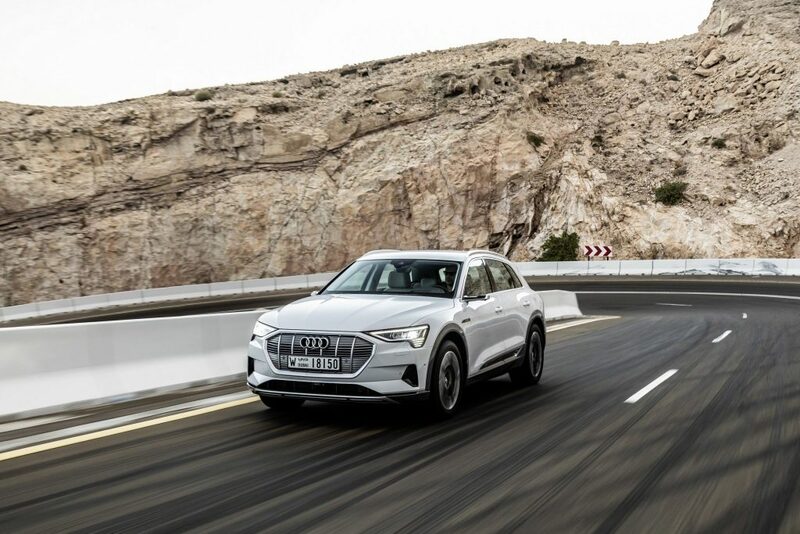 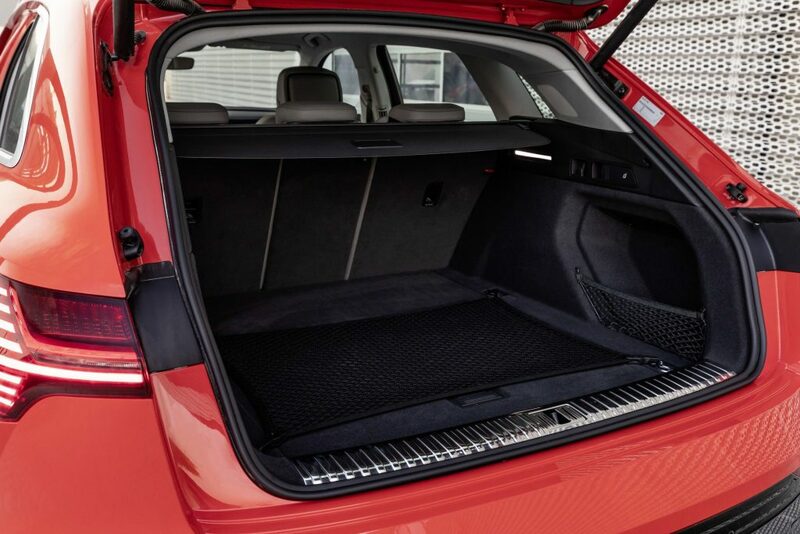 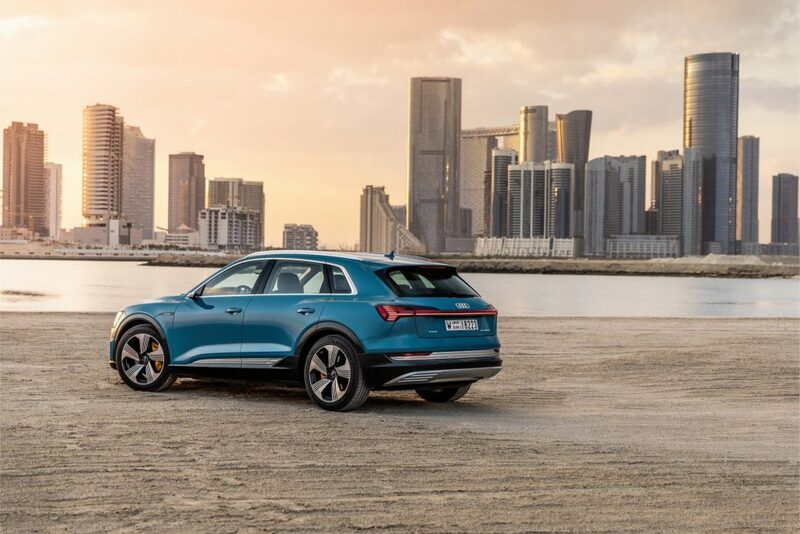 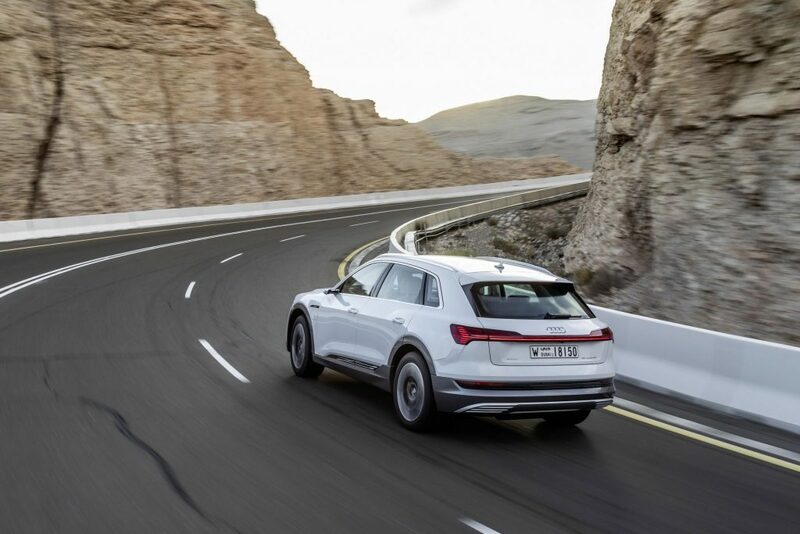 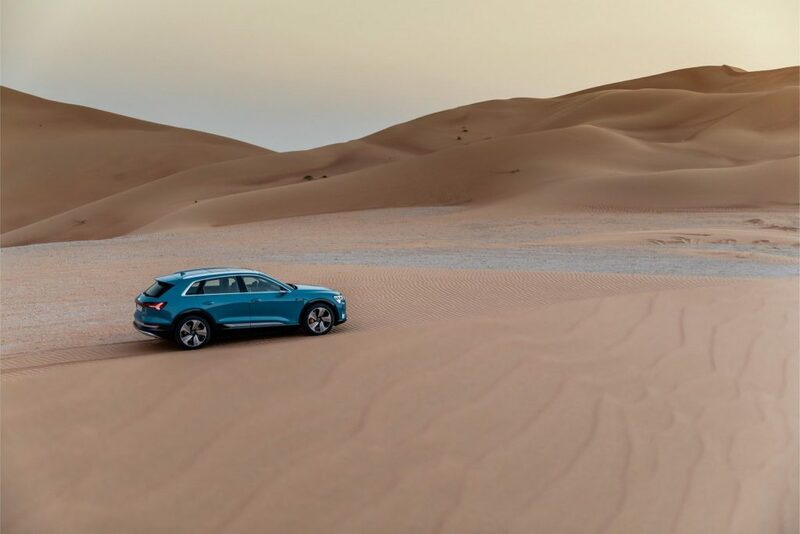 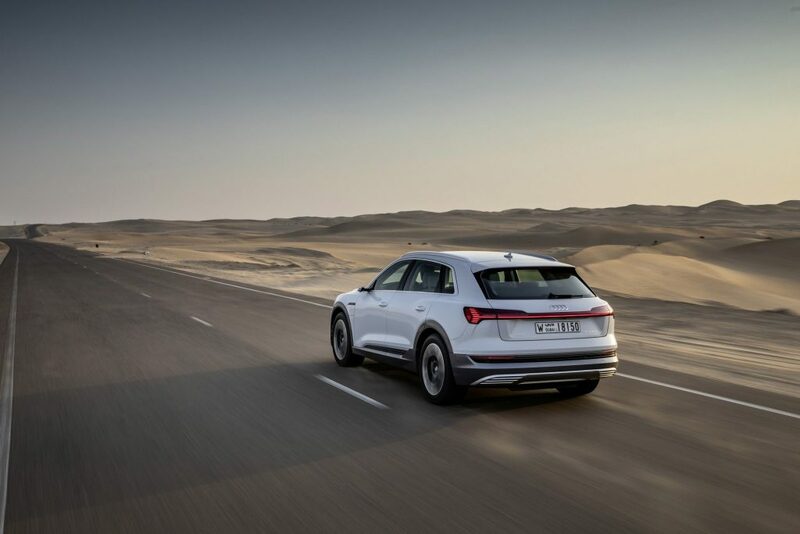 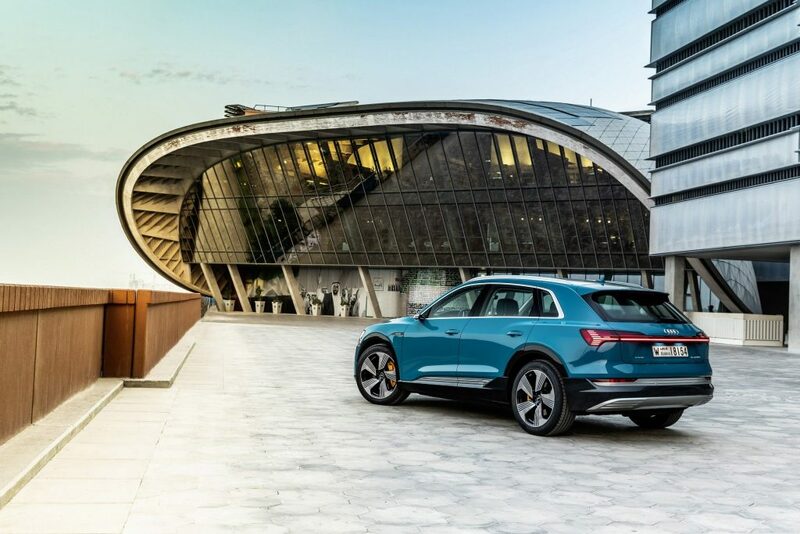 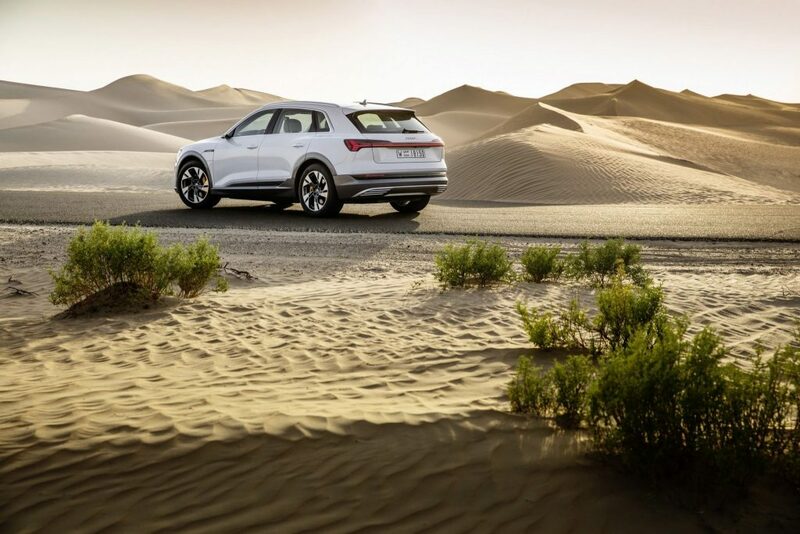 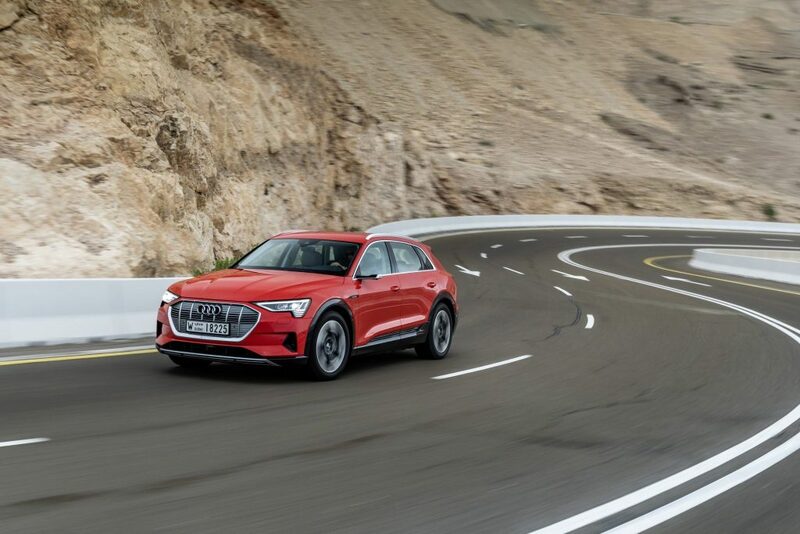 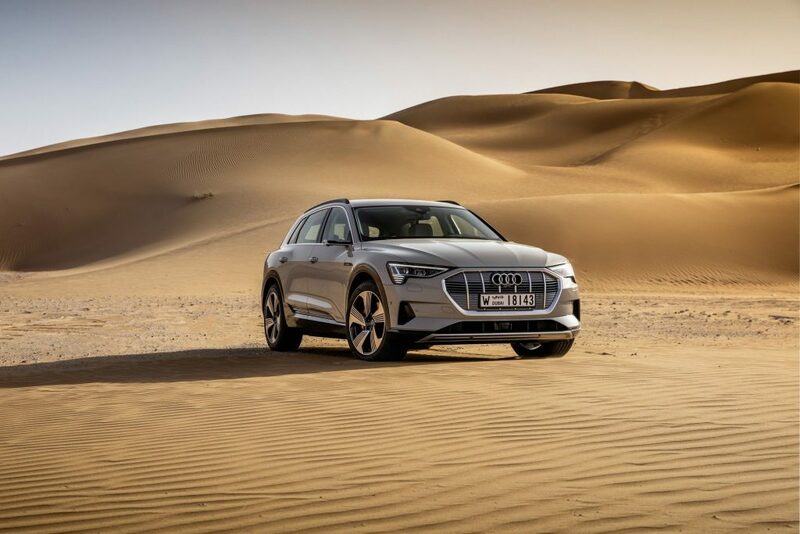 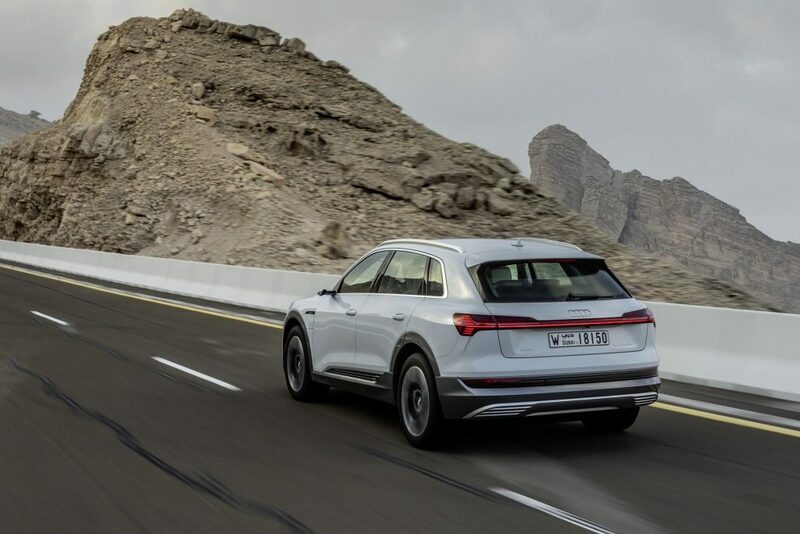 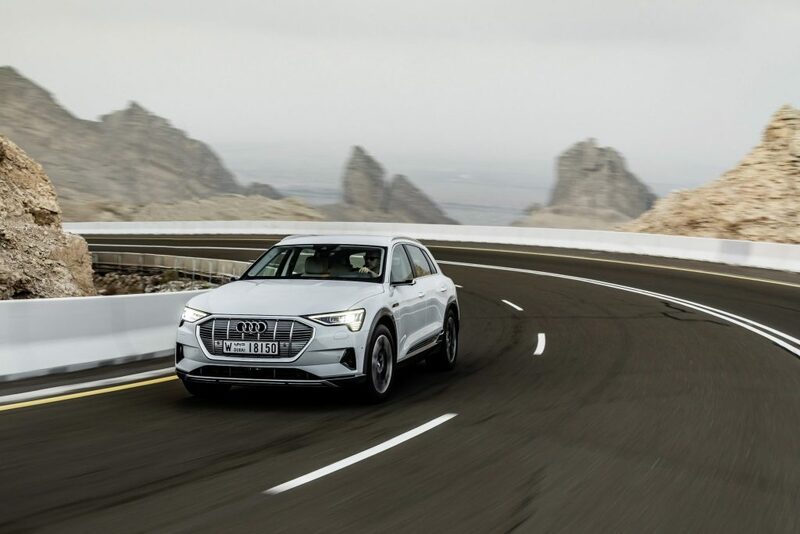 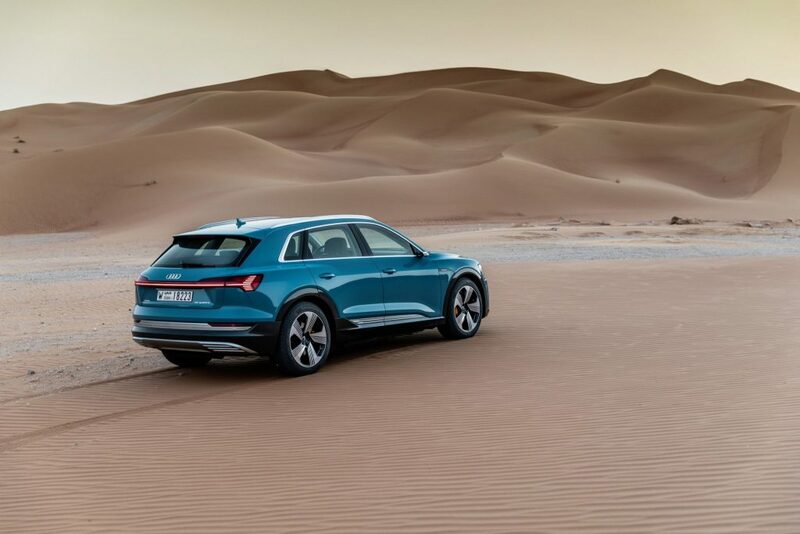 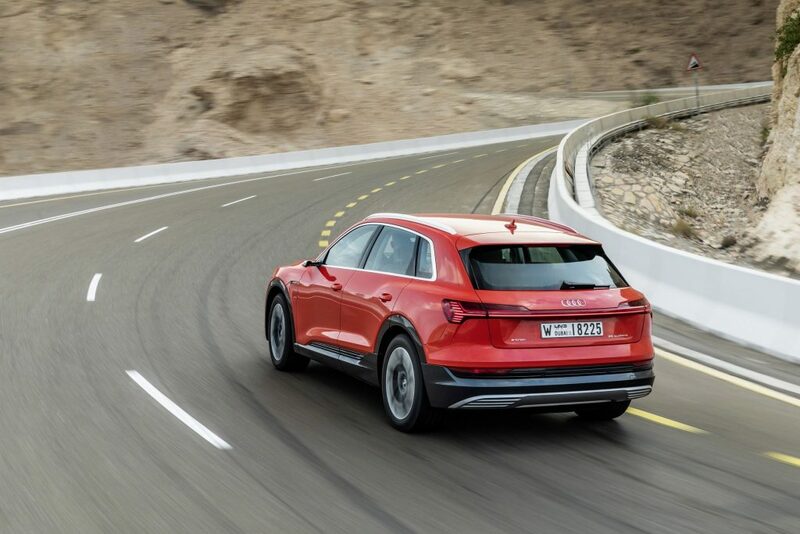 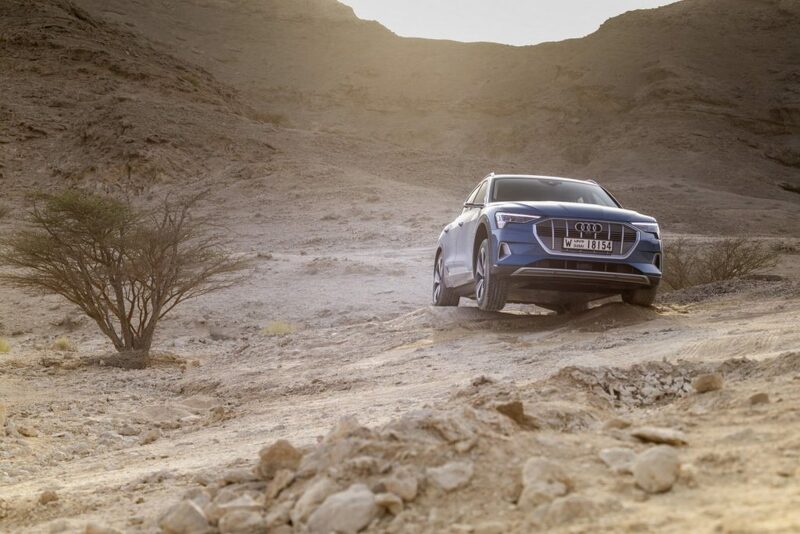 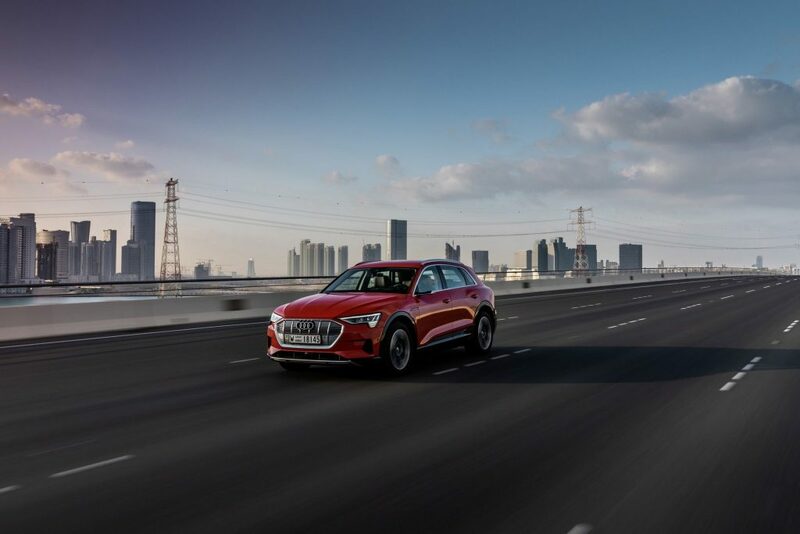 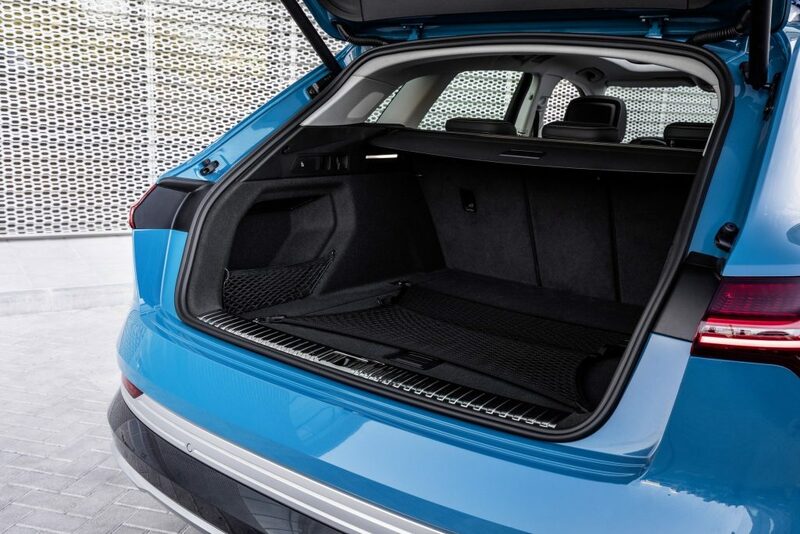 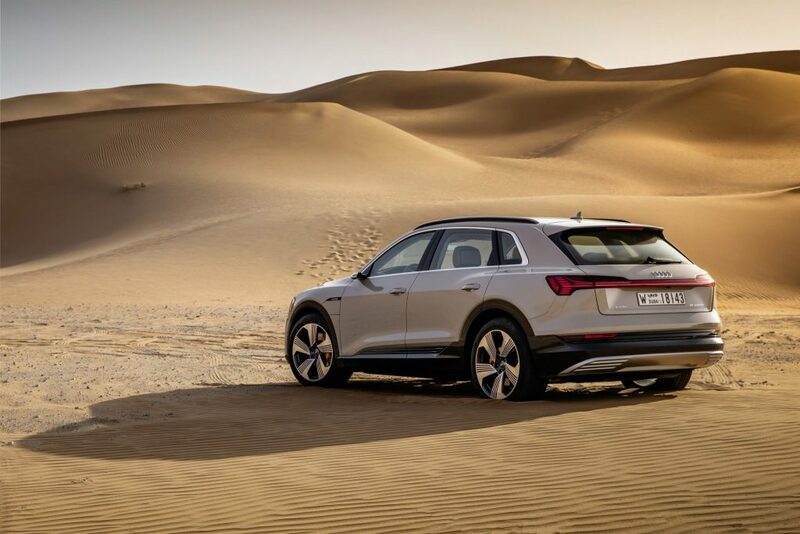 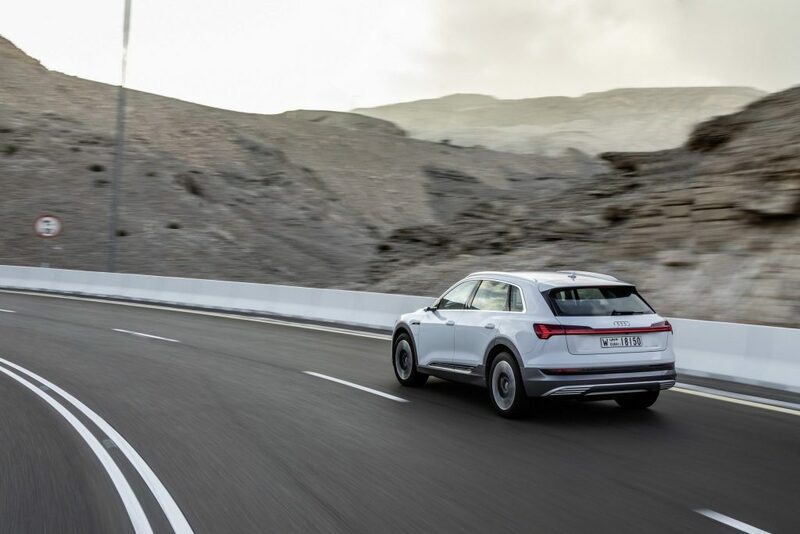 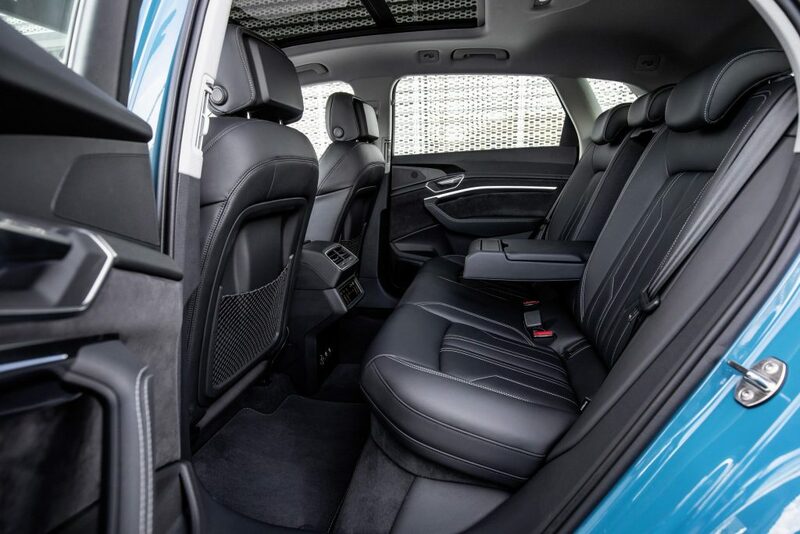 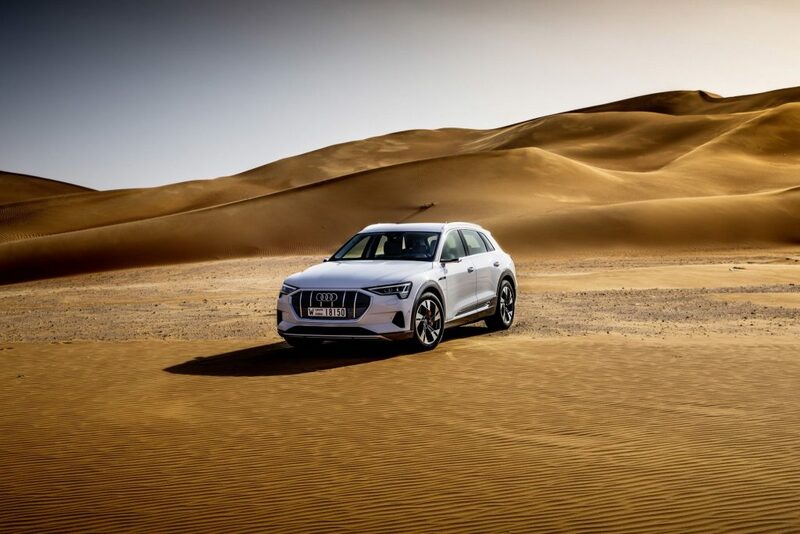 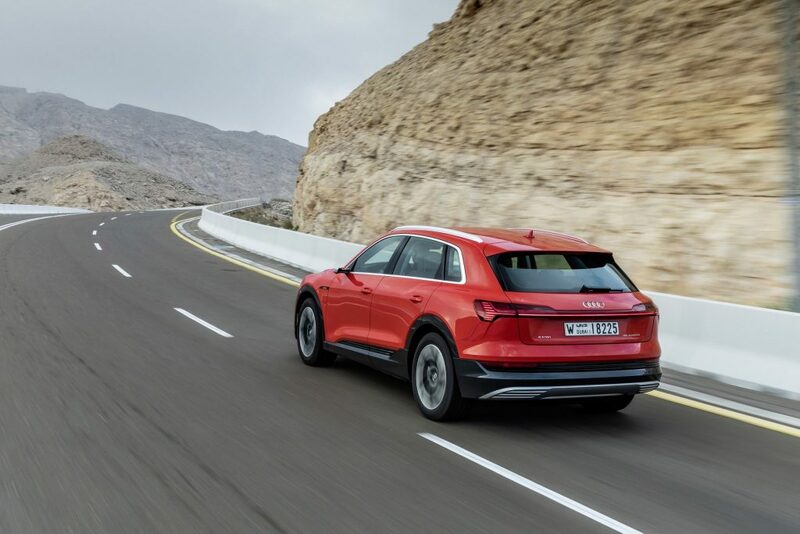 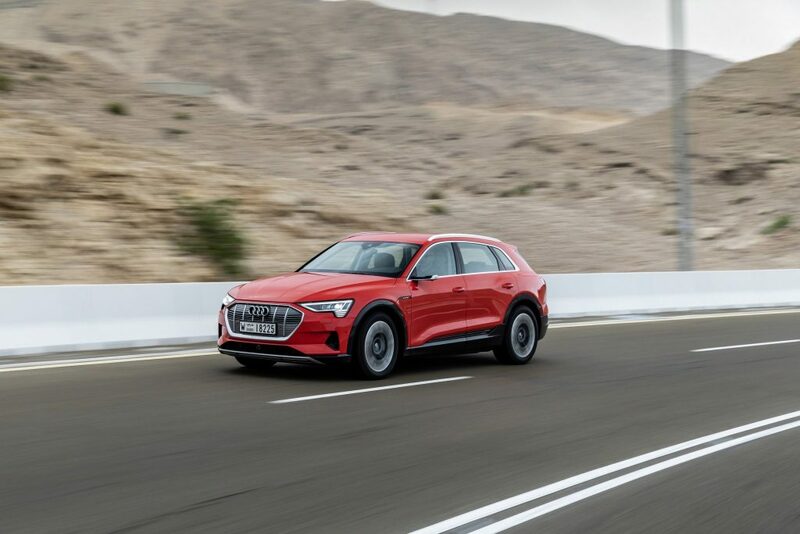 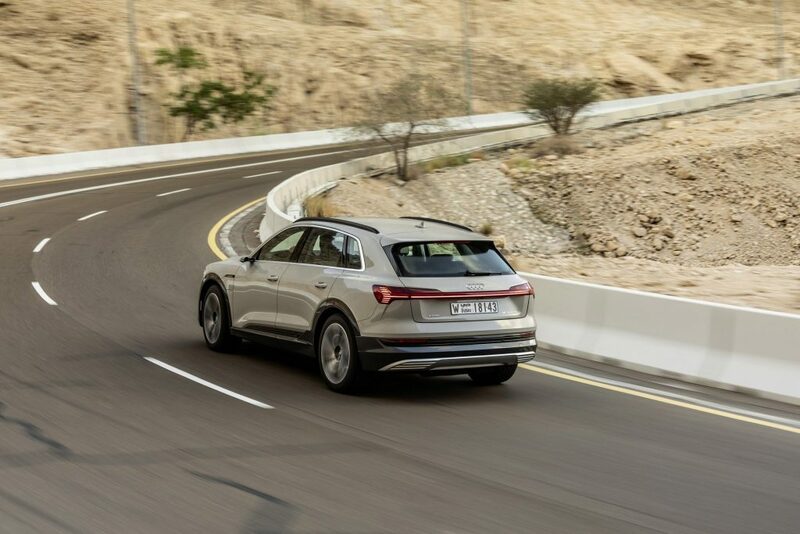 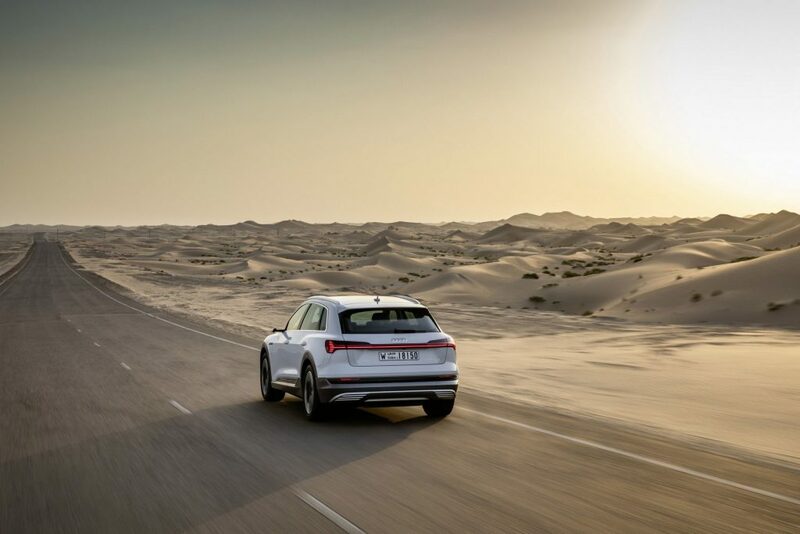 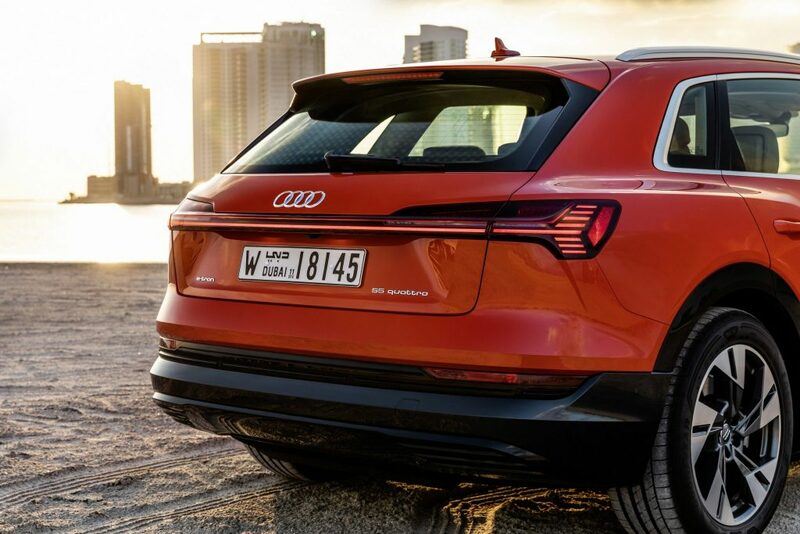 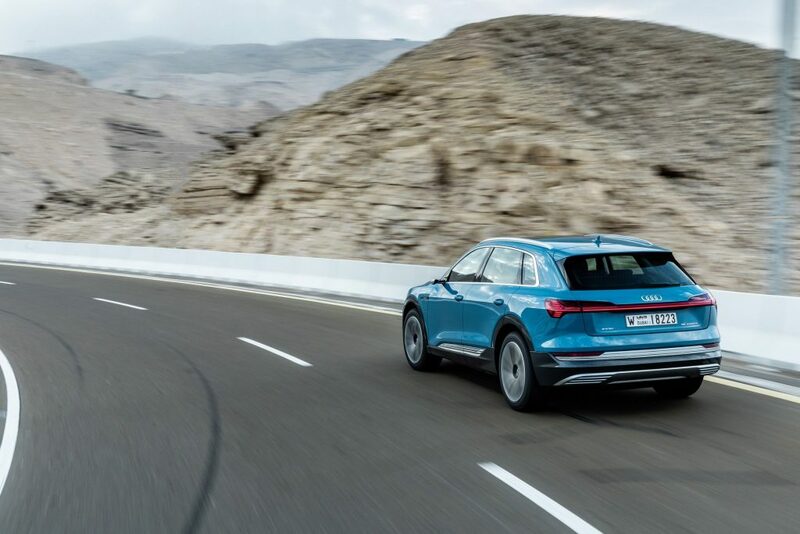 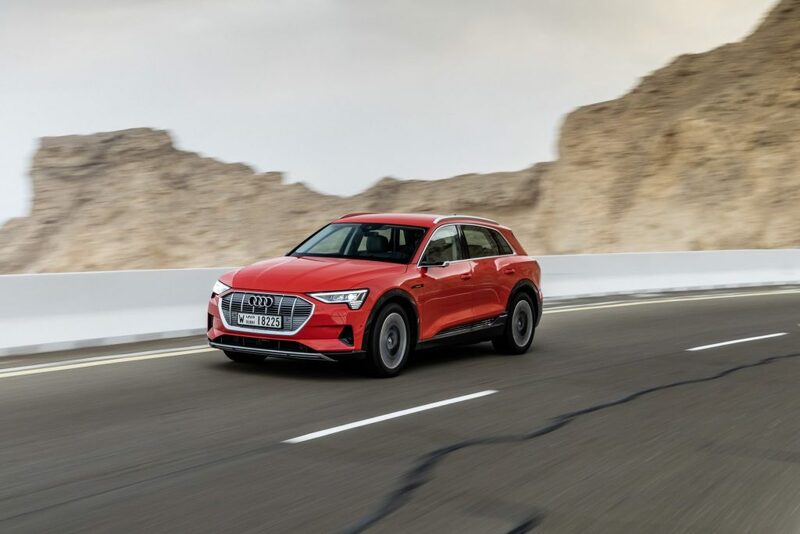 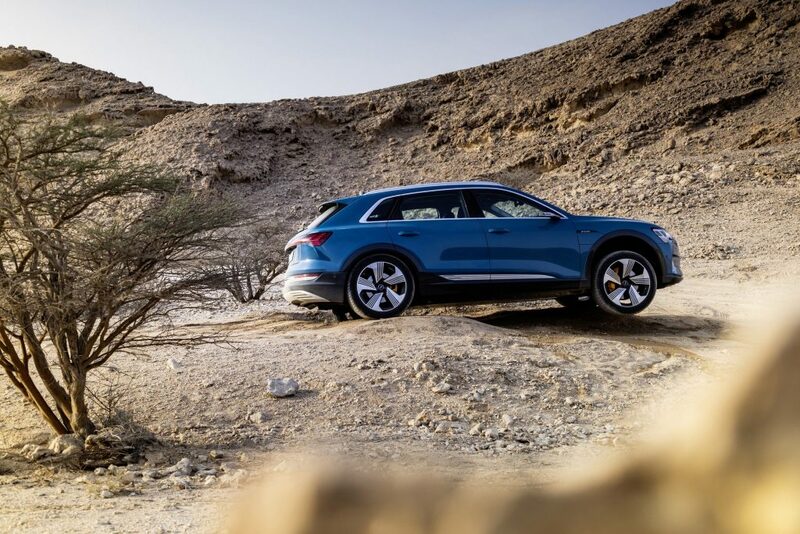 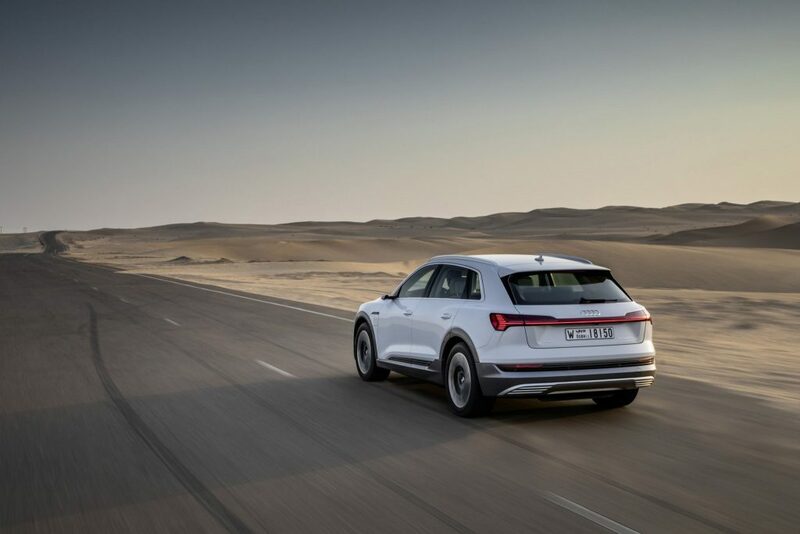 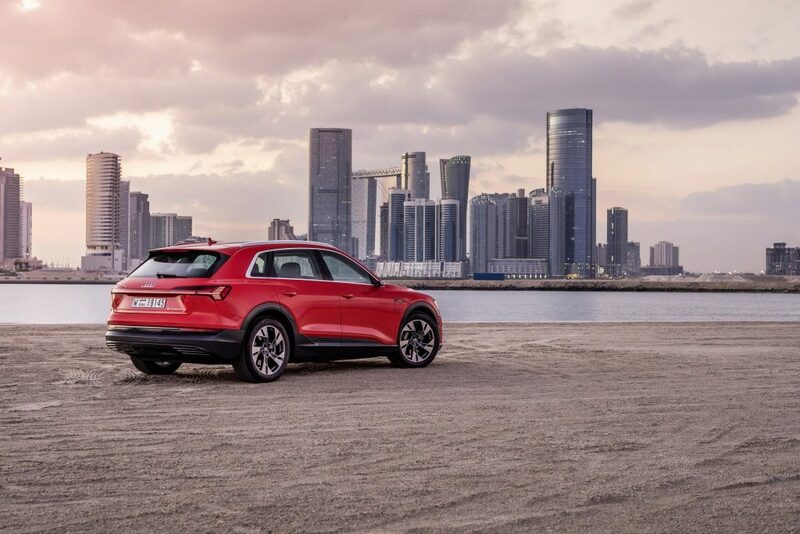 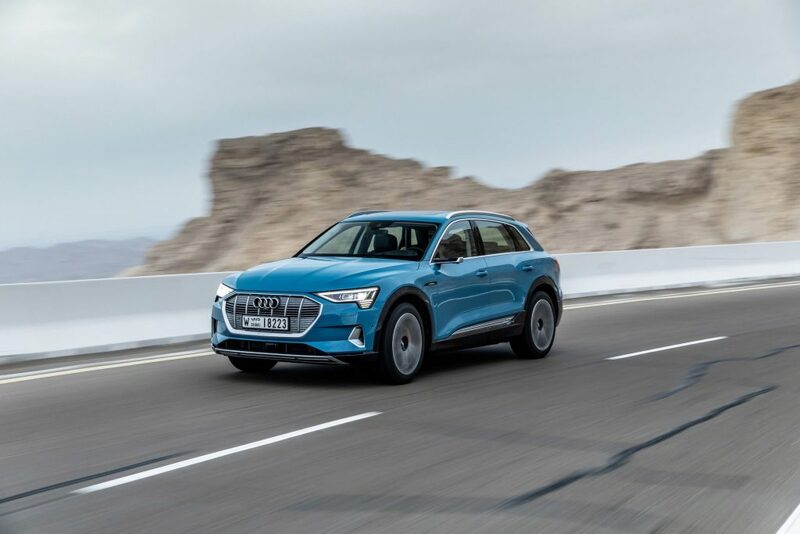 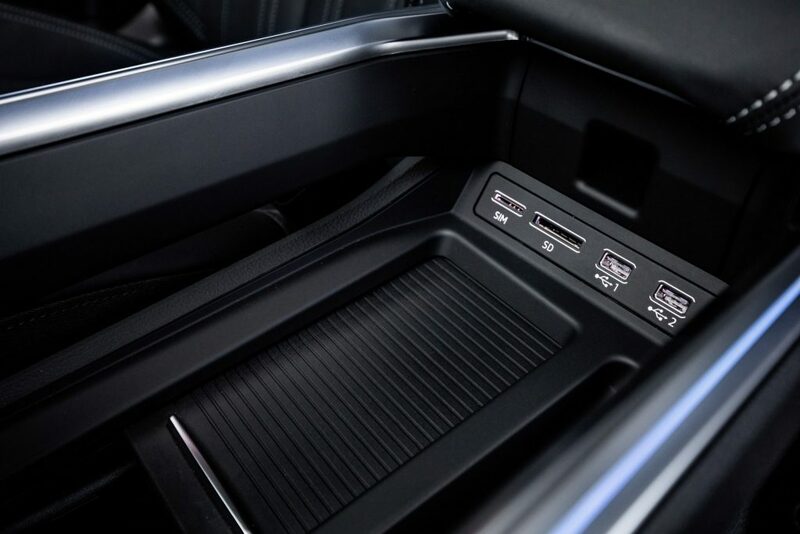 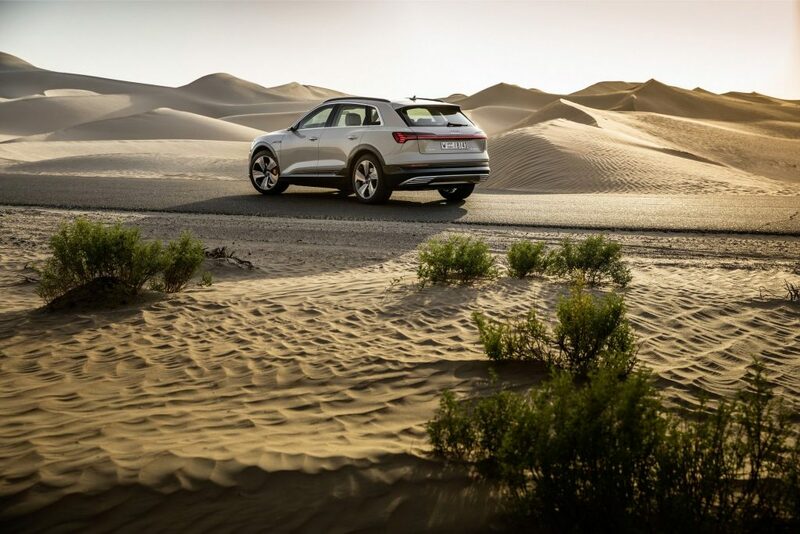 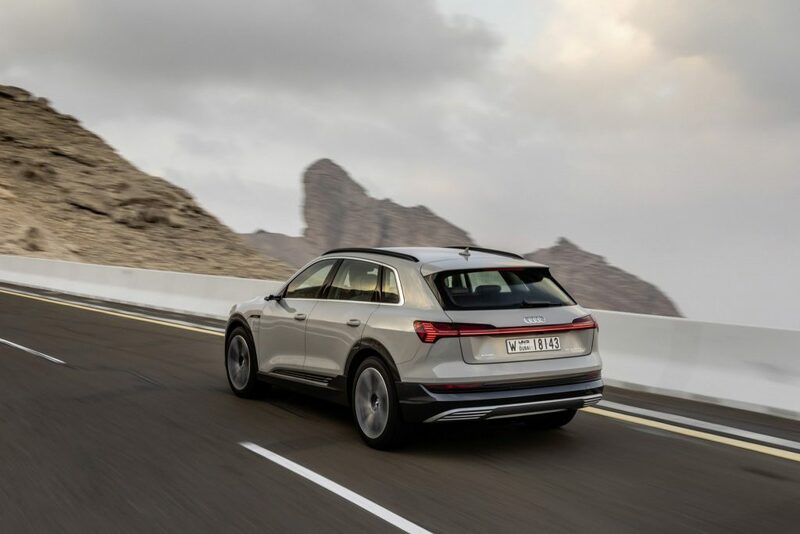 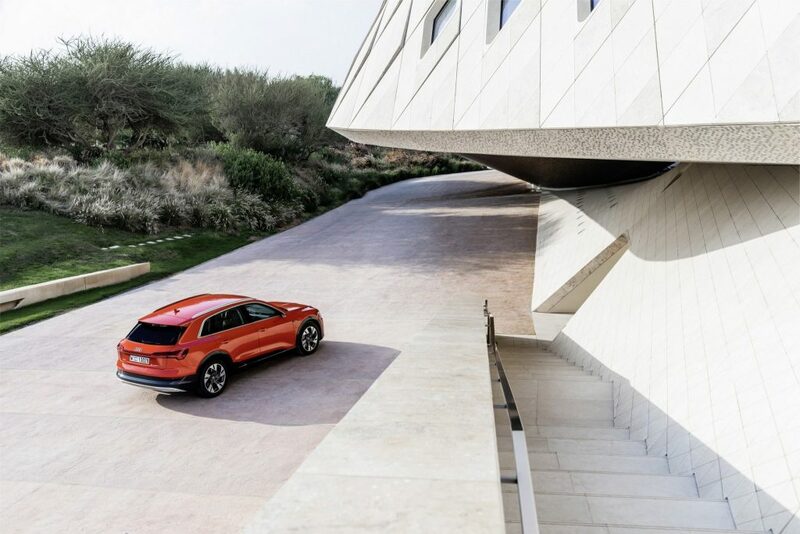 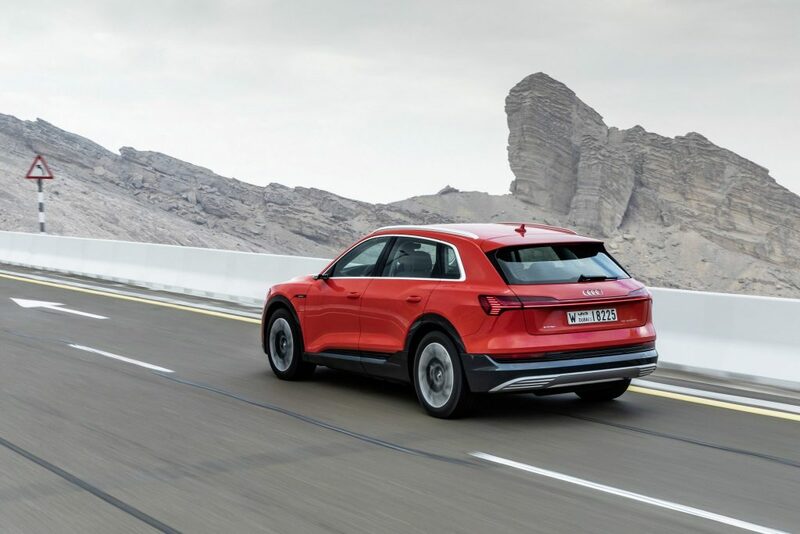 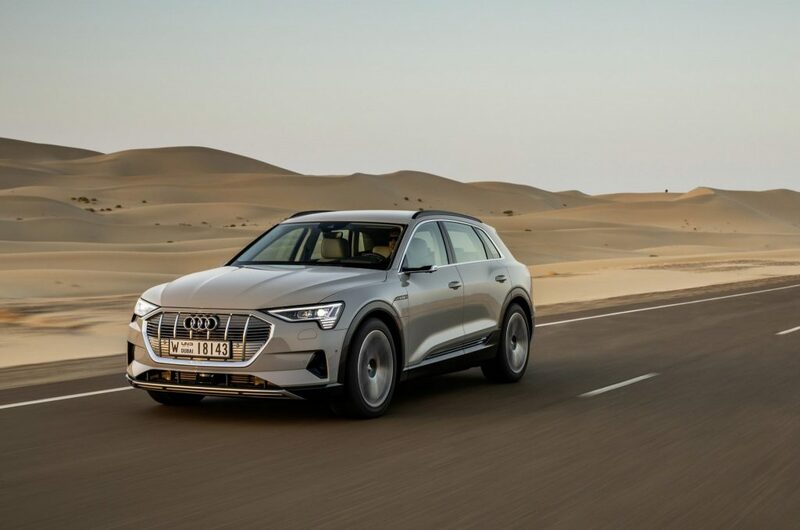 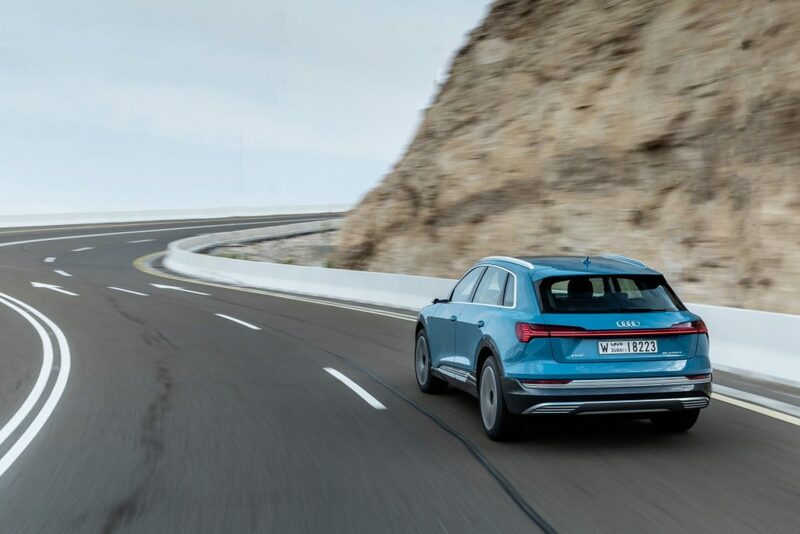 On off-road terrain, the Audi e-tron’s ground clearance is raised by 50 millimeters (2.0 in) at the touch of a button, while on highway stretches the vehicle body is lowered by up to 26 millimeters (1.0 in). 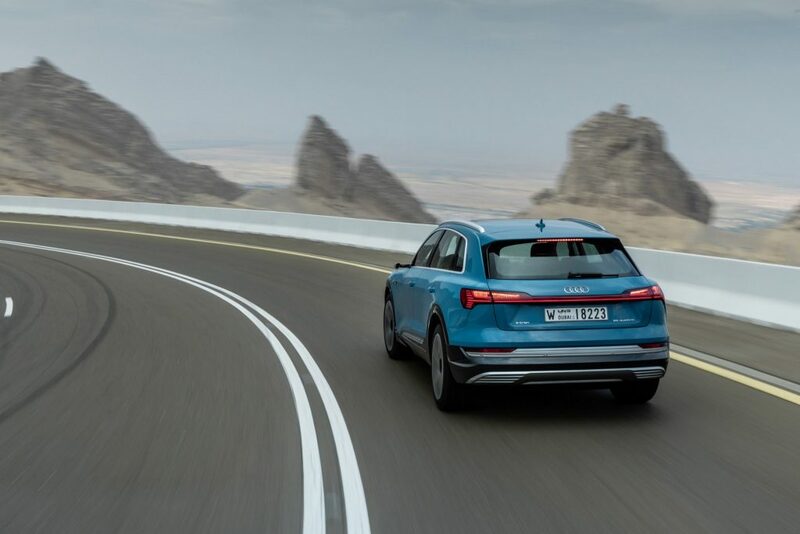 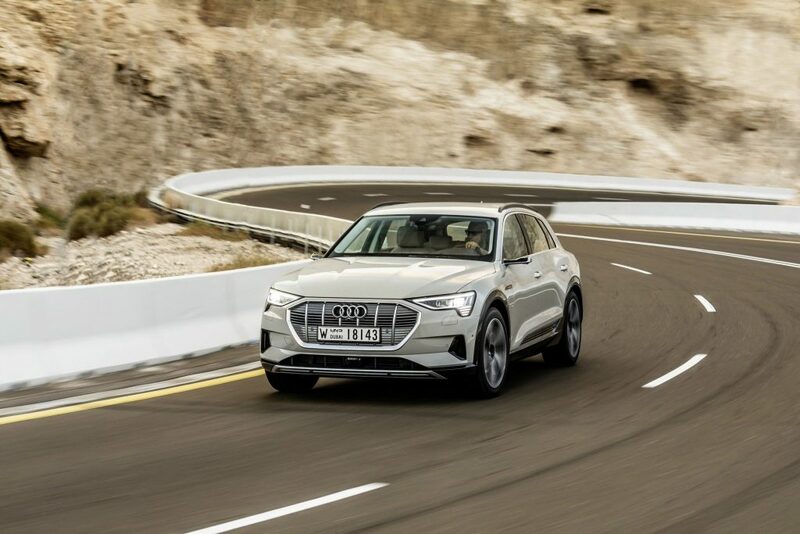 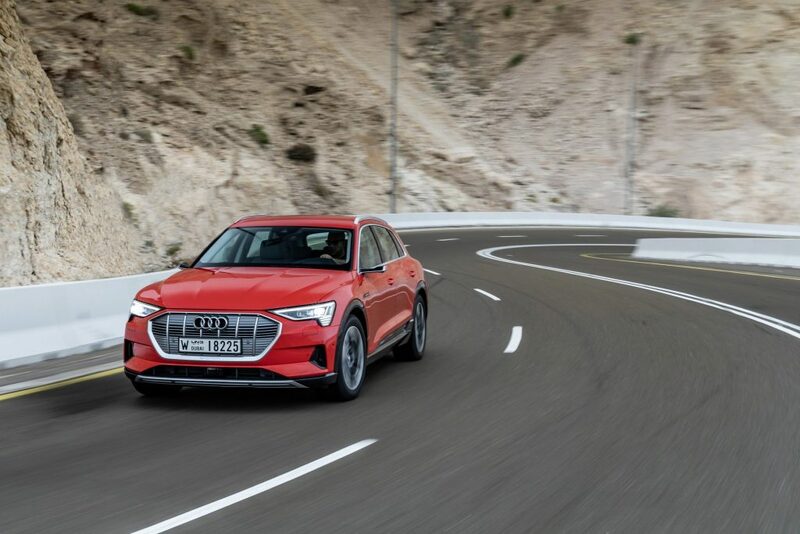 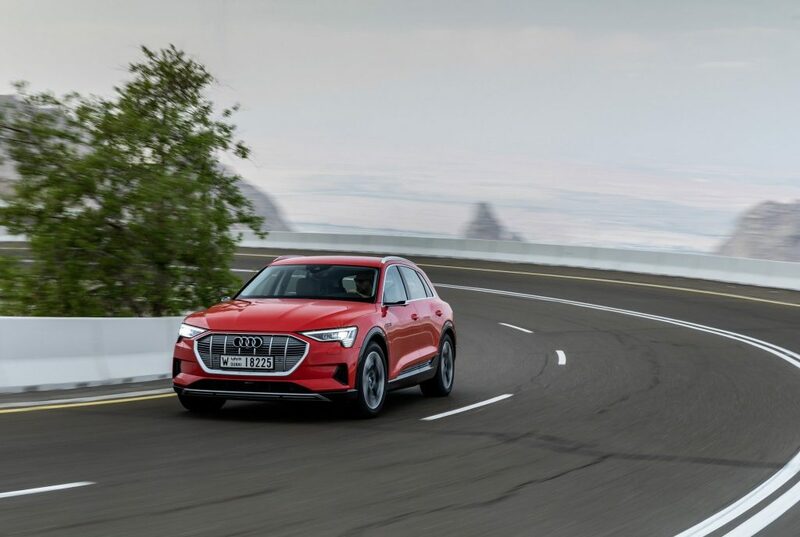 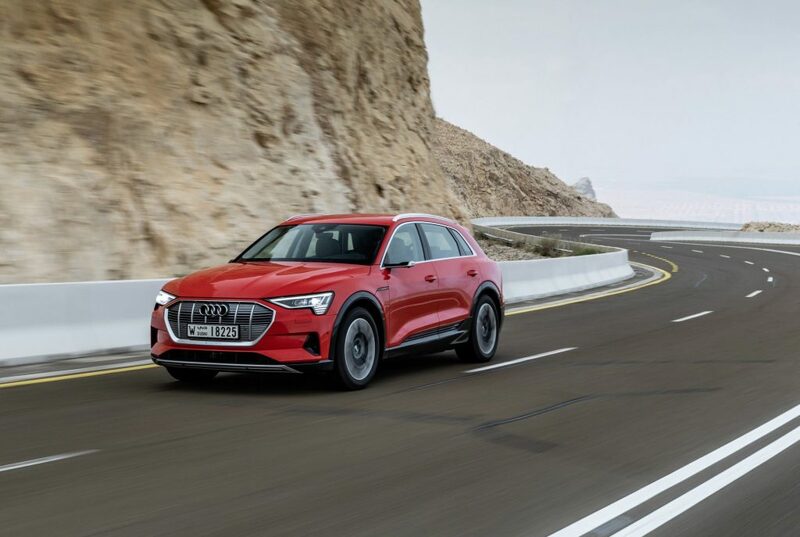 In addition, the central chassis control unit individually controls the shock absorbers at each wheel at millisecond intervals – according to the road condition, driving style and the mode set in Audi drive select. 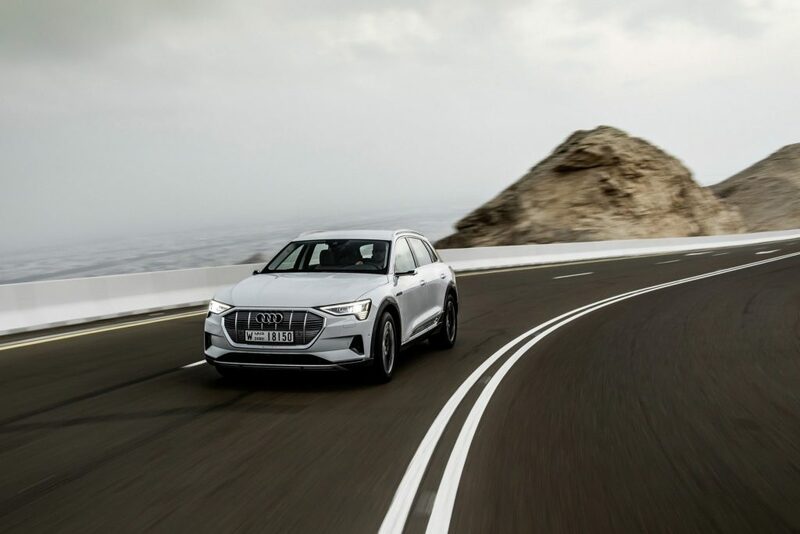 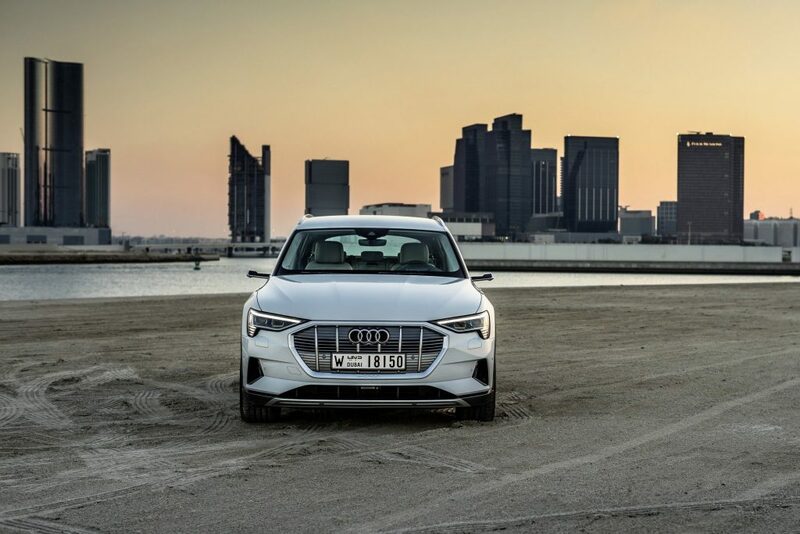 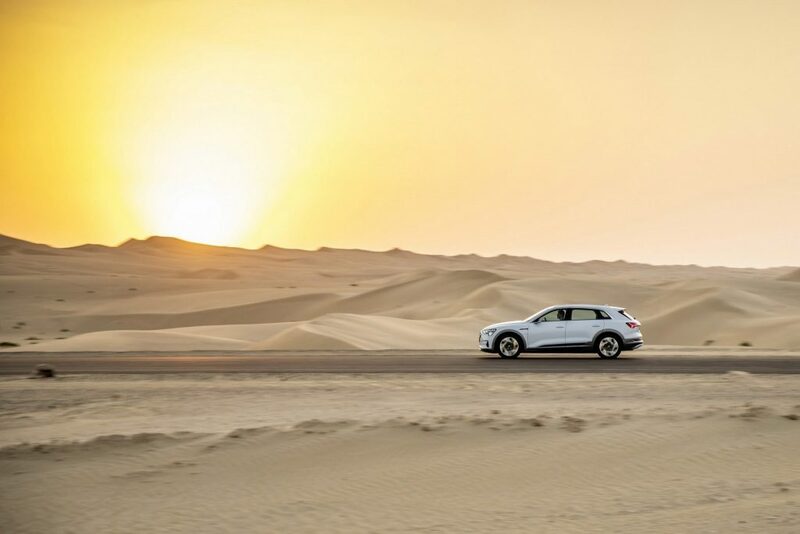 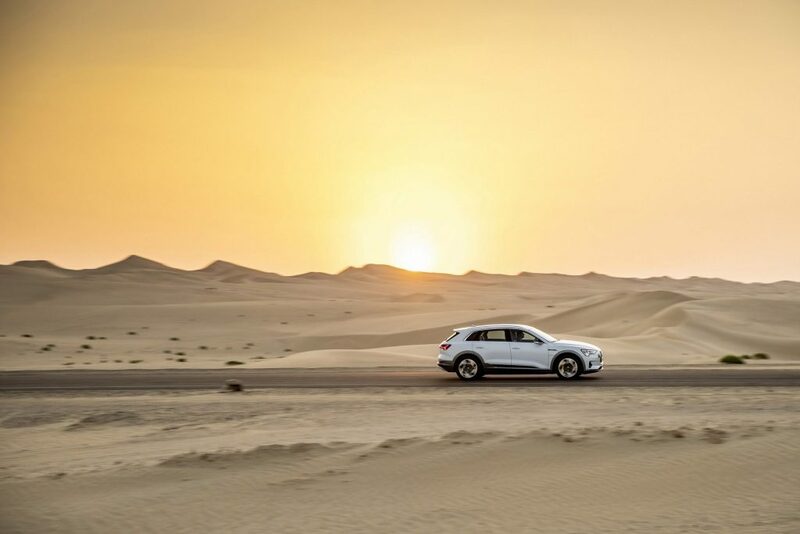 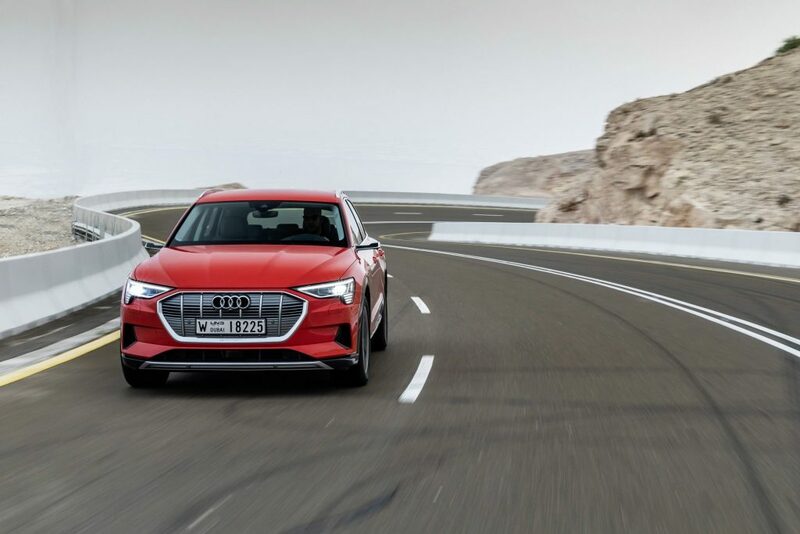 Whether you want relaxed touring, dynamic cornering or excursions away from paved roads, with its broad range stretching from smooth ride comfort to sporty and stable handling, the Audi e-tron is a genuine all-rounder.